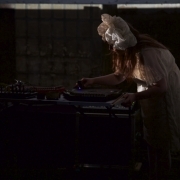 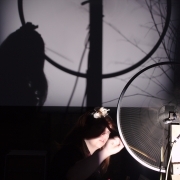 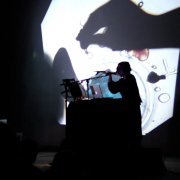 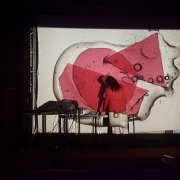 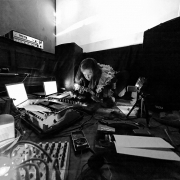 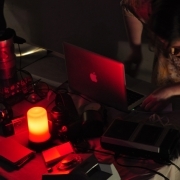 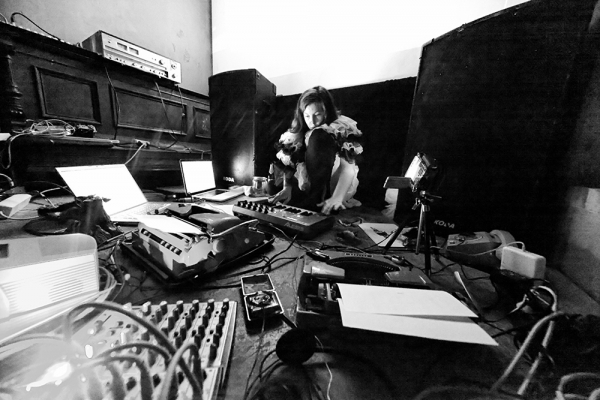 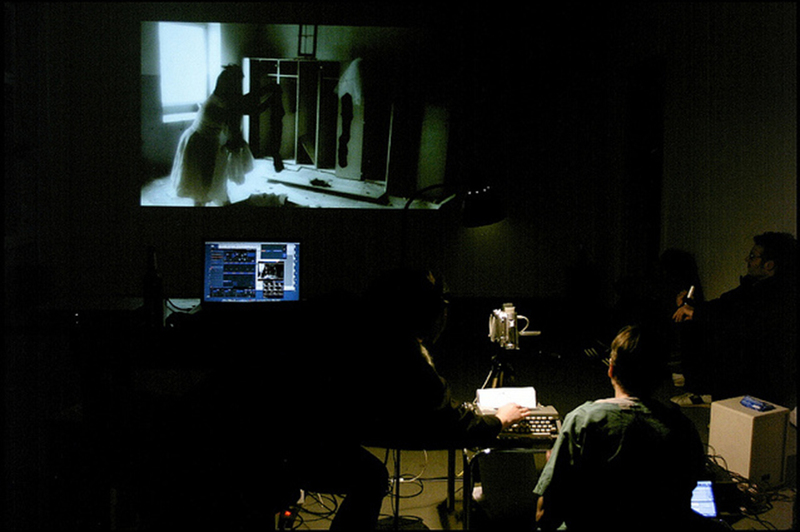 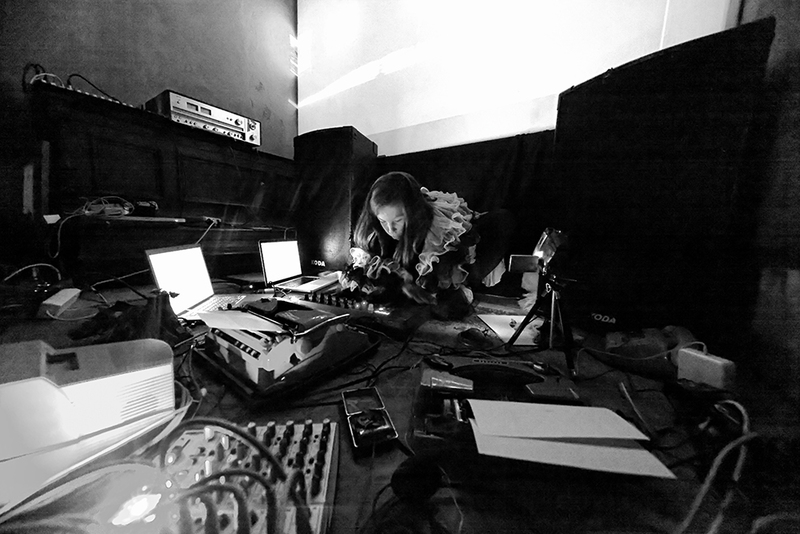 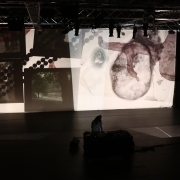 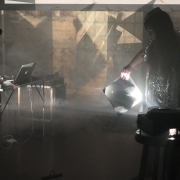 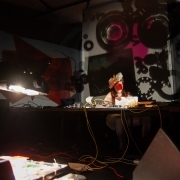 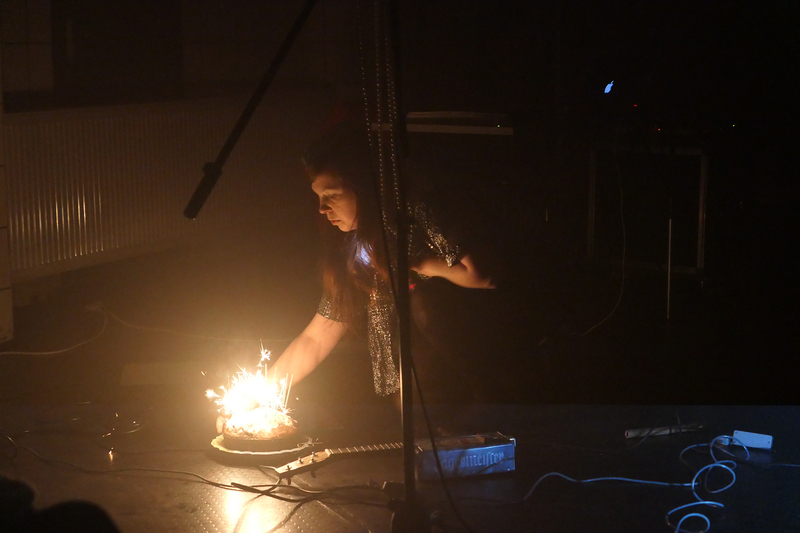 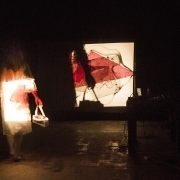 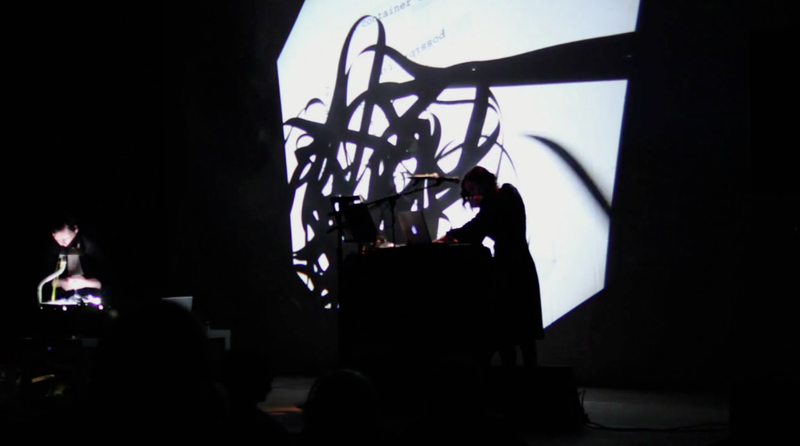 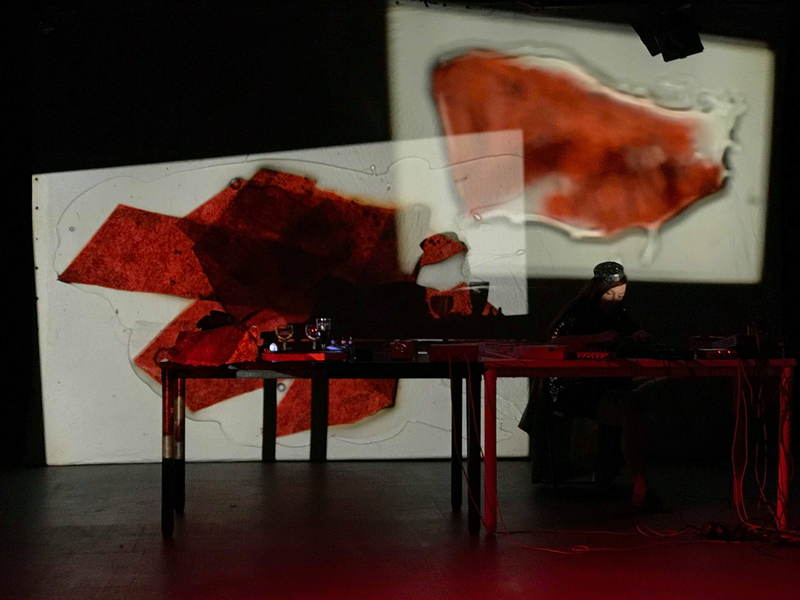 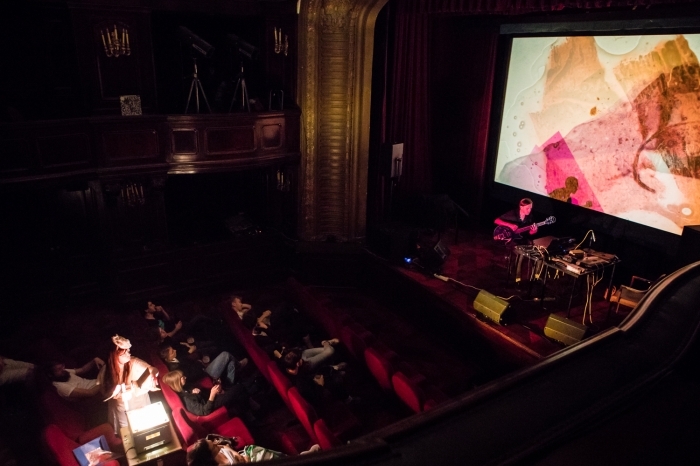 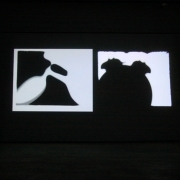 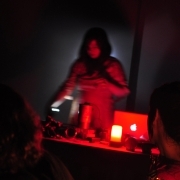 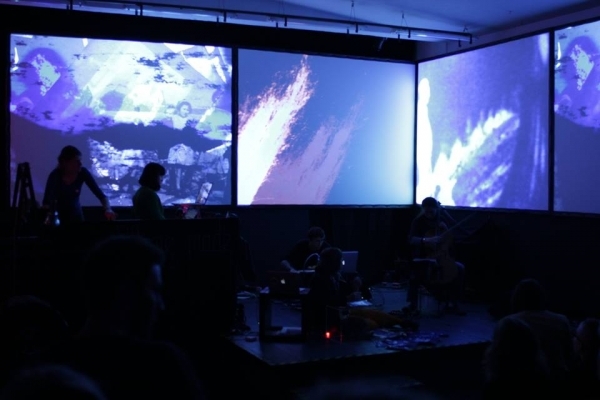 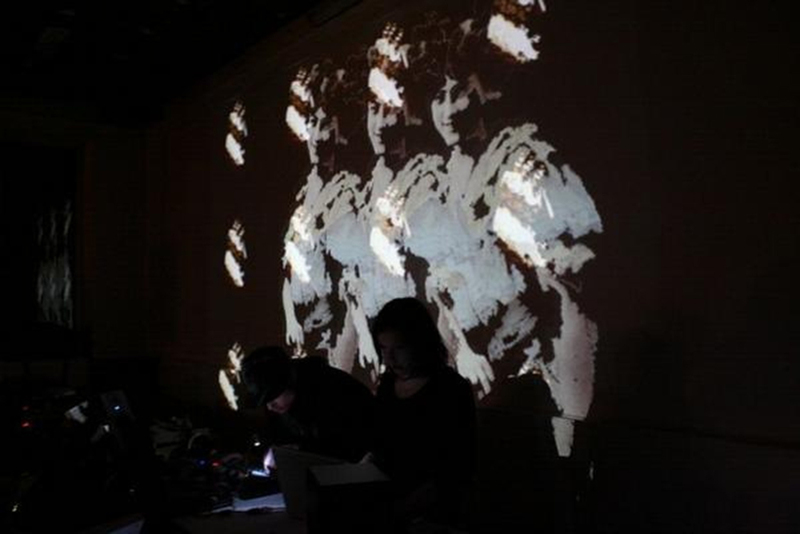 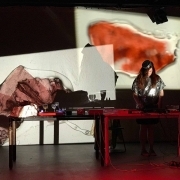 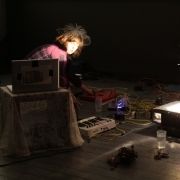 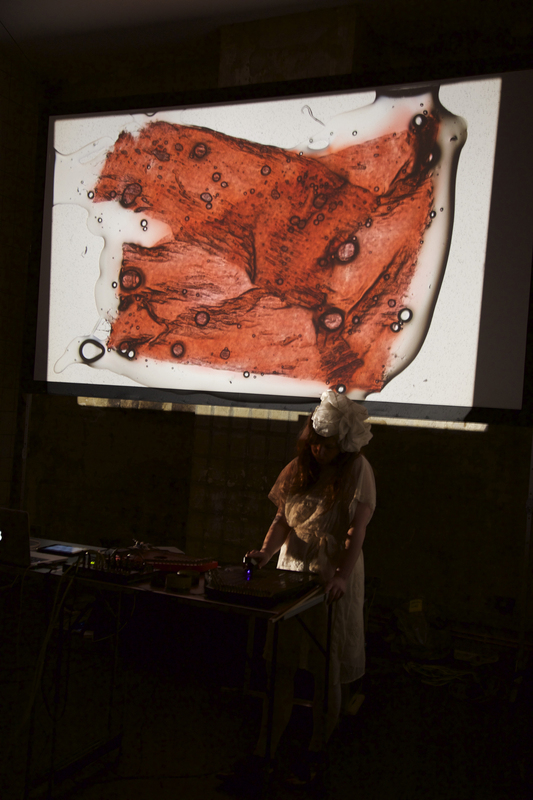 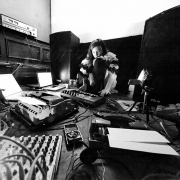 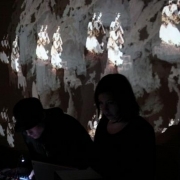 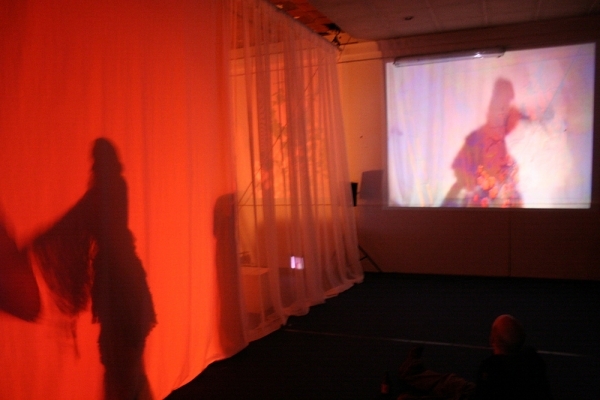 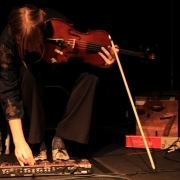 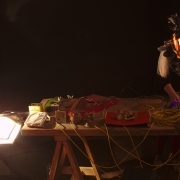 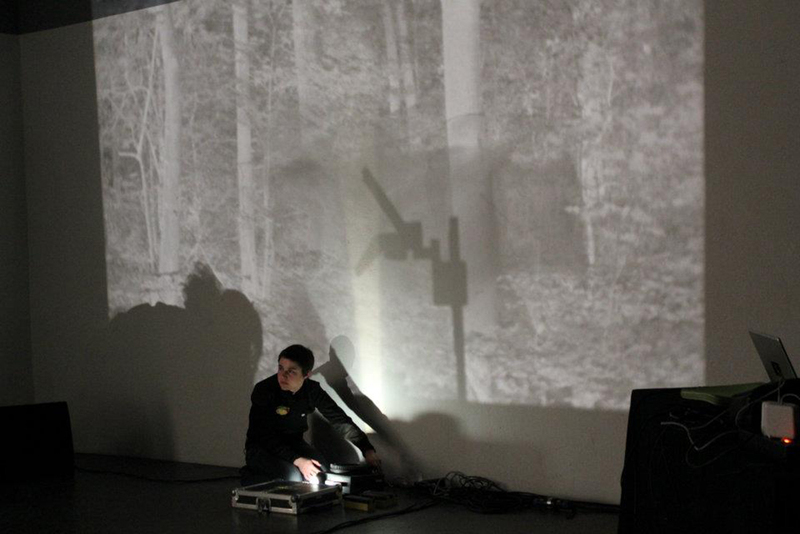 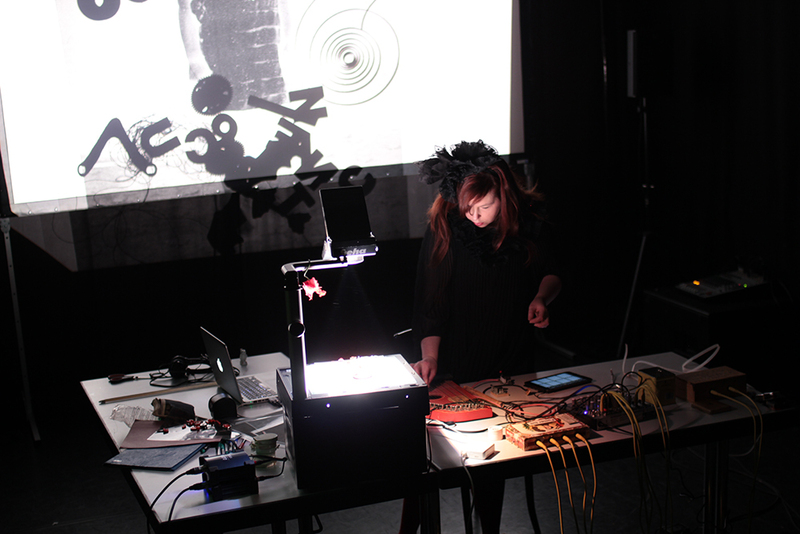 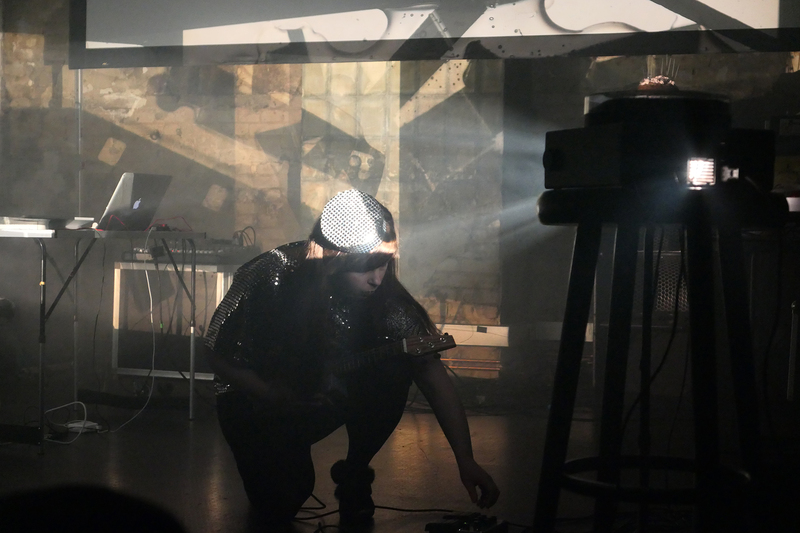 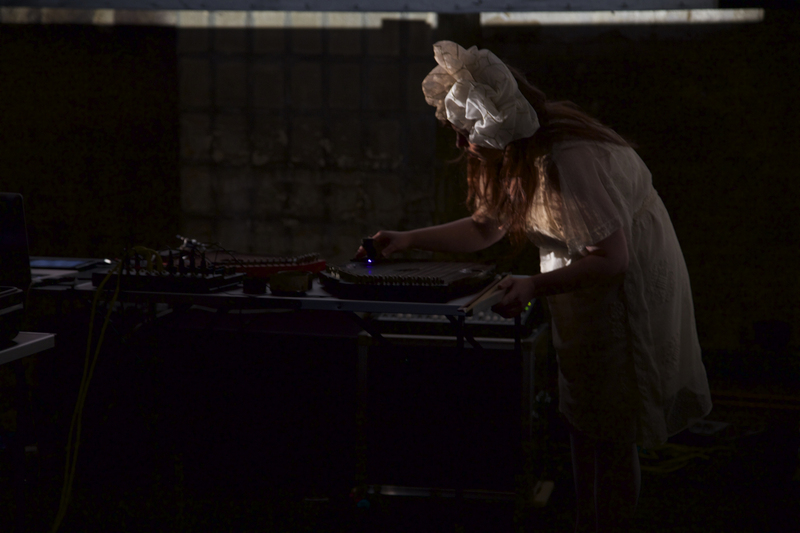 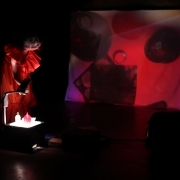 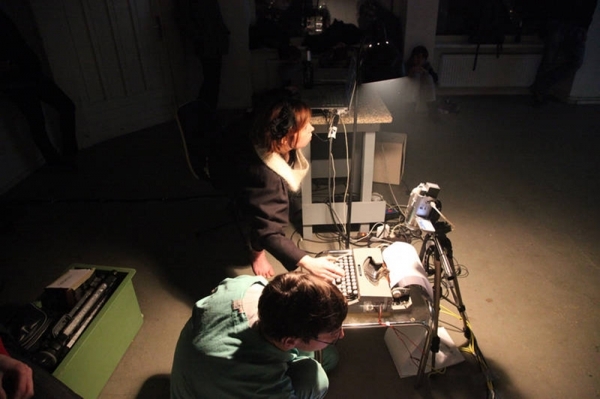 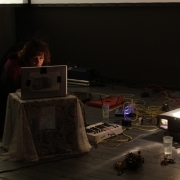 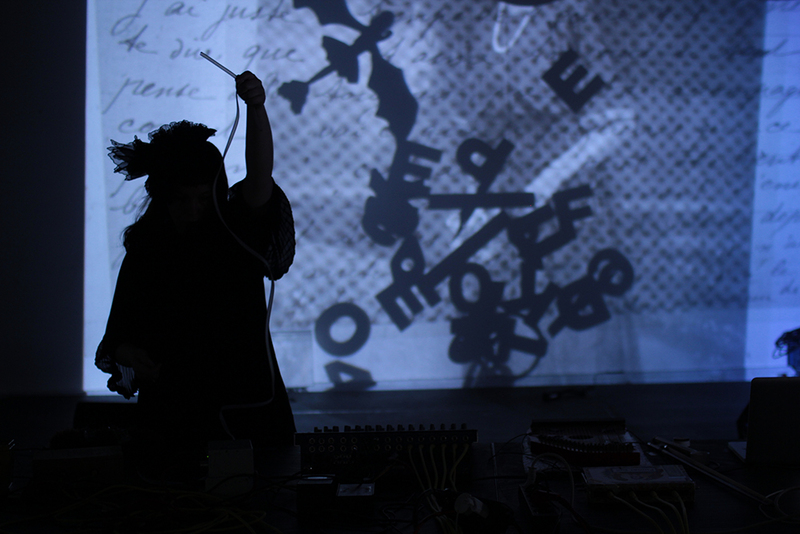 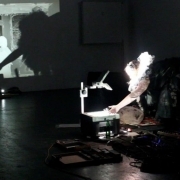 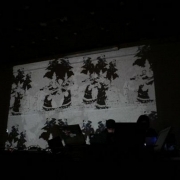 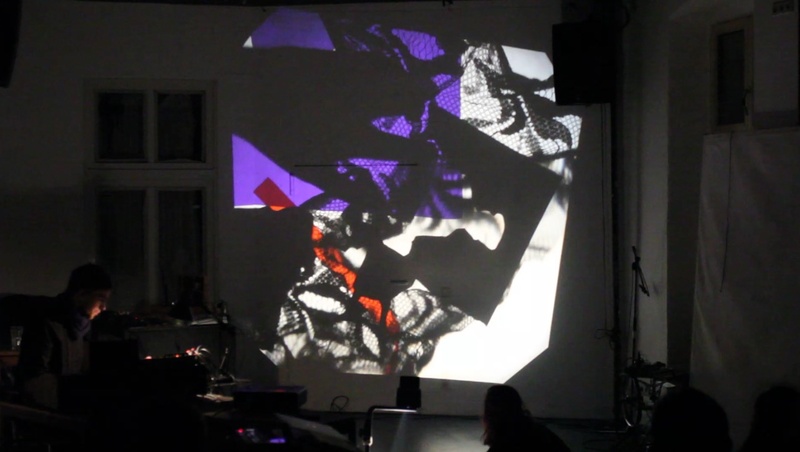 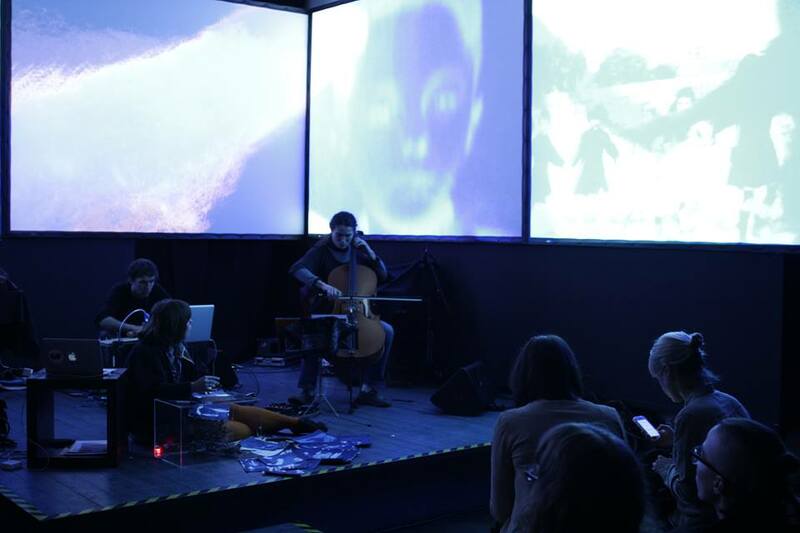 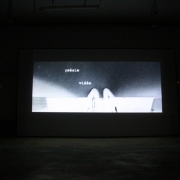 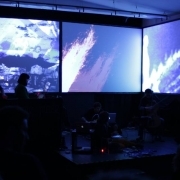 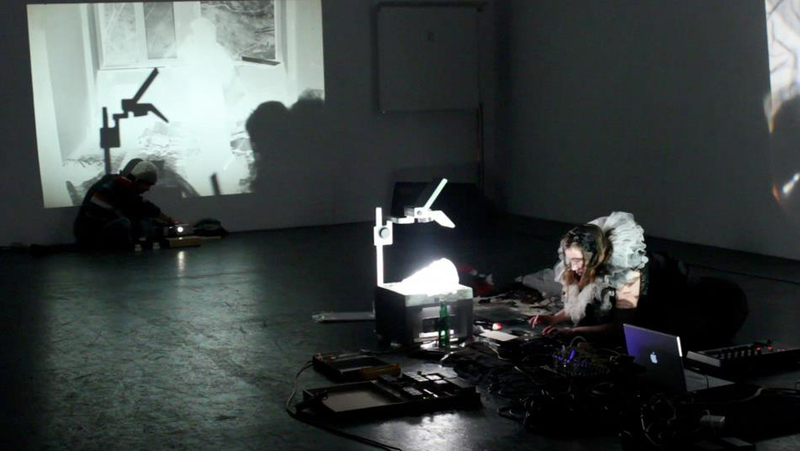 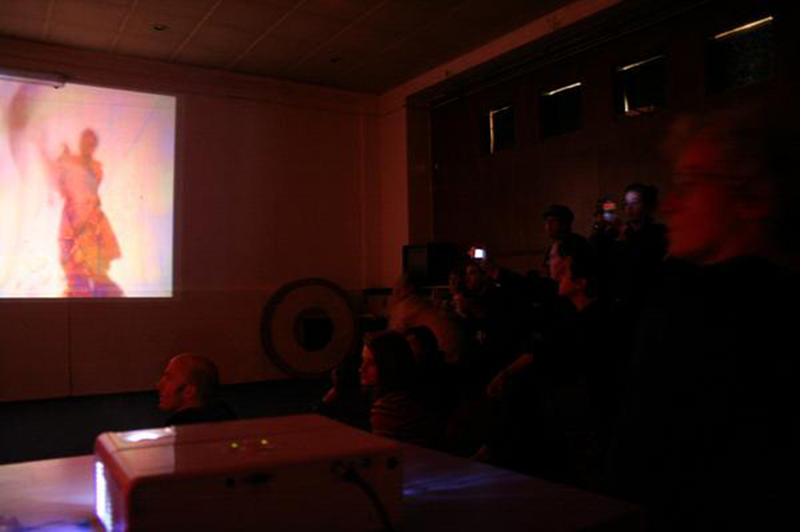 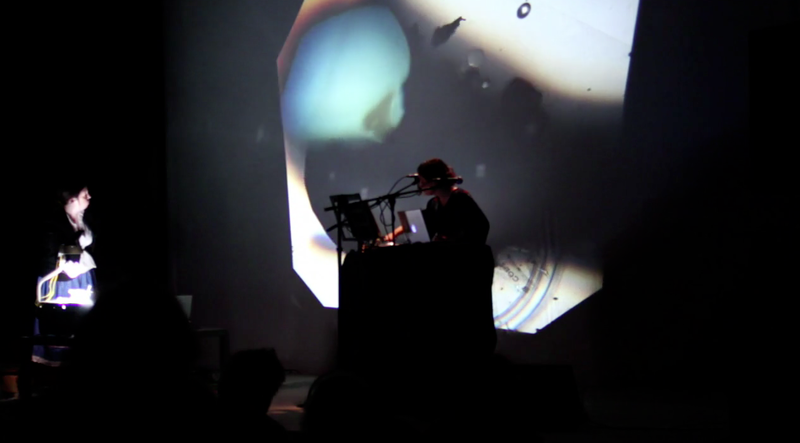 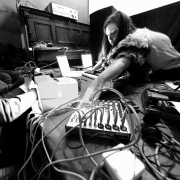 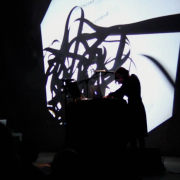 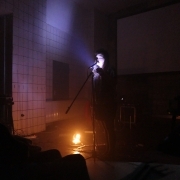 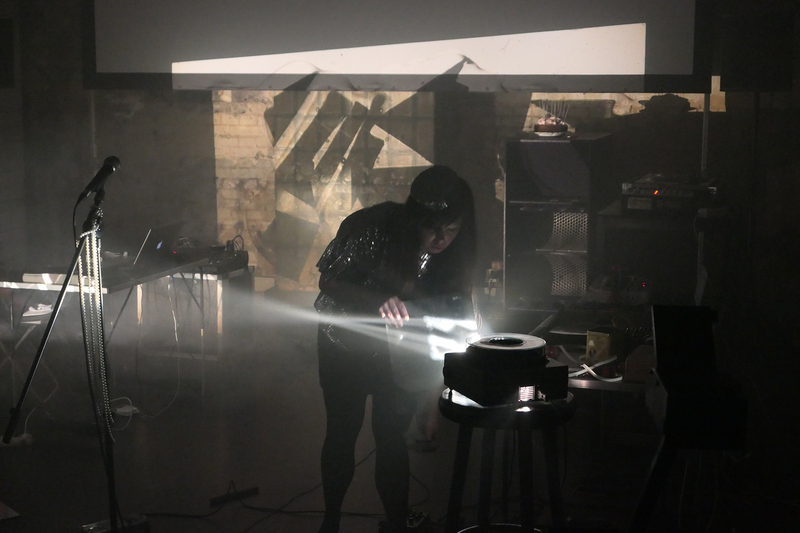 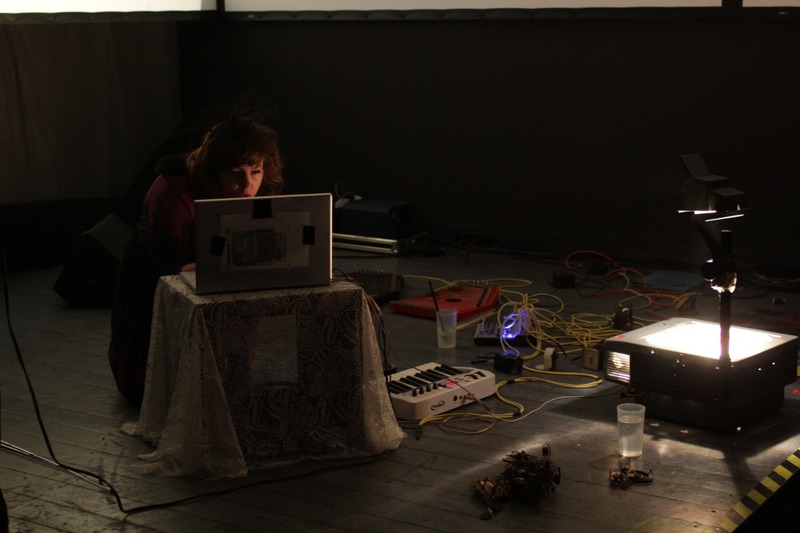 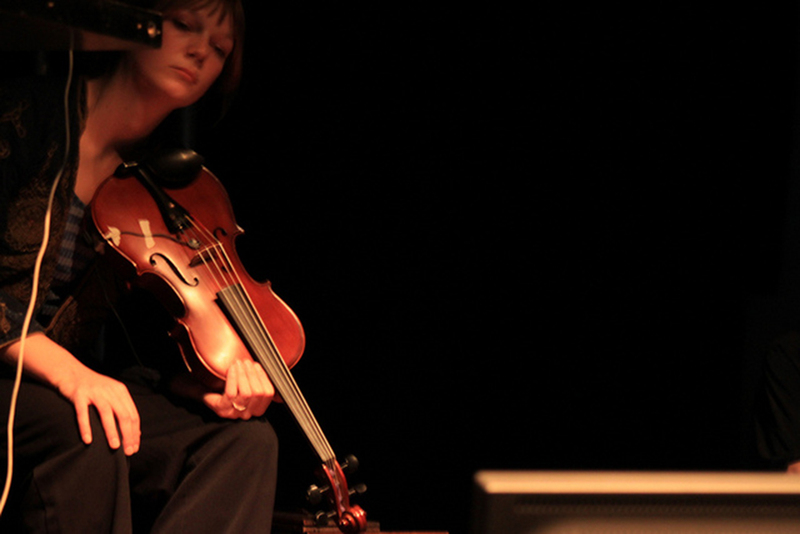 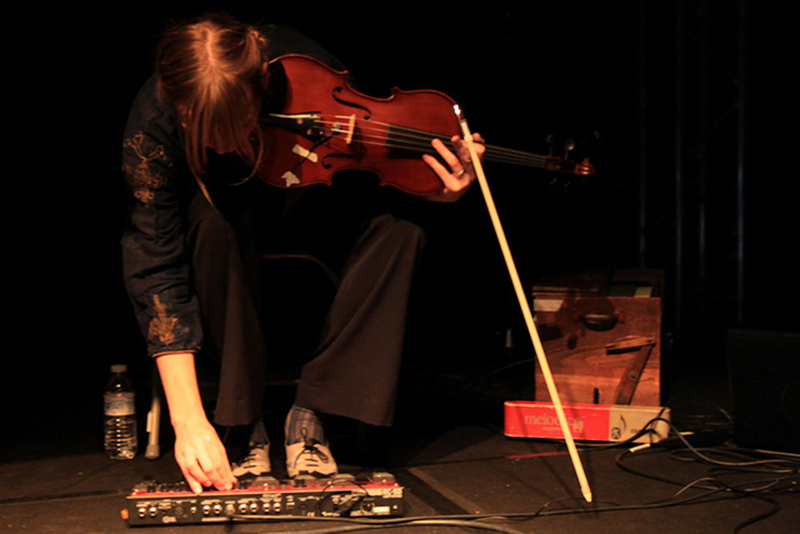 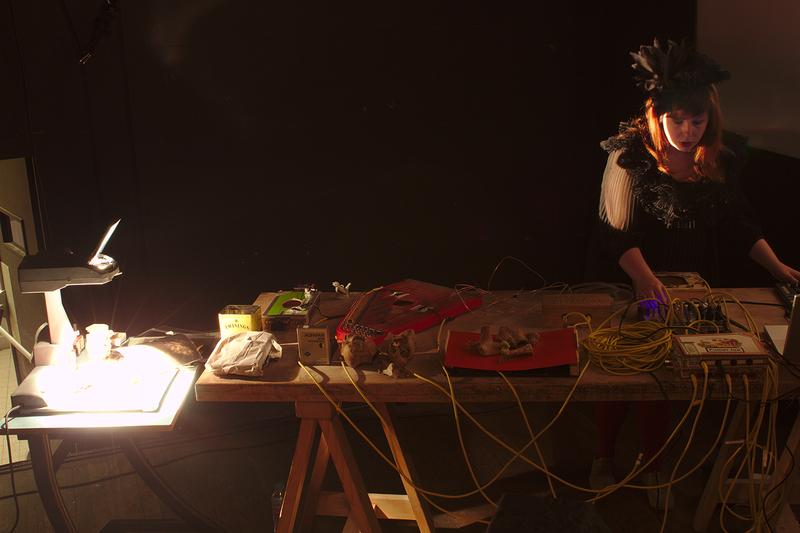 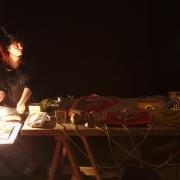 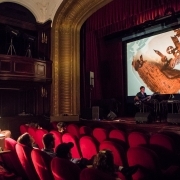 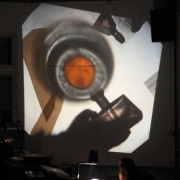 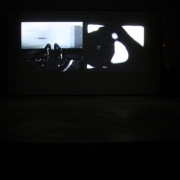 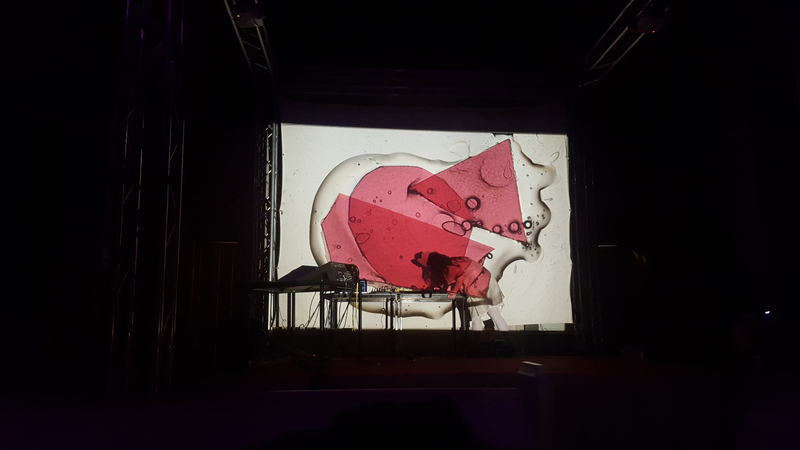 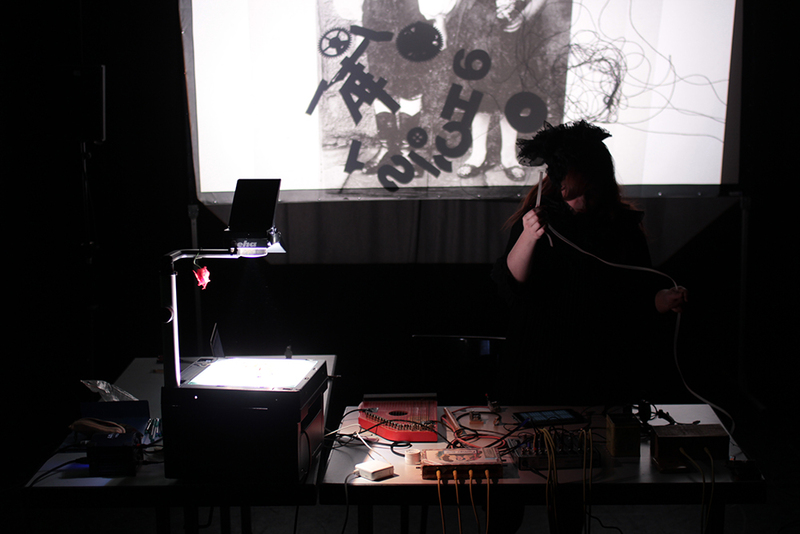 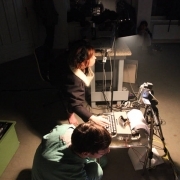 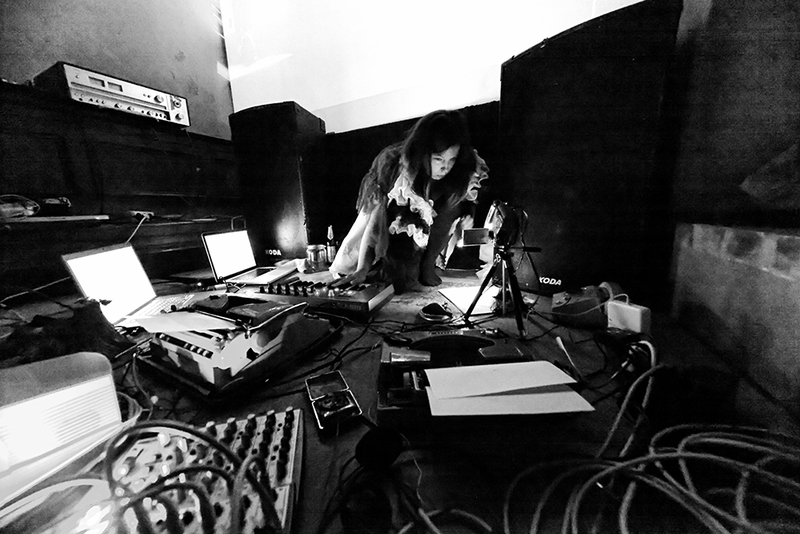 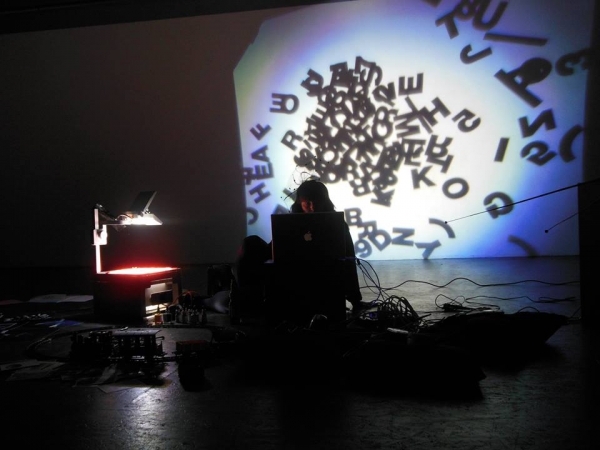 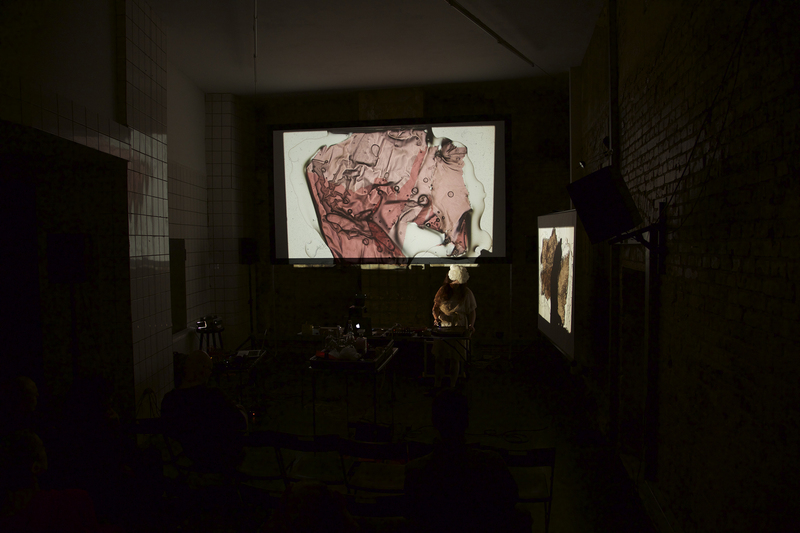 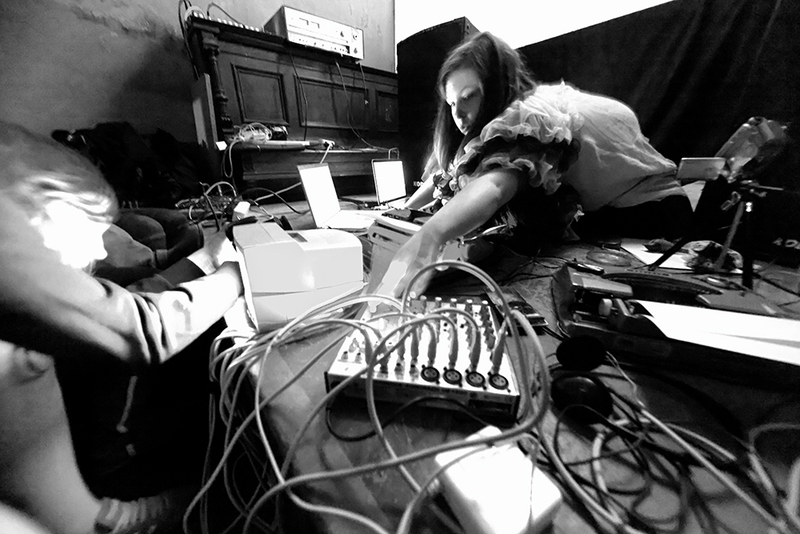 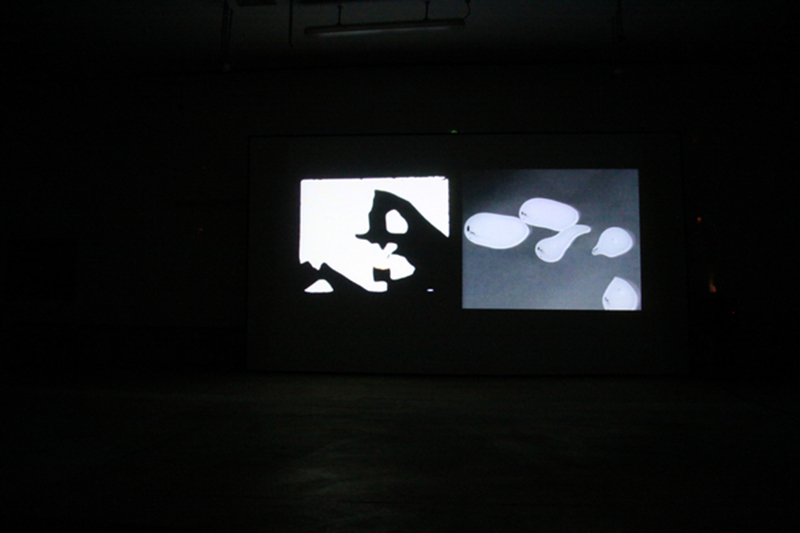 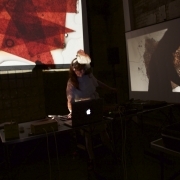 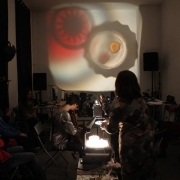 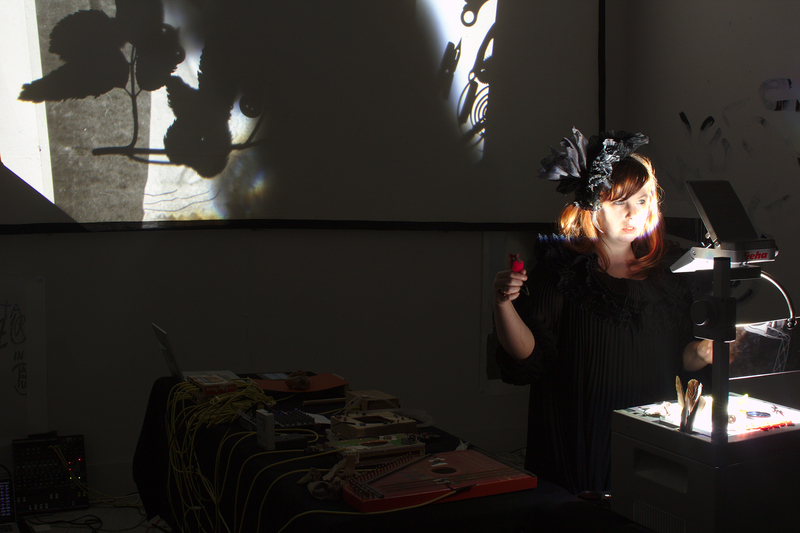 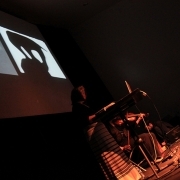 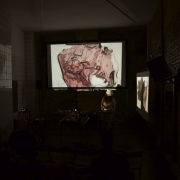 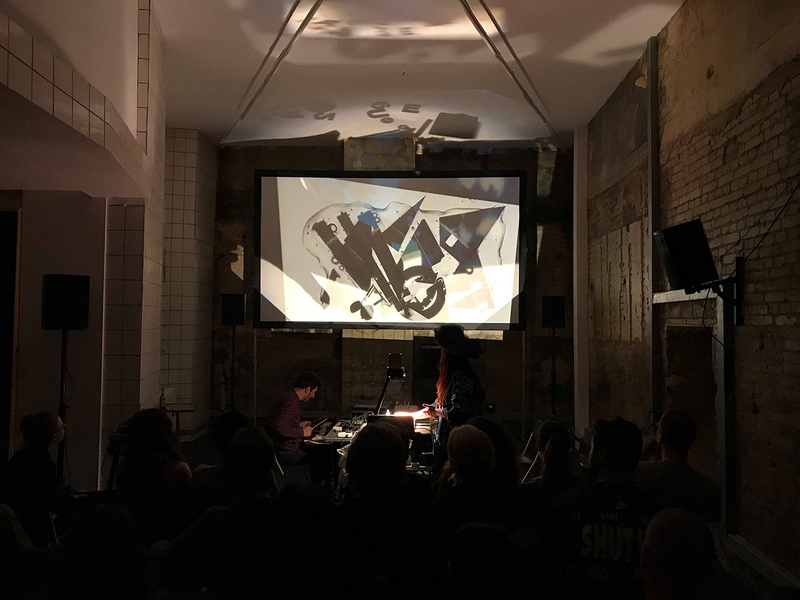 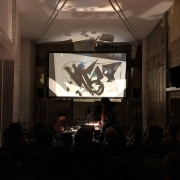 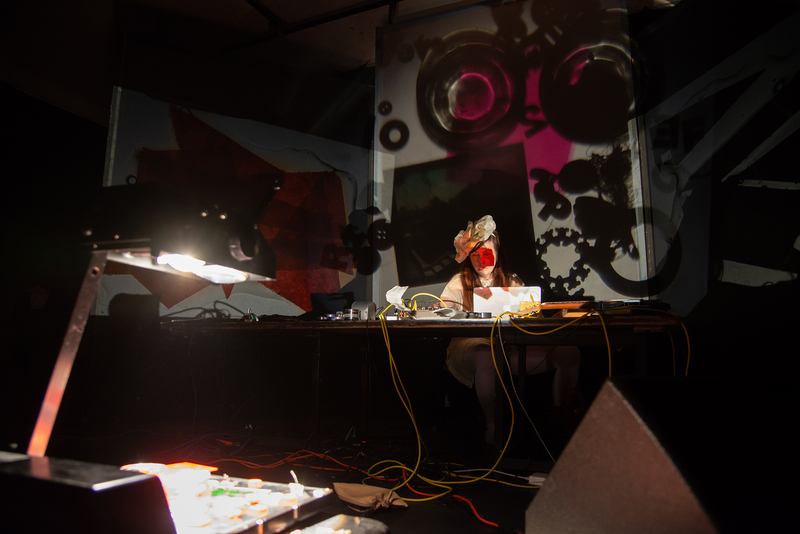 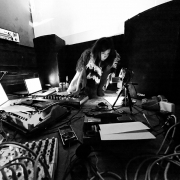 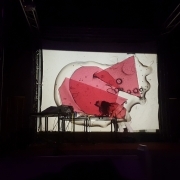 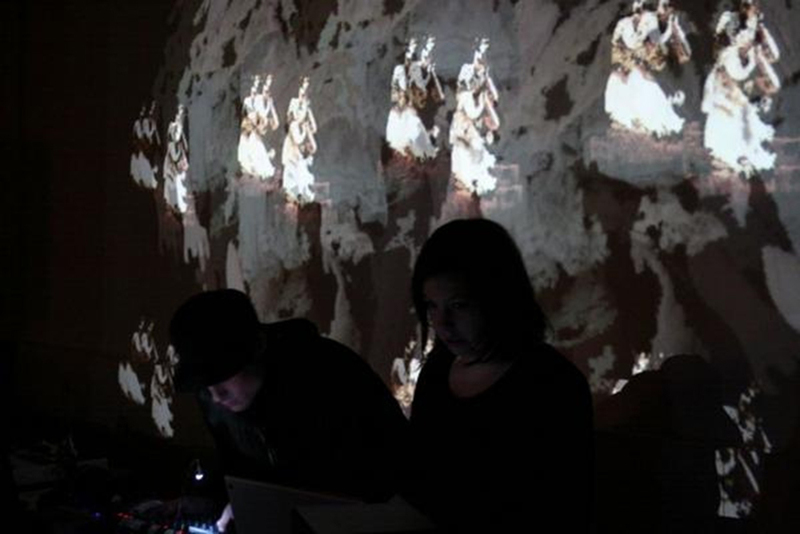 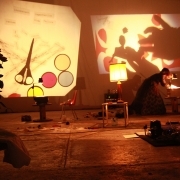 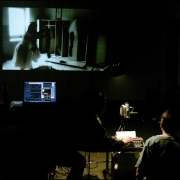 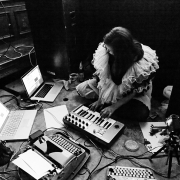 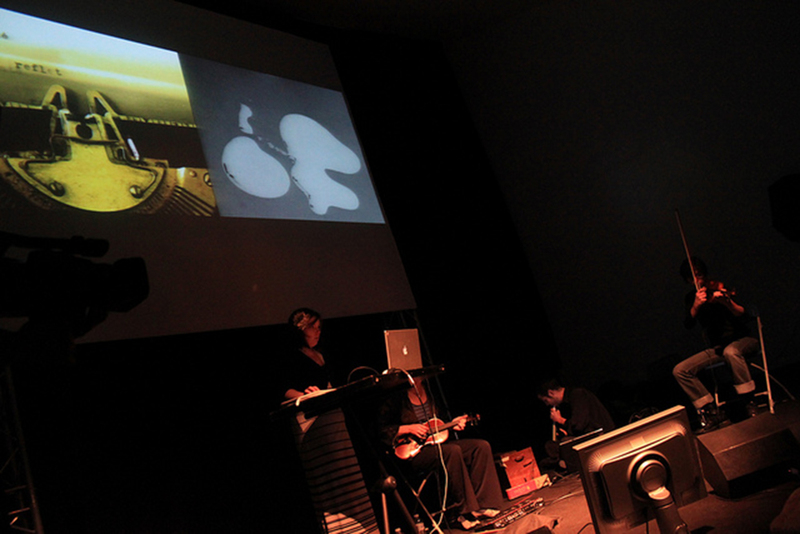 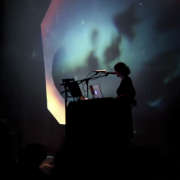 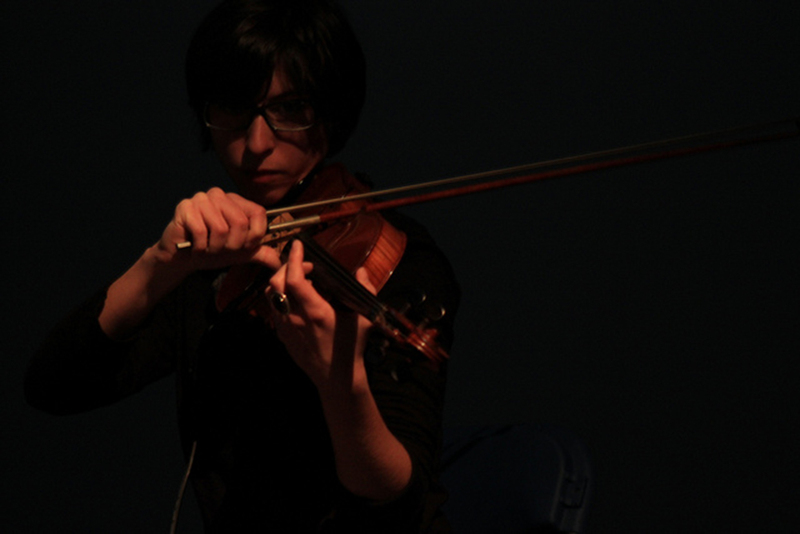 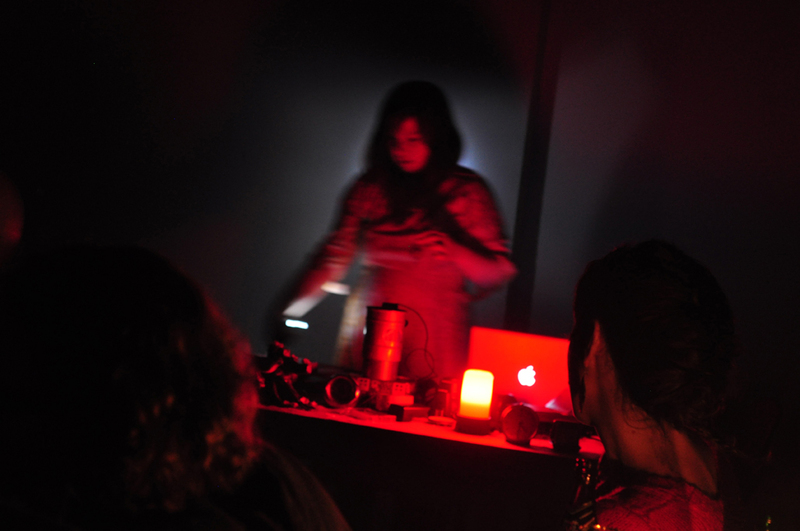 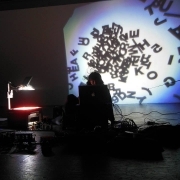 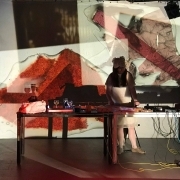 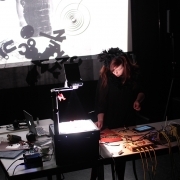 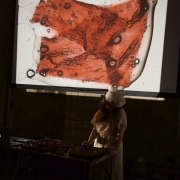 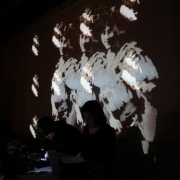 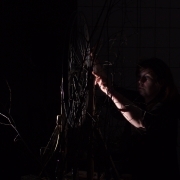 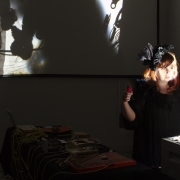 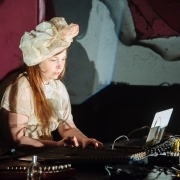 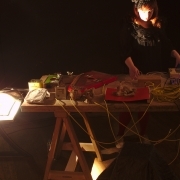 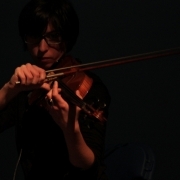 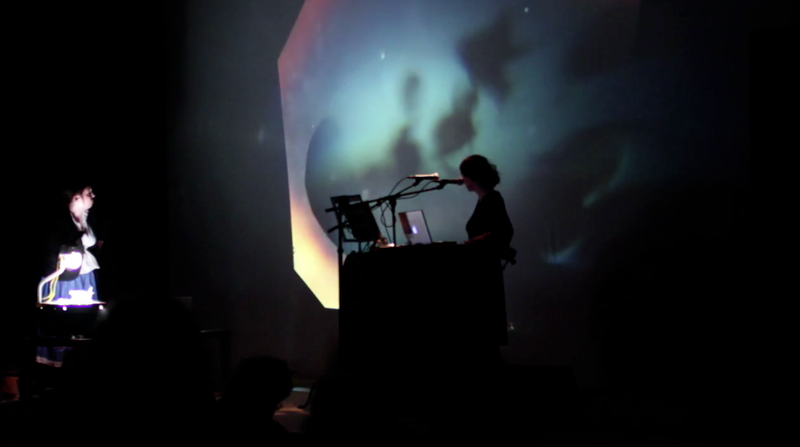 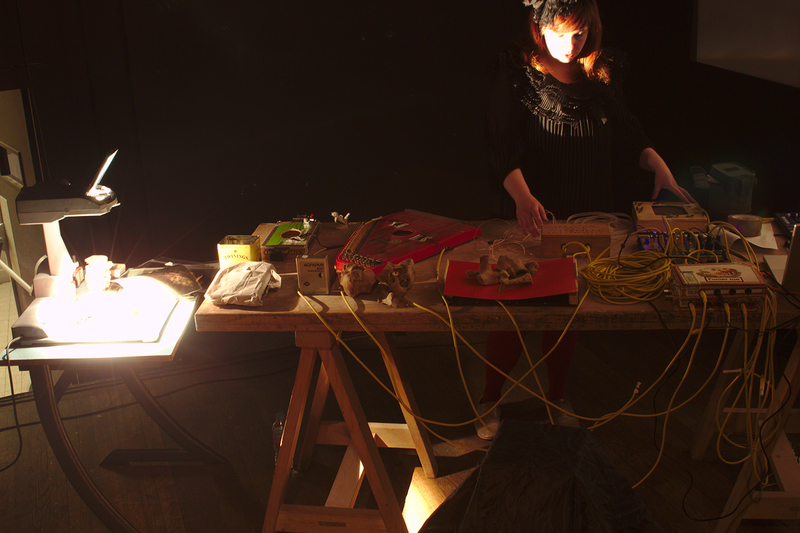 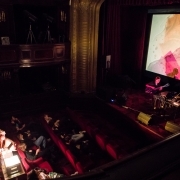 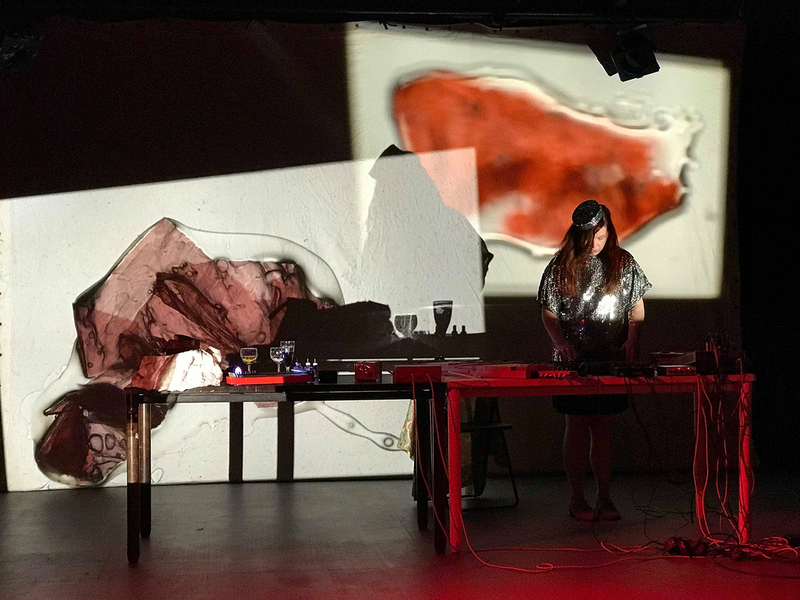 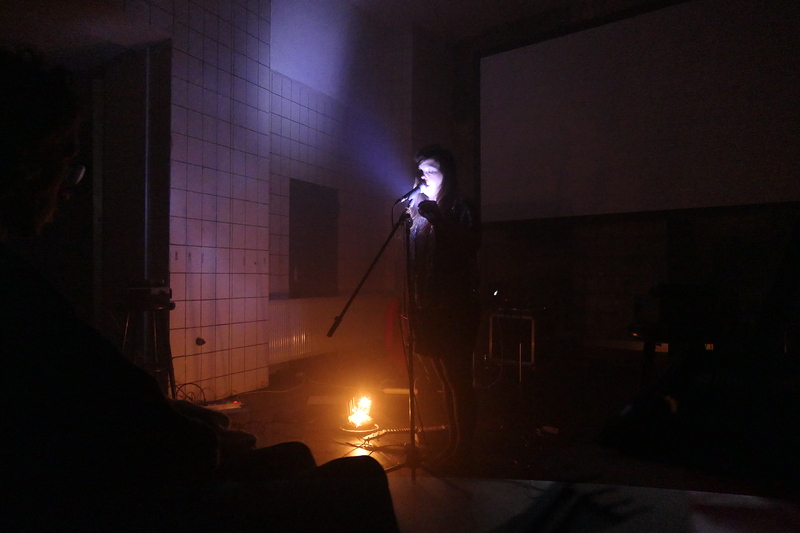 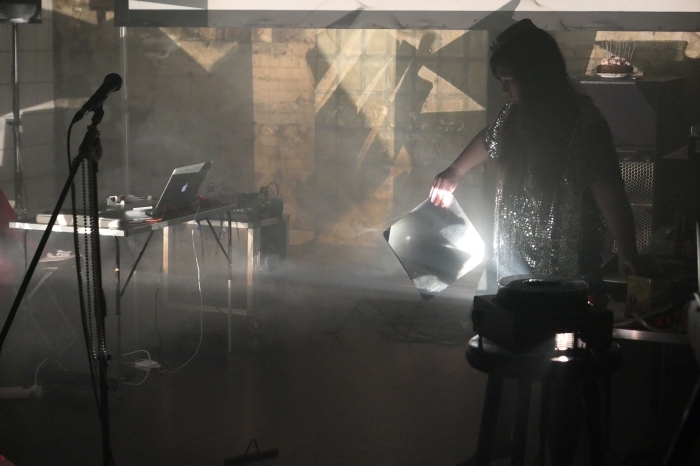 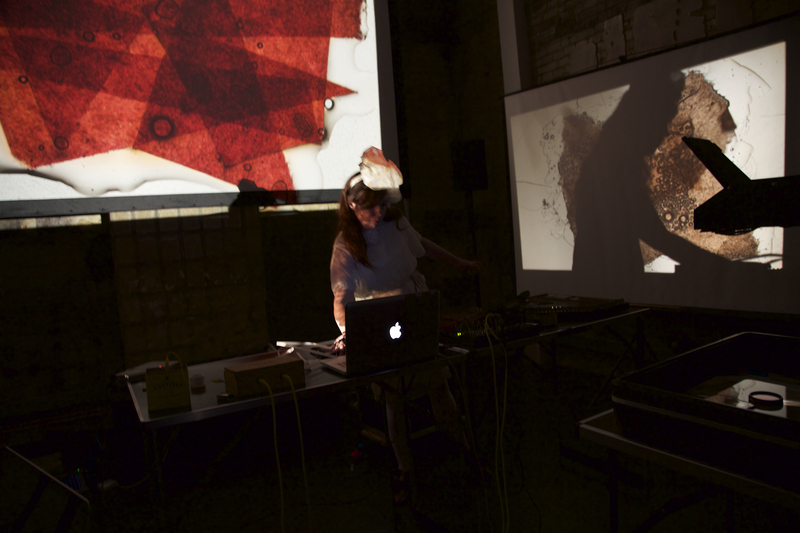 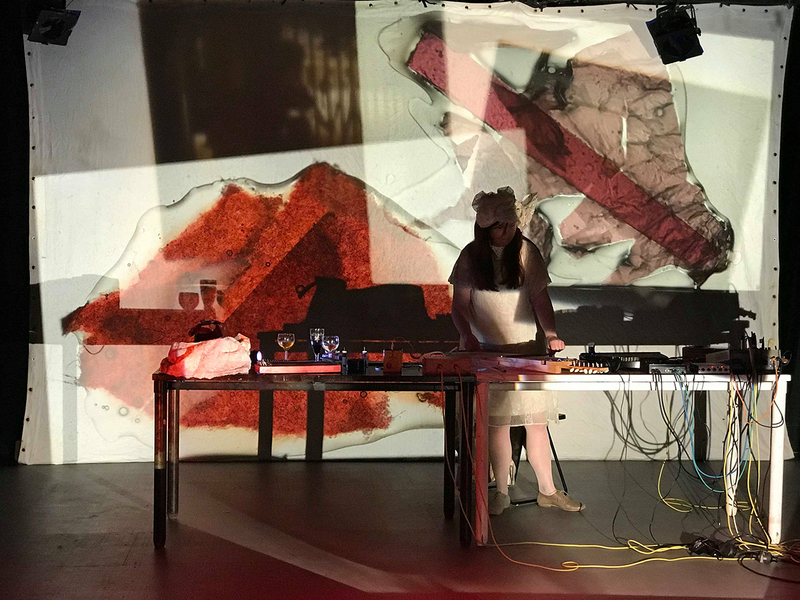 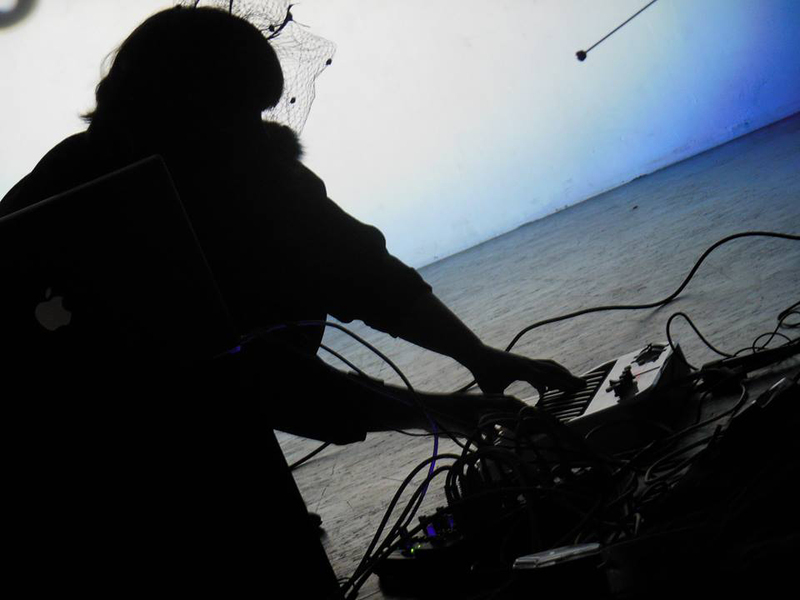 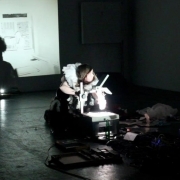 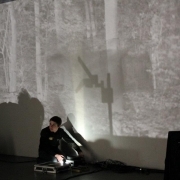 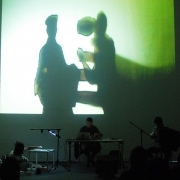 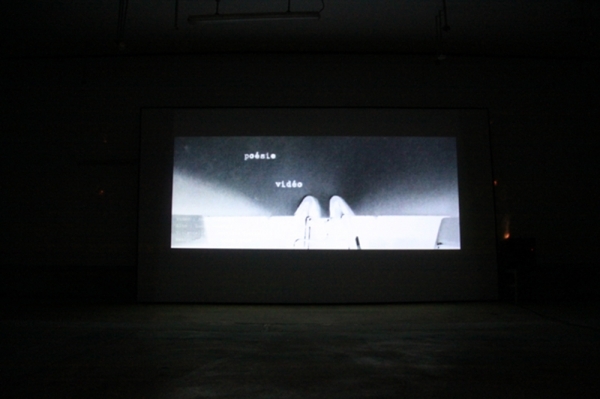 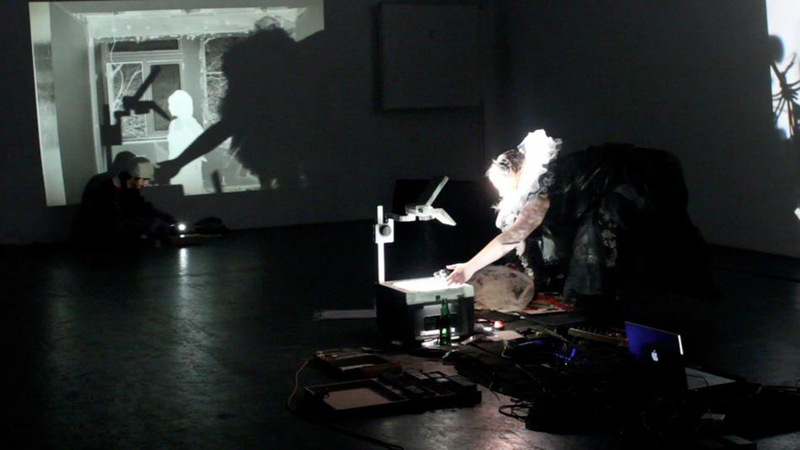 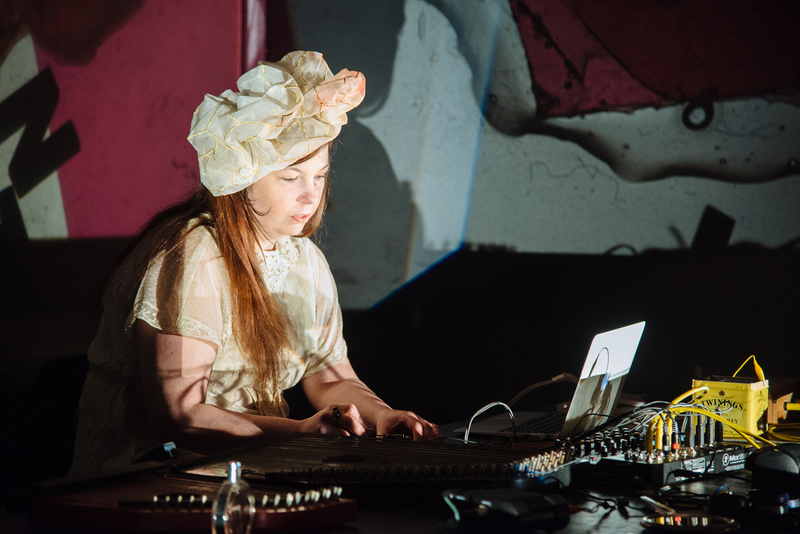 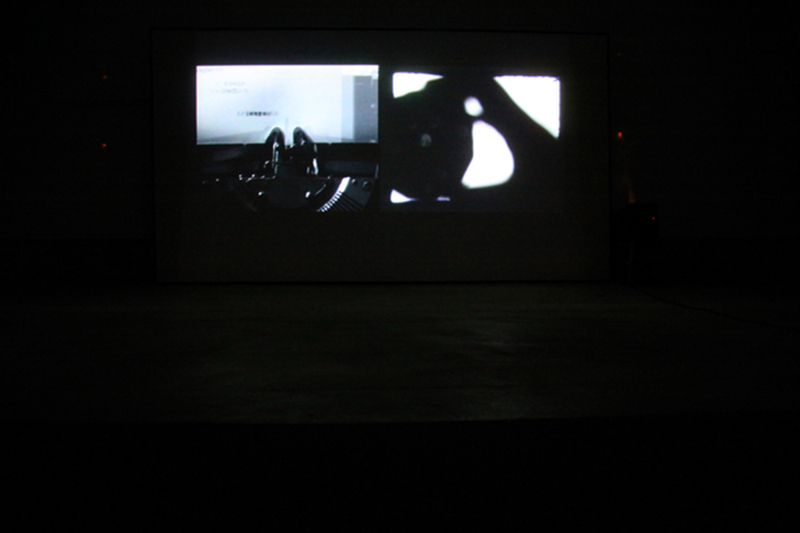 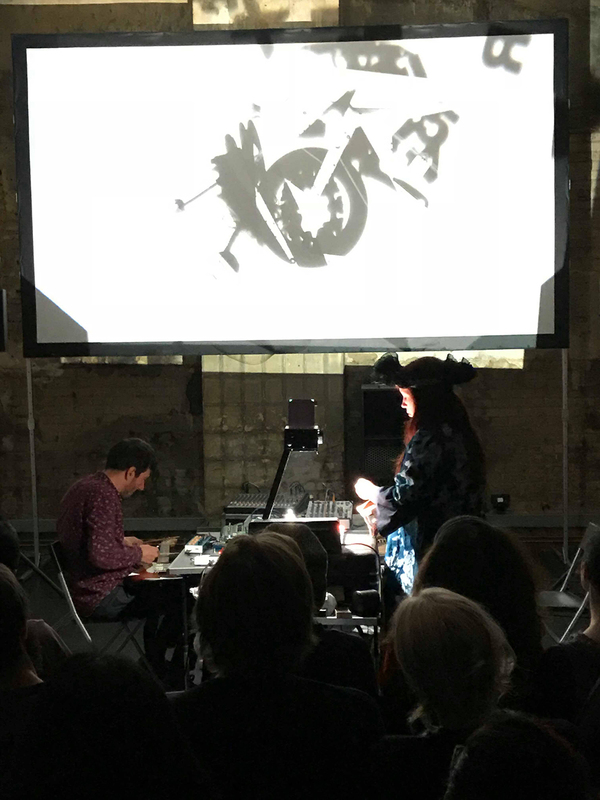 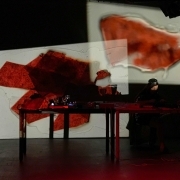 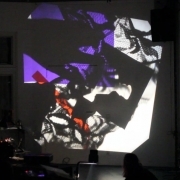 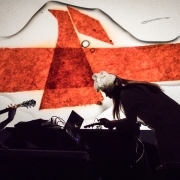 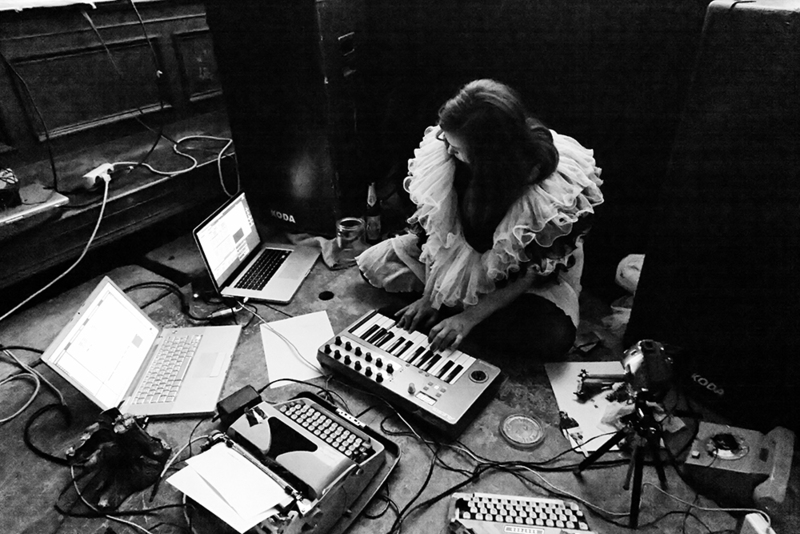 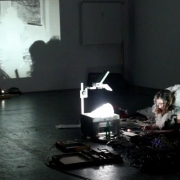 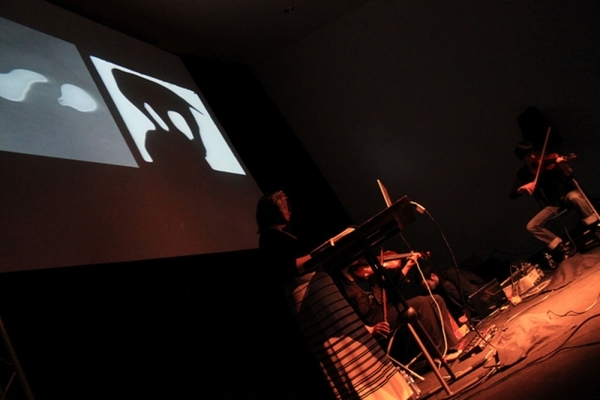 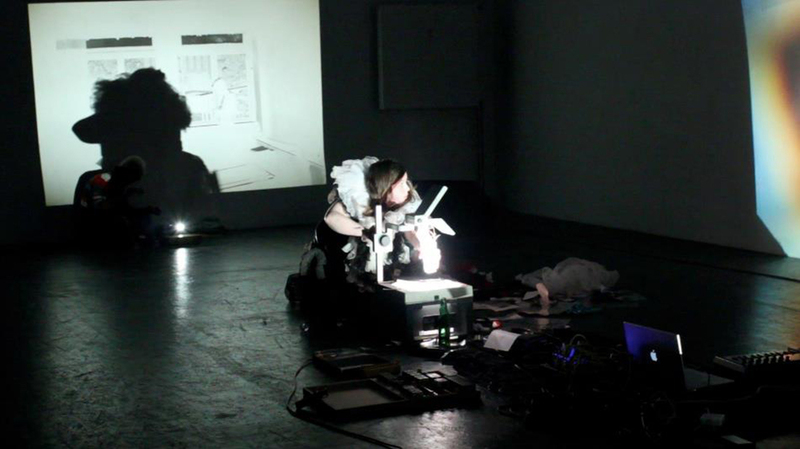 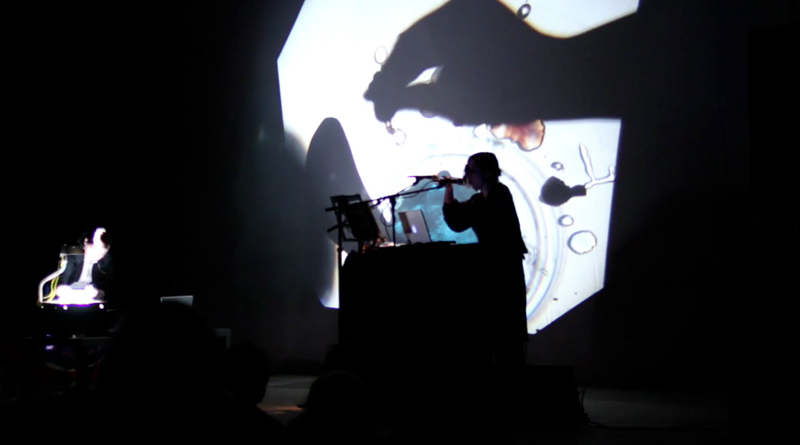 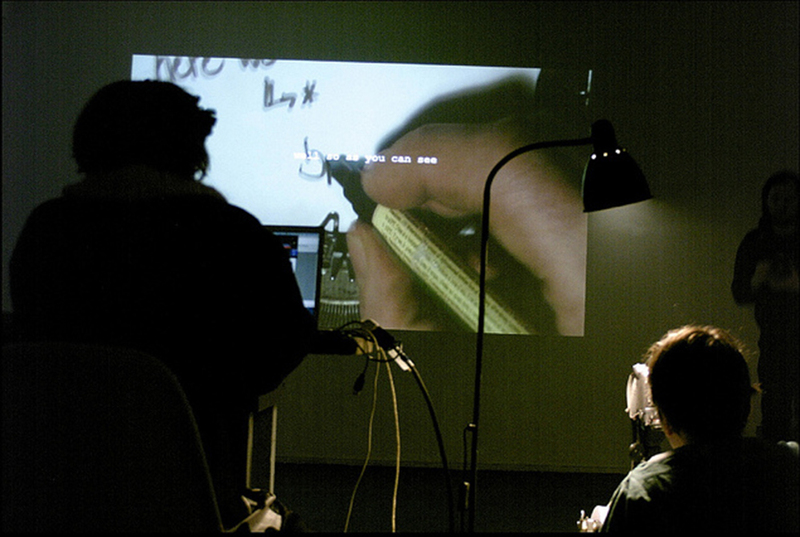 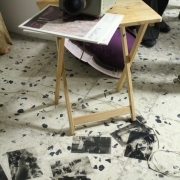 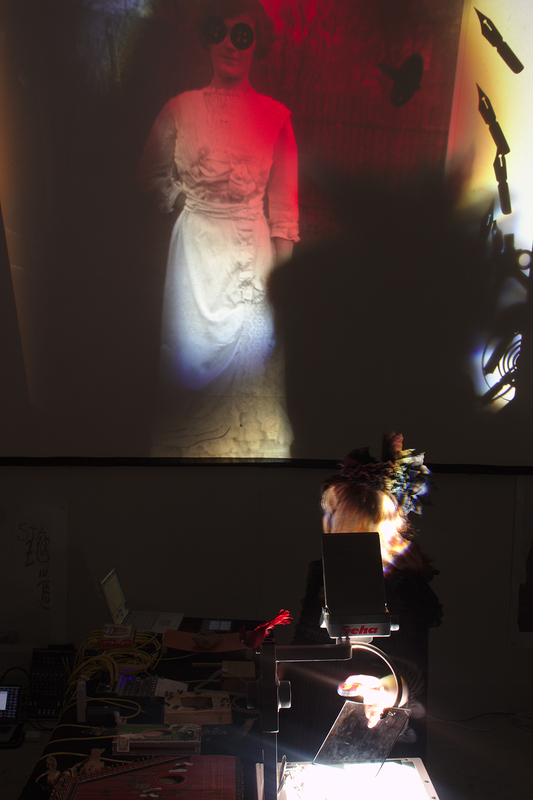 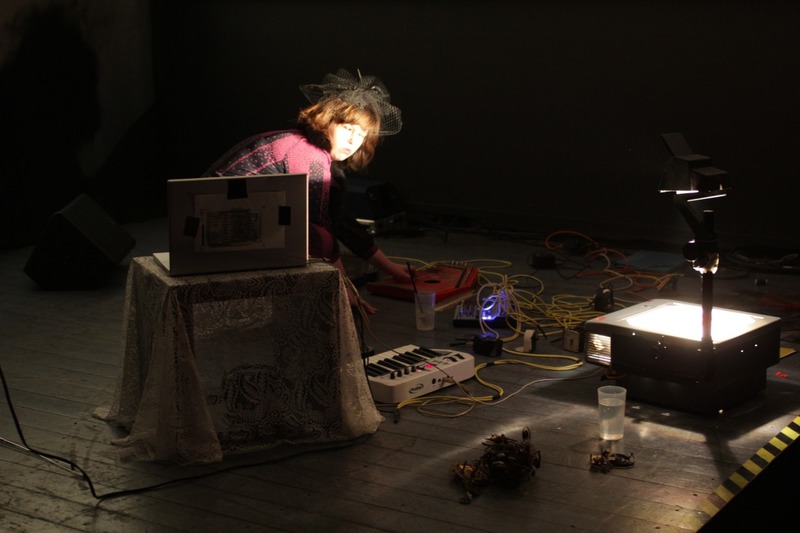 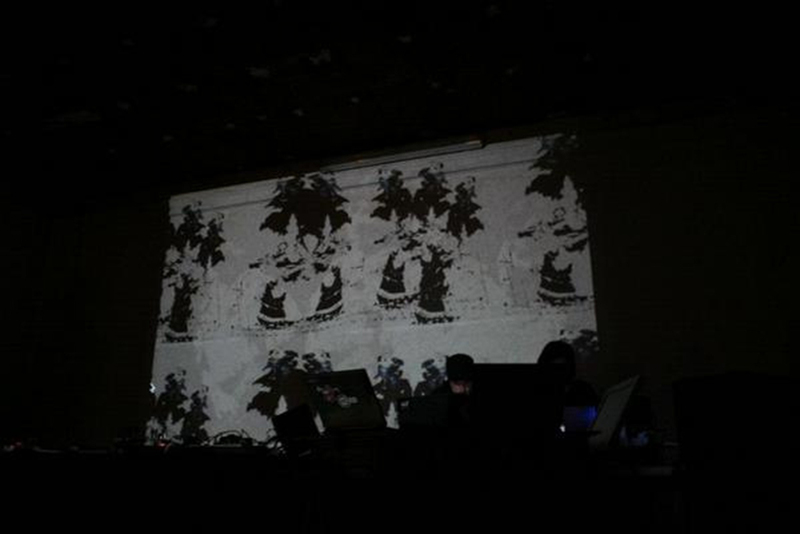 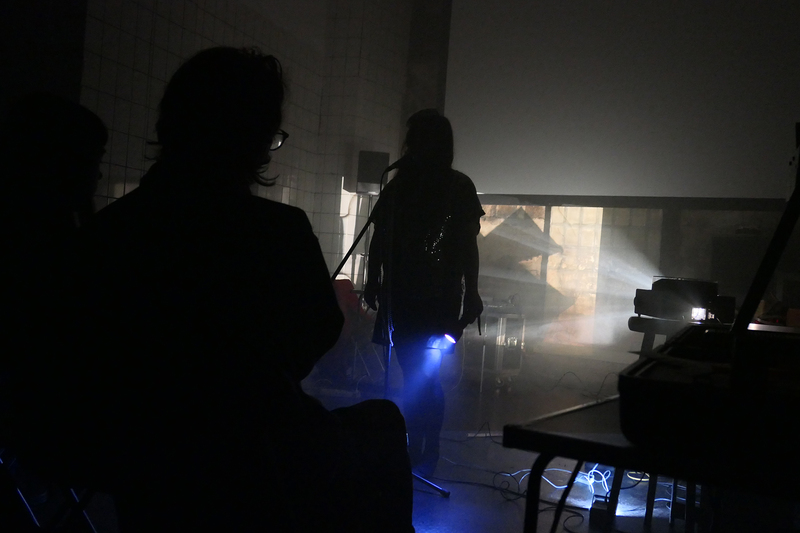 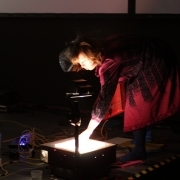 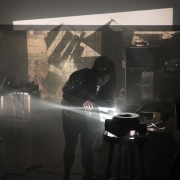 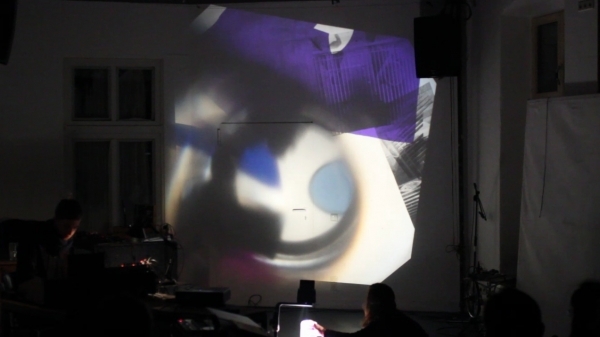 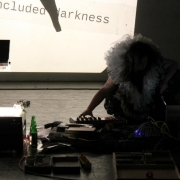 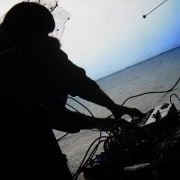 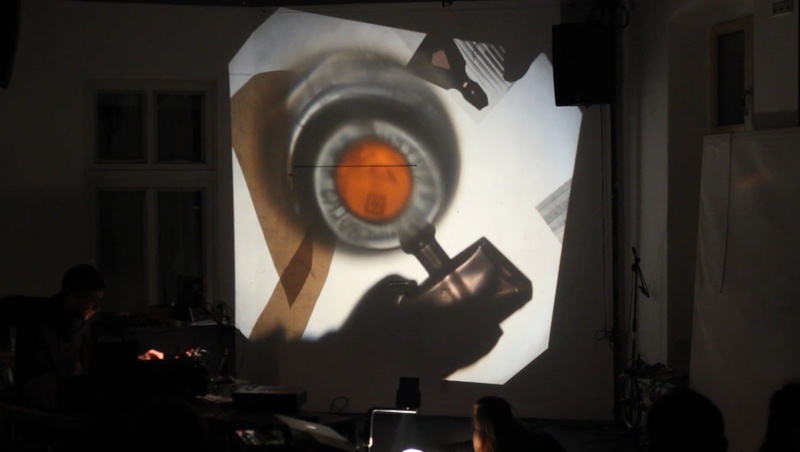 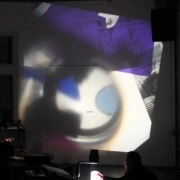 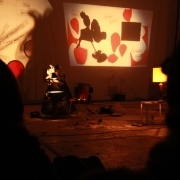 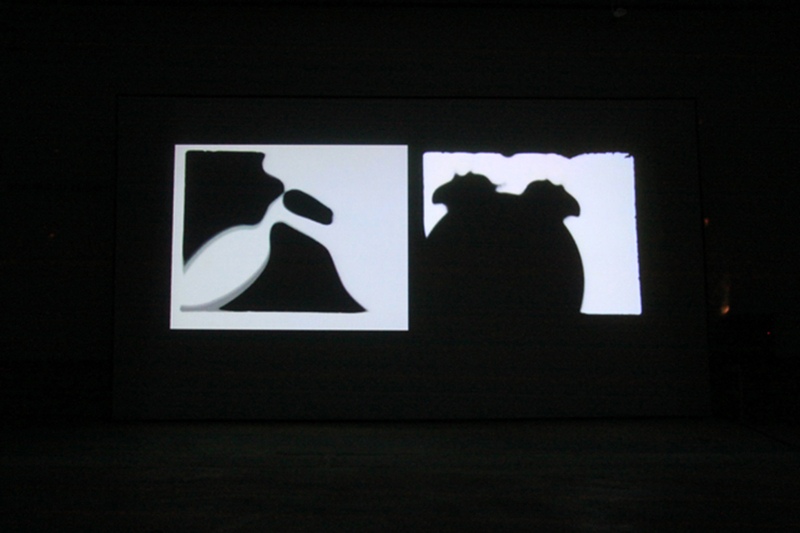 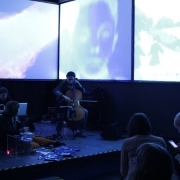 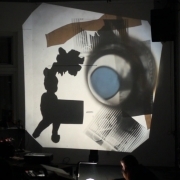 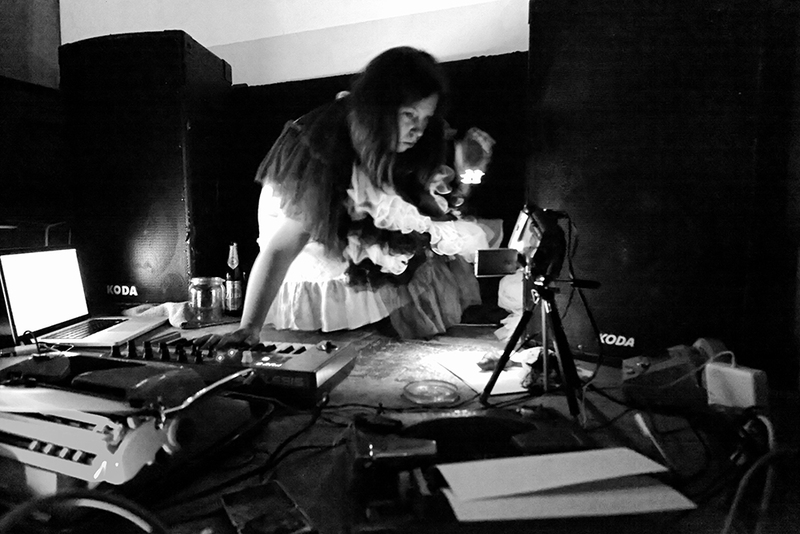 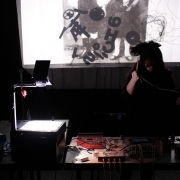 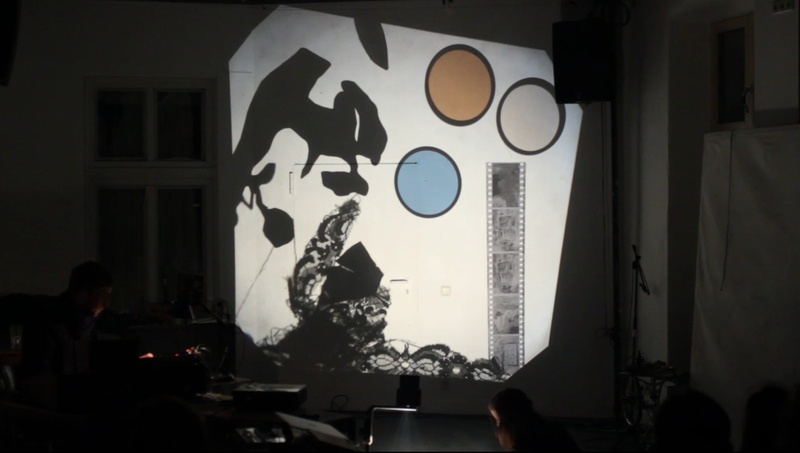 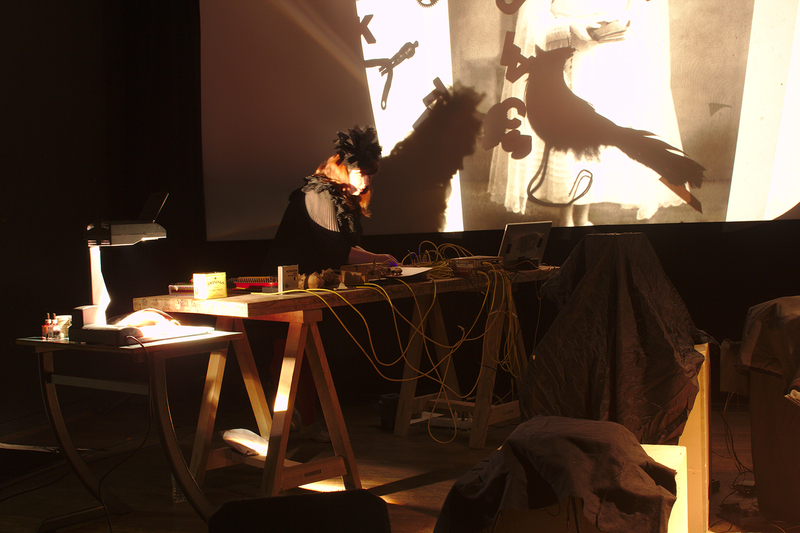 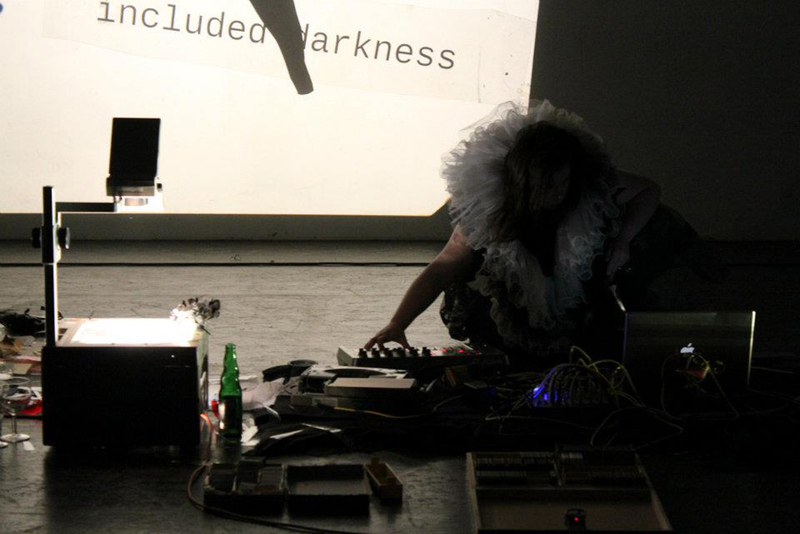 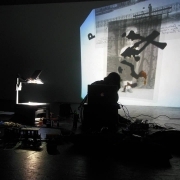 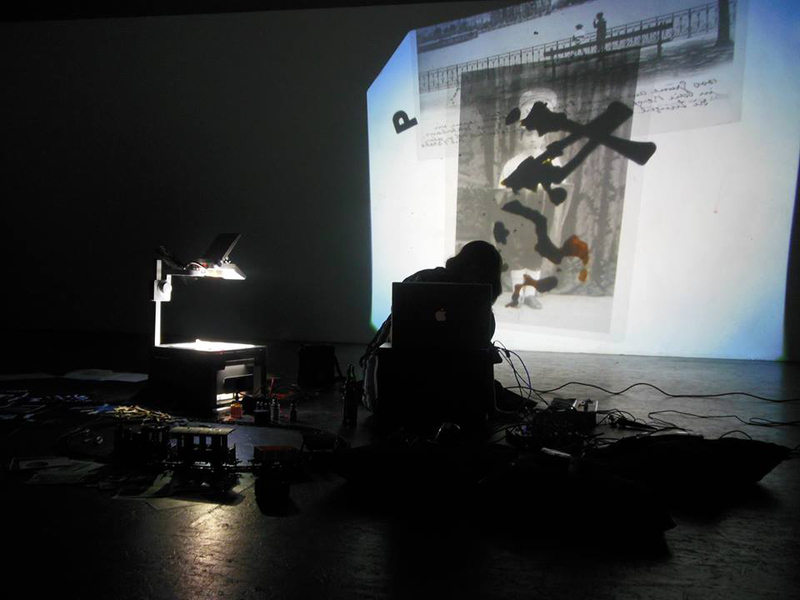 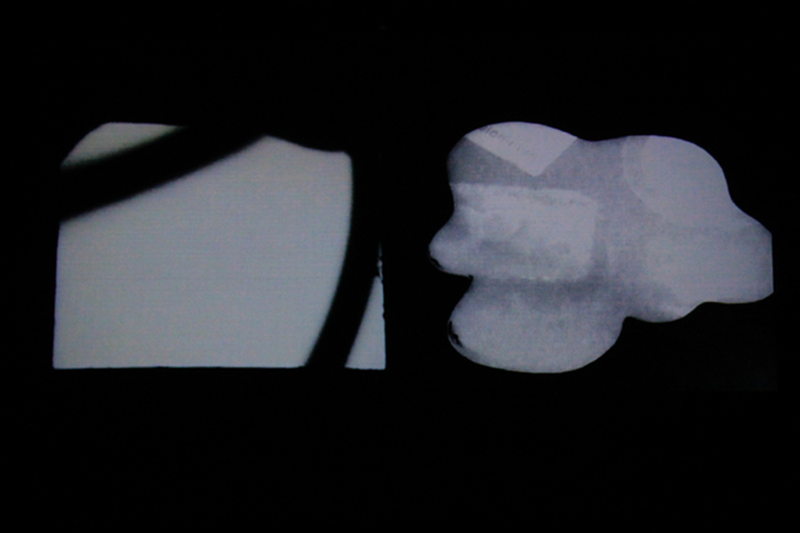 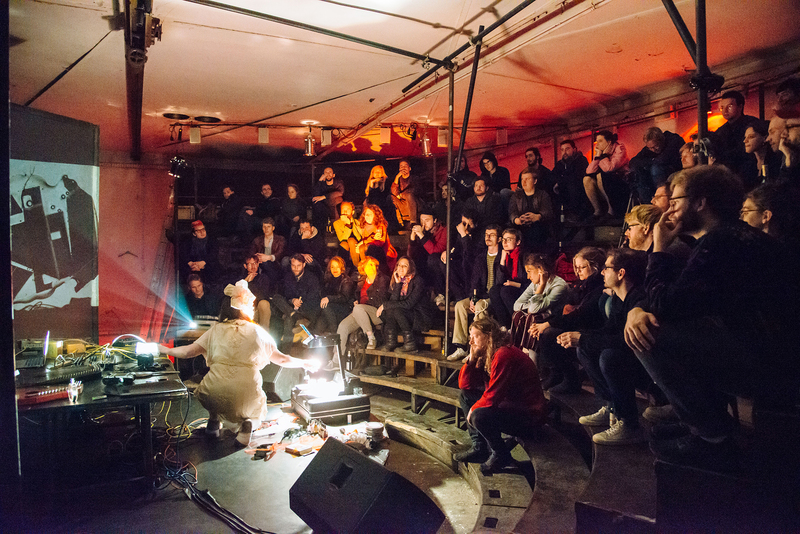 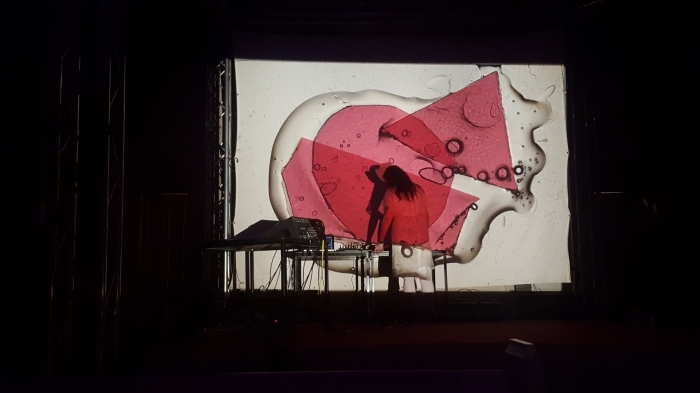 Her performance works oscillates between digital and analogue medium, combining original cross-border techniques between real-time video feedback and digital and acoustic sounds. 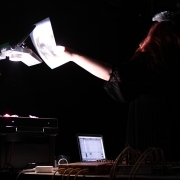 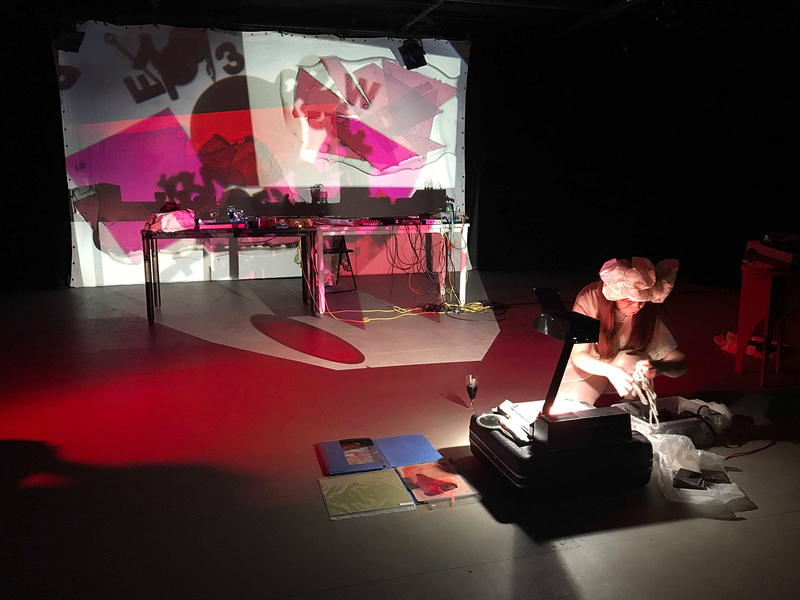 She often uses overhead projectors, slide projectors, typewriters, clocks, that are amplified via micro-contact microphones, combined with acoustic and digital sounds. 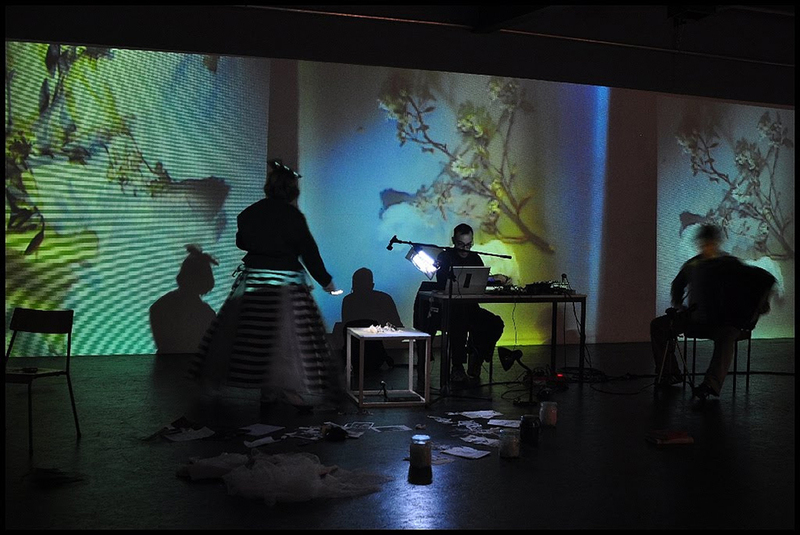 Chimère bleue is an experimental audio visual performance immersing the viewer in a floating space suspended between dream and reality. 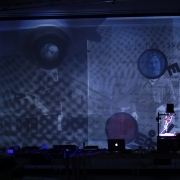 The projections are composed of blue photographic glass plate created with ancient printing technic and various shadow compositions using overhead and slide projectors. 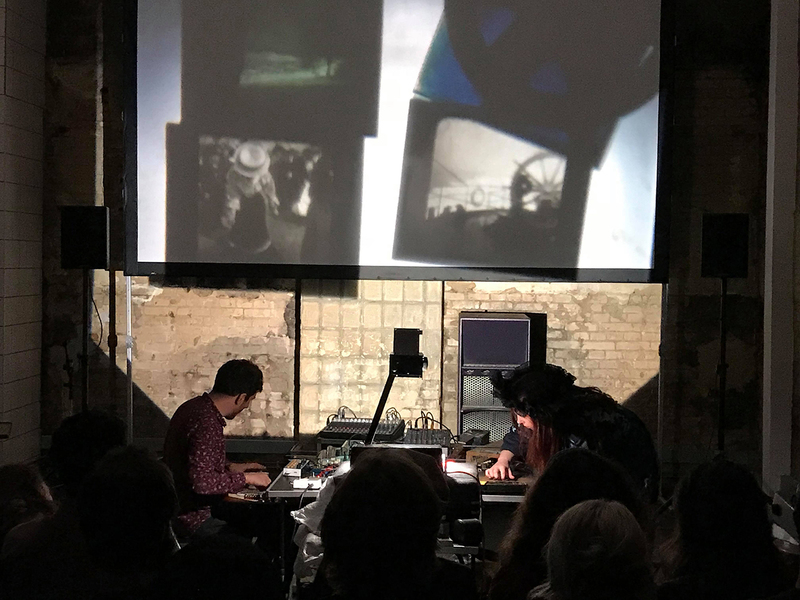 The soundscape is composed with string instruments, zither, guitar and diy harp, transporting us in a sonic space inspired by western movies. 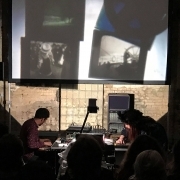 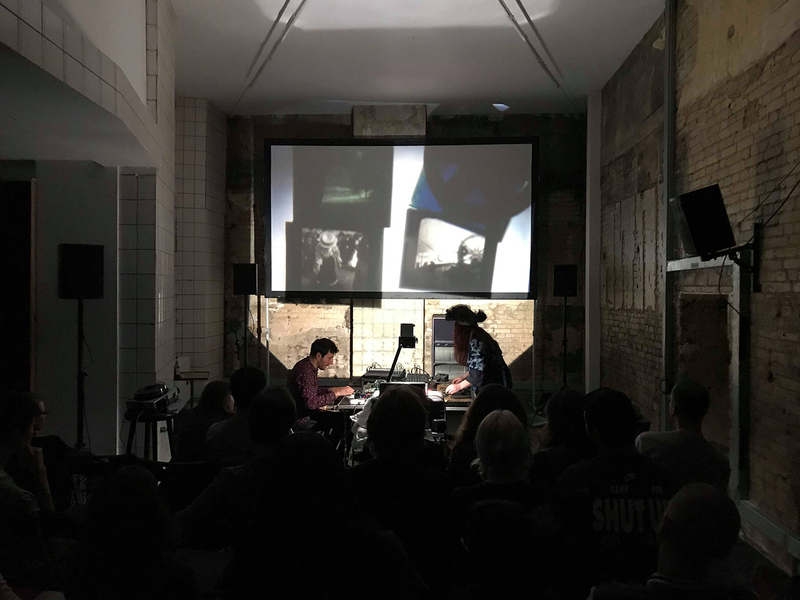 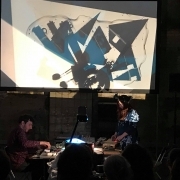 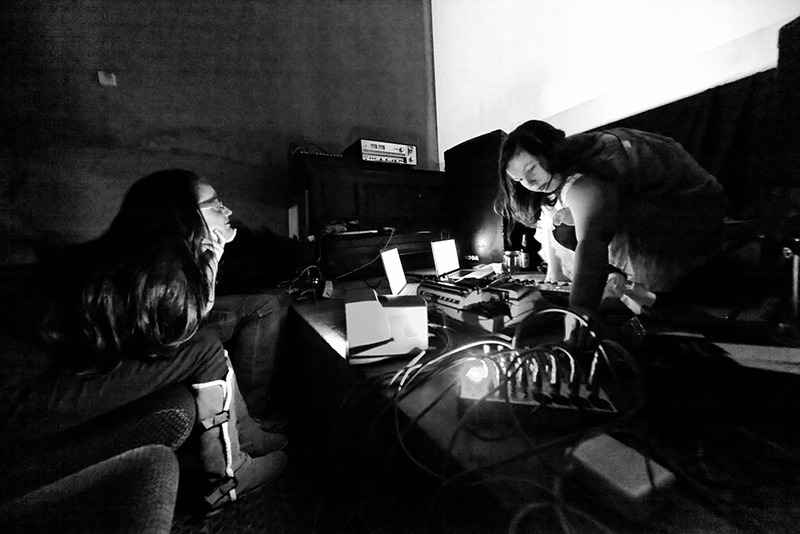 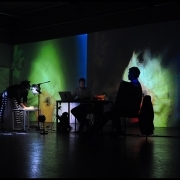 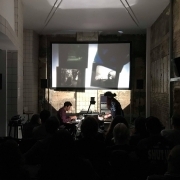 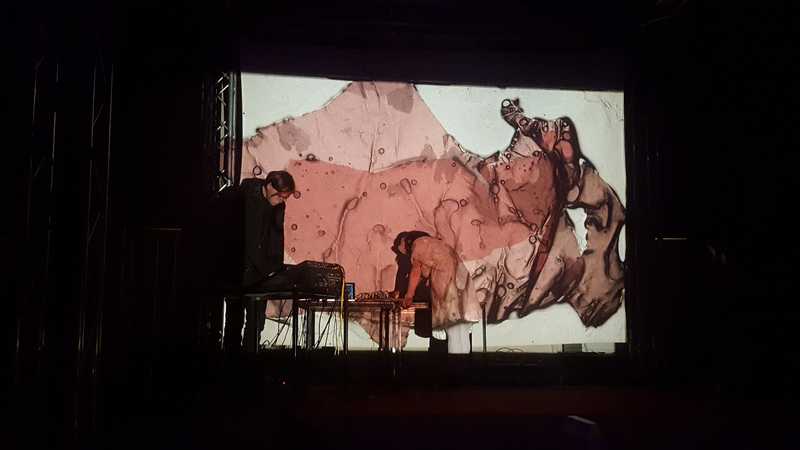 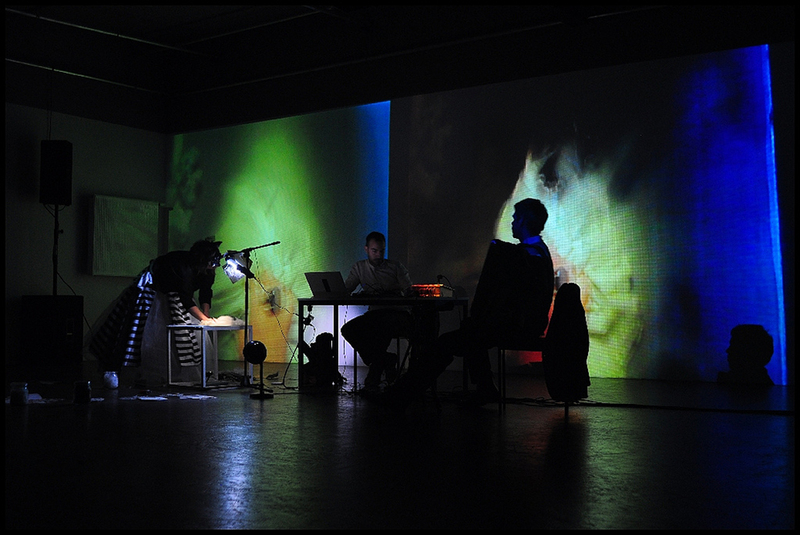 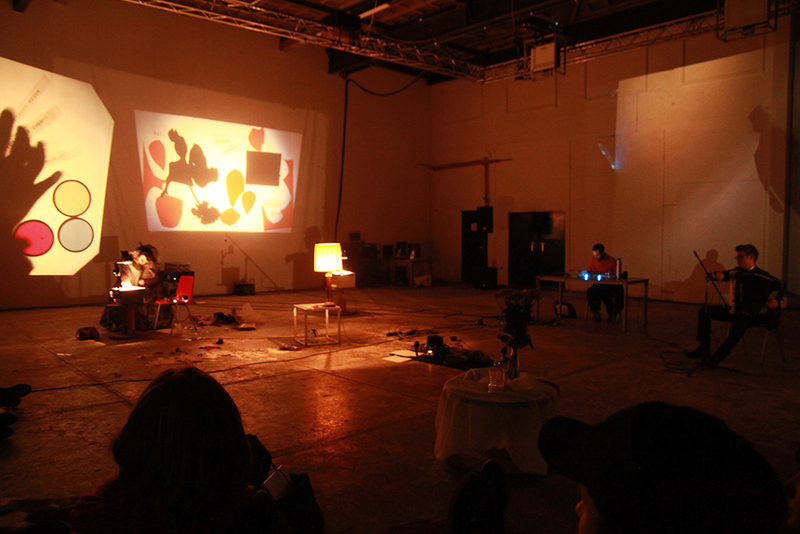 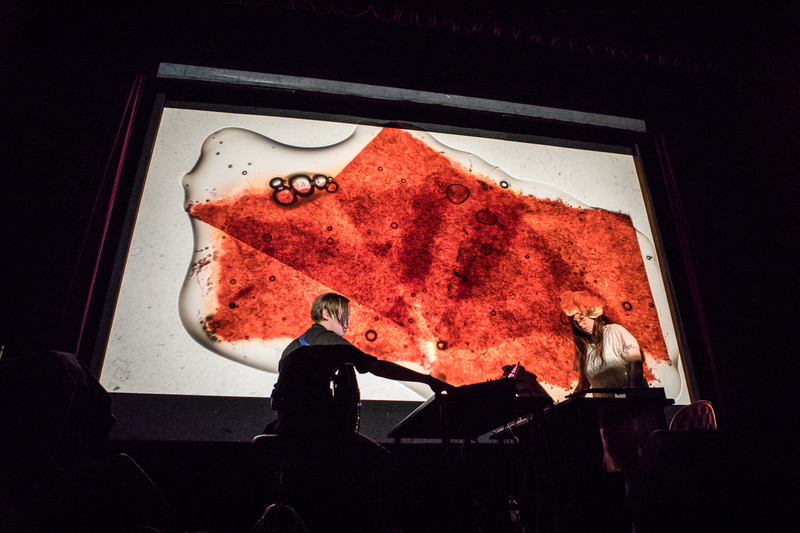 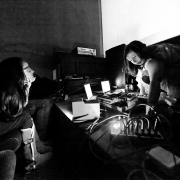 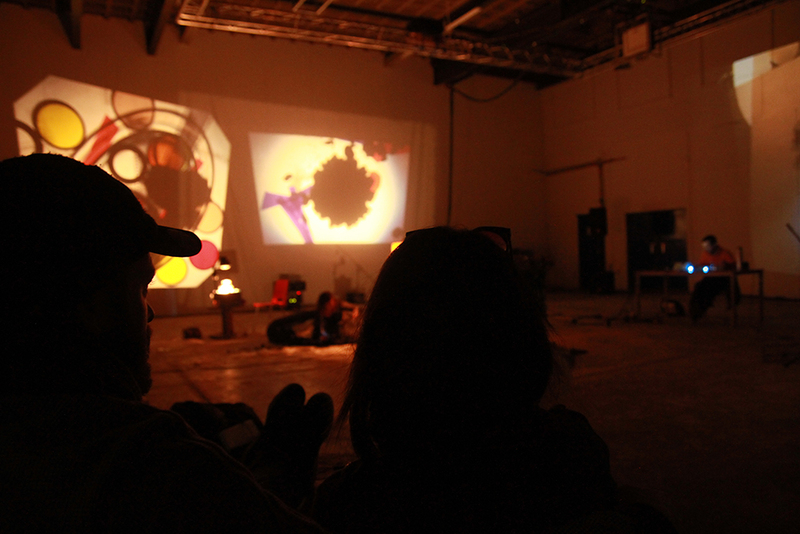 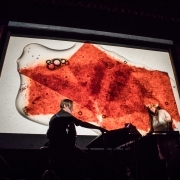 The two performers create an immersive improvisation where the sounds and images interact in a synesthetic correspondance. 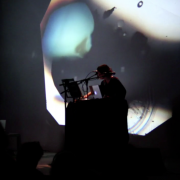 Chimère bleue from Aude Françoise on Vimeo. 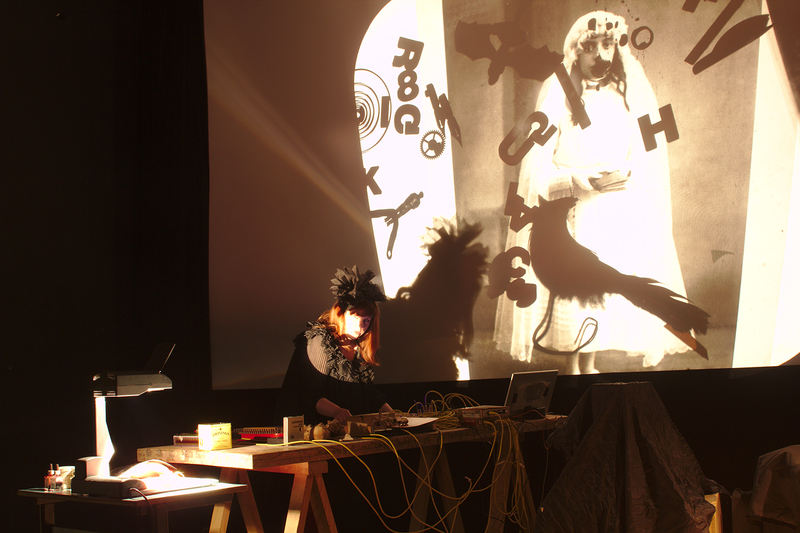 Expanded version of 50 min in Acud theater, with new harp and double costumes. 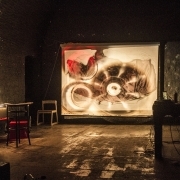 September 2018. 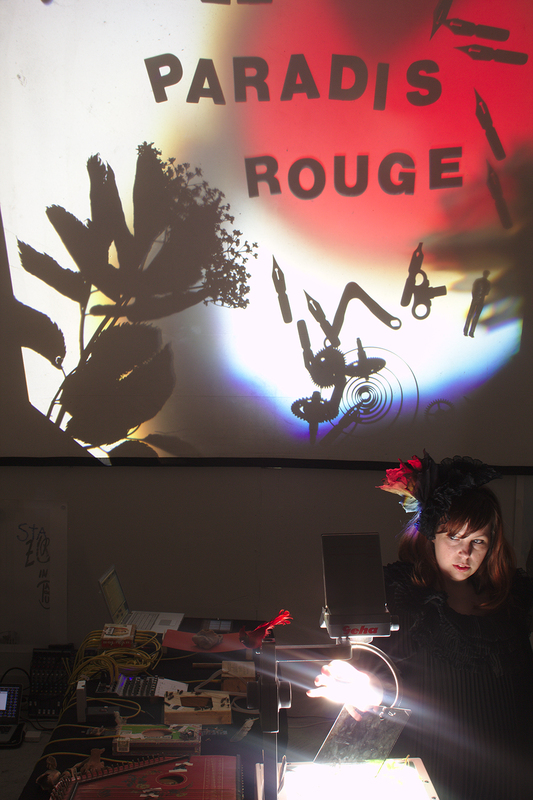 “Rouge sang” is a metaphoric tale immersing the viewer in a dreamy shadow performance, combining analogue projection and sounds. 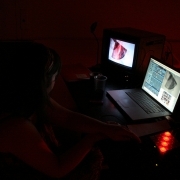 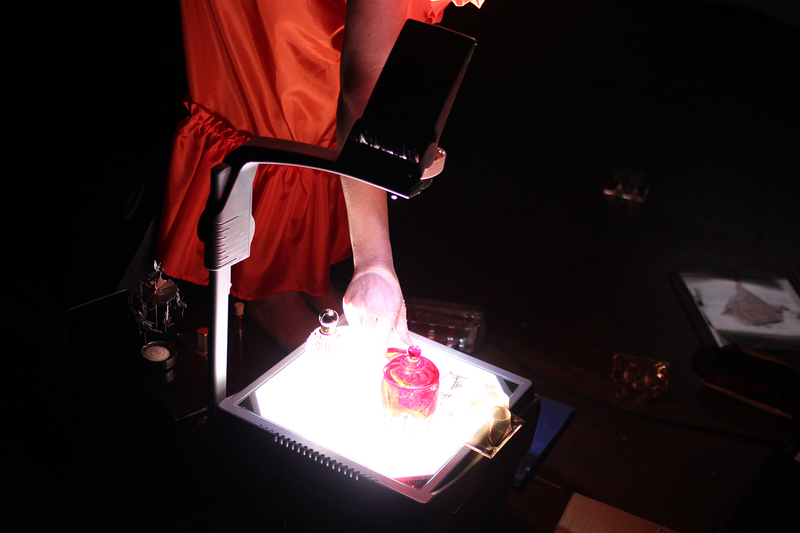 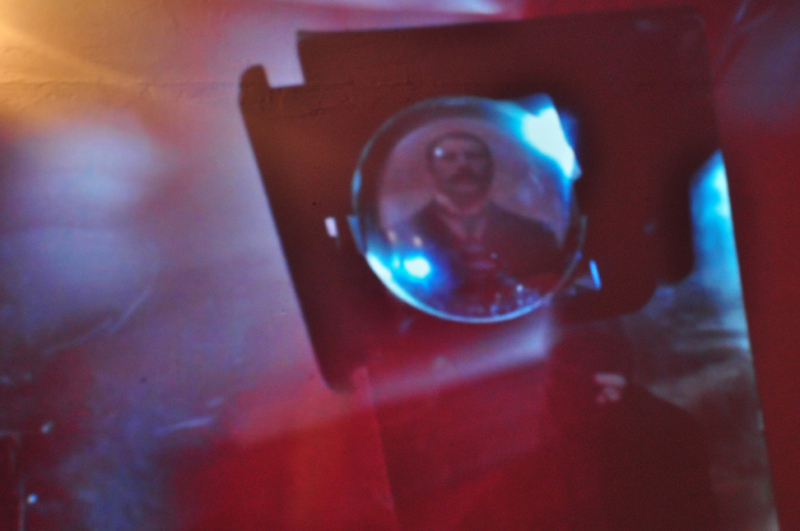 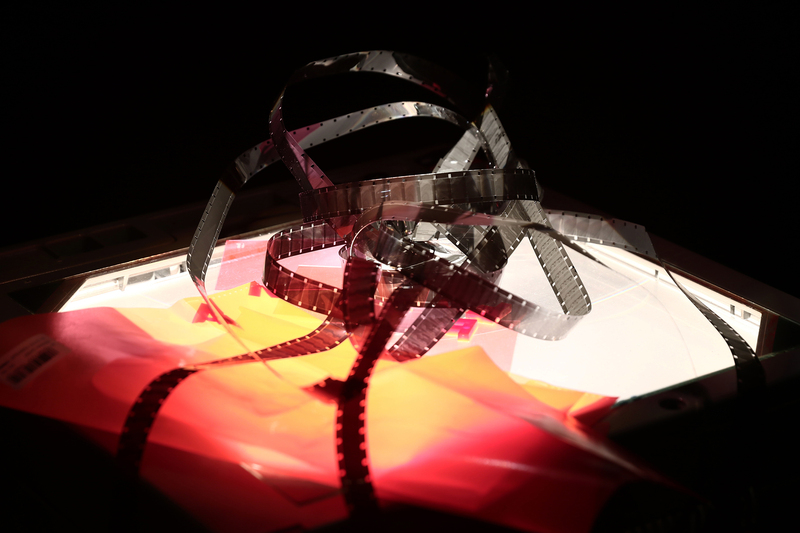 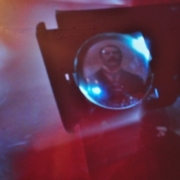 The visual landscape is exploring a series of red objects projected into light with overhead and slide projectors. 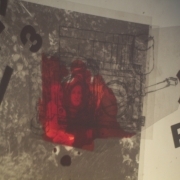 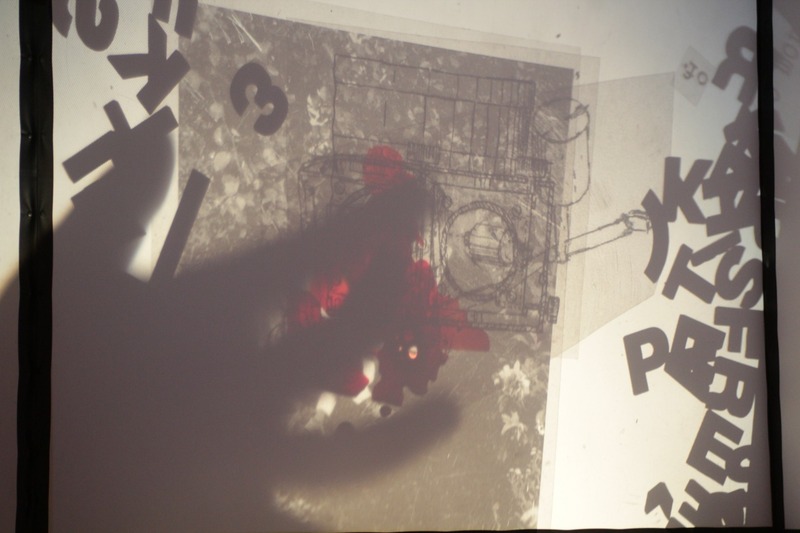 The space is filled with red moving shadow diffracting a collection of light objects, paper cuts, organic slides, composed as a visual collage evolving inside a space bubble. 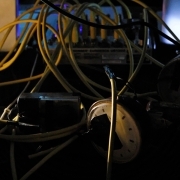 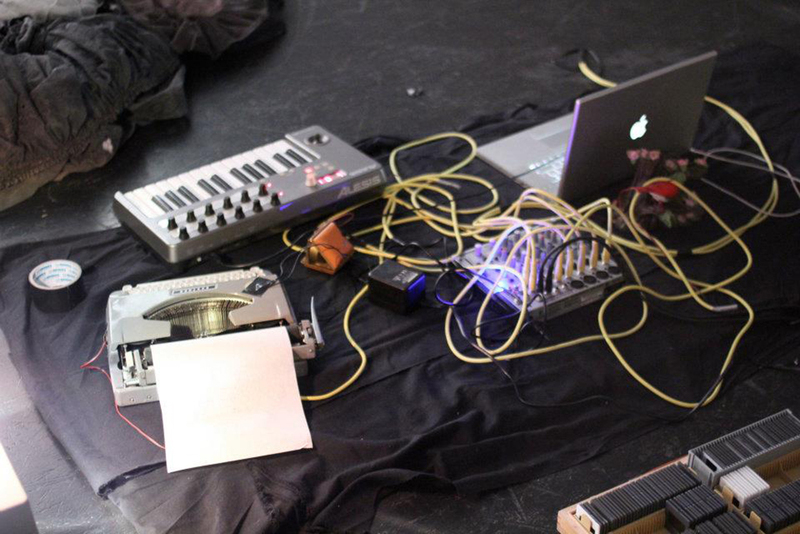 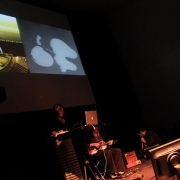 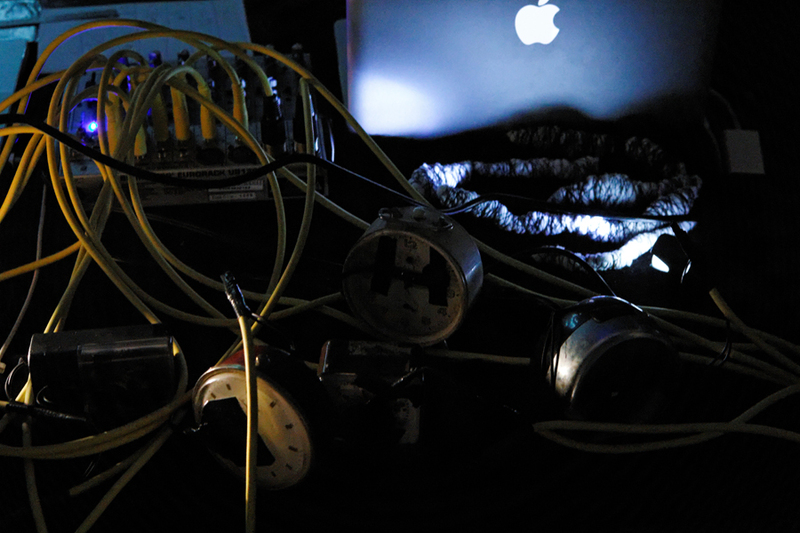 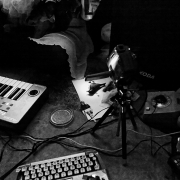 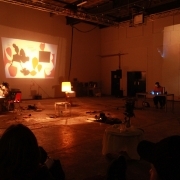 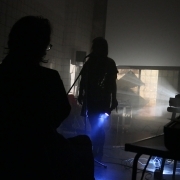 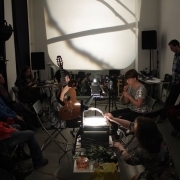 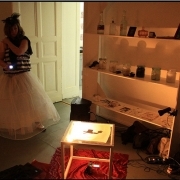 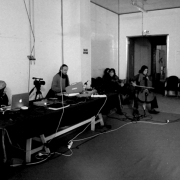 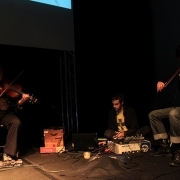 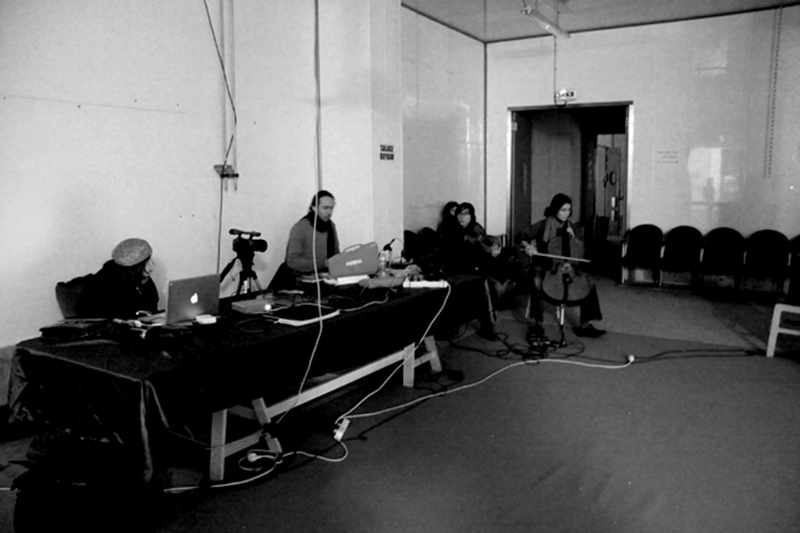 The soundscape is produced with handmade pickup microphones amplifying cords, metallic objects, theremins and ebow… The vibration of the sound is slowly modified with digital effects turning the experience in electro acoustic drift, where the action of the performers produce a sonic improvisation. 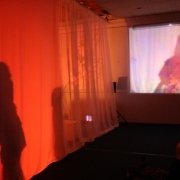 Orange double from Aude Françoise on Vimeo. 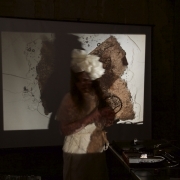 Immersed in a narrative drift AudeRrose creates a dream like shadow play composed with fragments memory deformed in real time, the voice is combined with old vinyl tunes, guitar and sound effects. 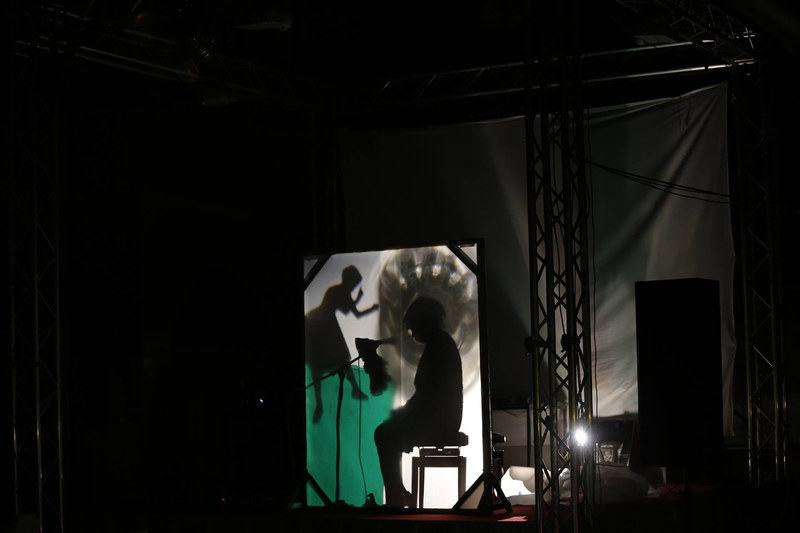 The narration immerses the viewer in an imaginary space, crossing deserts, forests and fantastic landscapes created on the surface of overhead projectors. 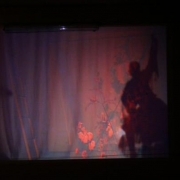 During the journey, the persona is having hallucinations trying to modify the vision of reality. 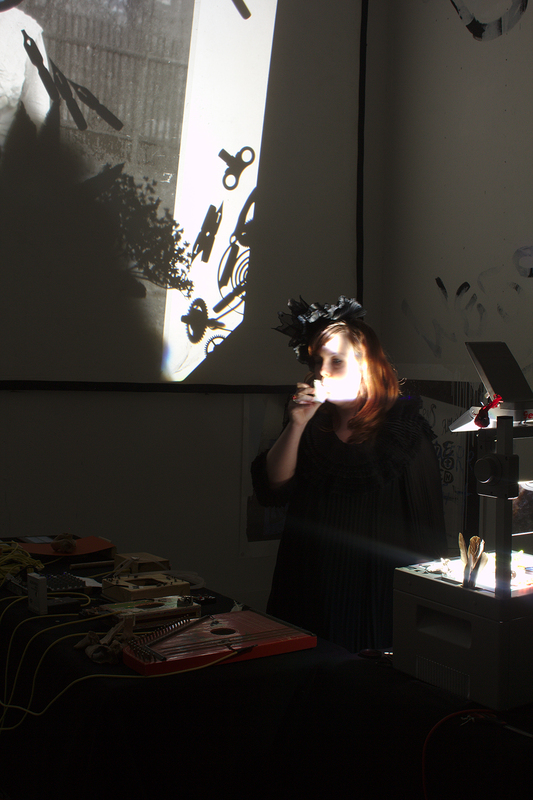 Playing with reflections and archaic light devices, objects and mirrors, filling the space with dynamic diffracted projections. 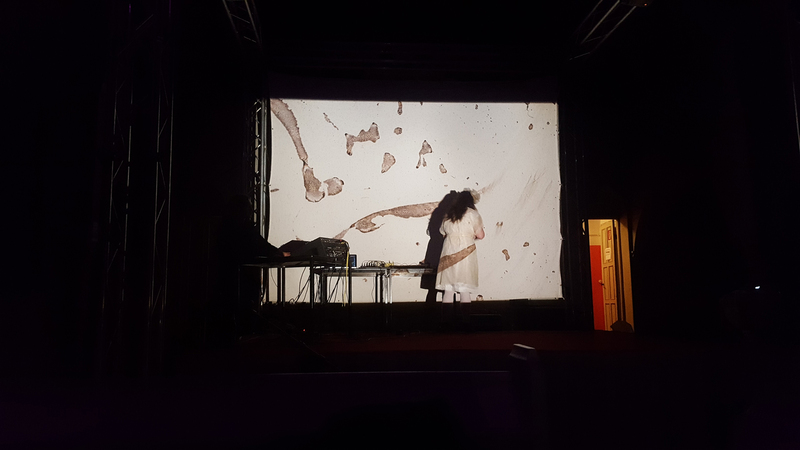 The show is a premiere. 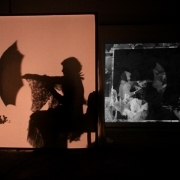 Miroirs et fragments fantastiques Premiere at Spektrum from Aude Françoise on Vimeo. 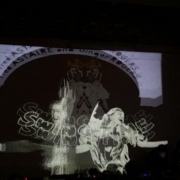 Rouge Sang at Gaswerk Weimar from Aude Françoise on Vimeo. 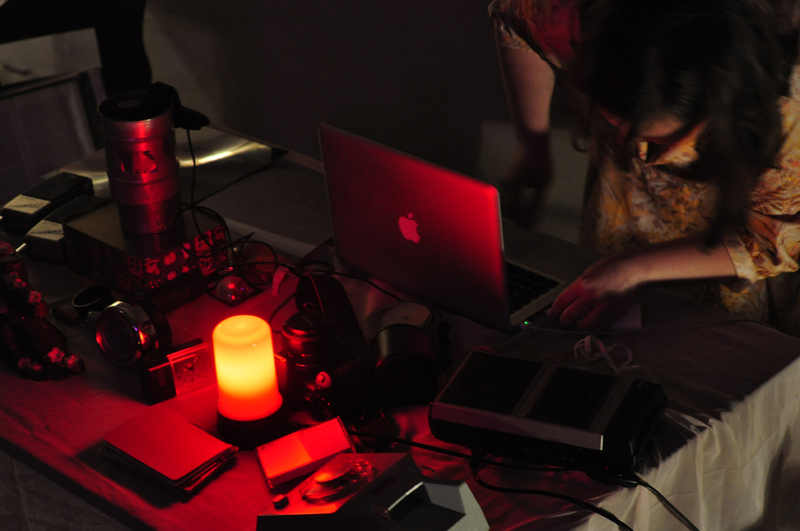 The soundscape is produced with handmade pickup microphones amplifying cords, metallic objects, theremins and ebow. 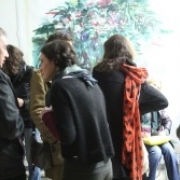 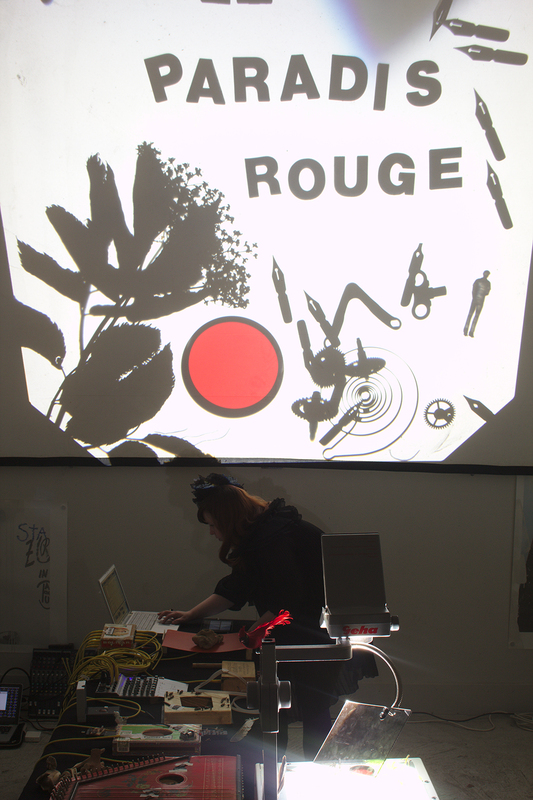 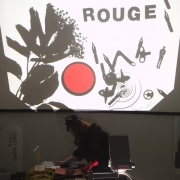 Rouge Sang at MicroB Eintanzhaus from Aude Françoise on Vimeo. 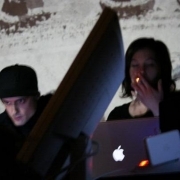 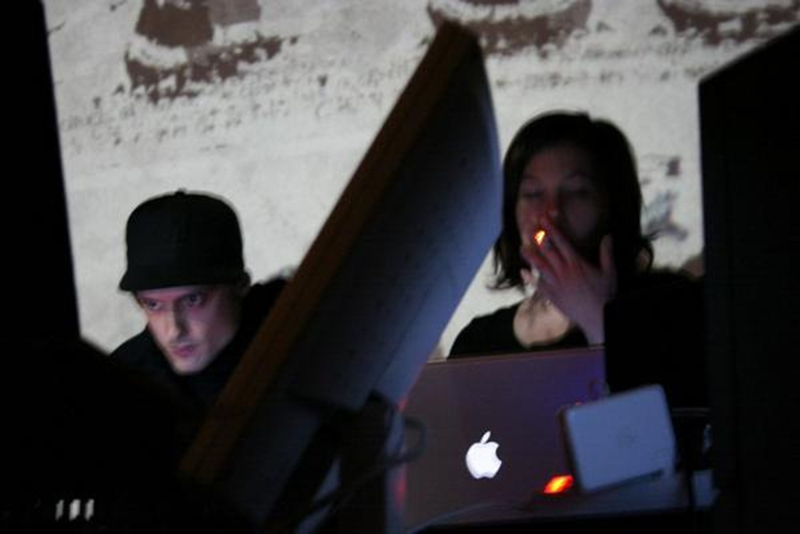 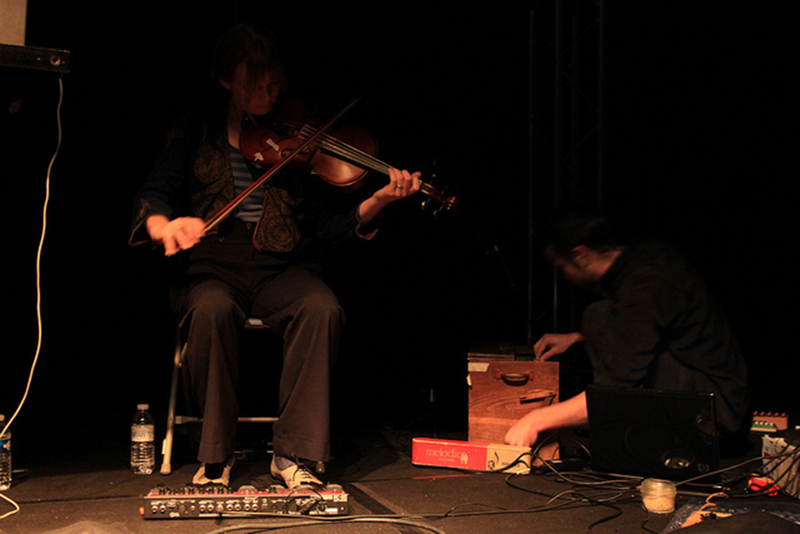 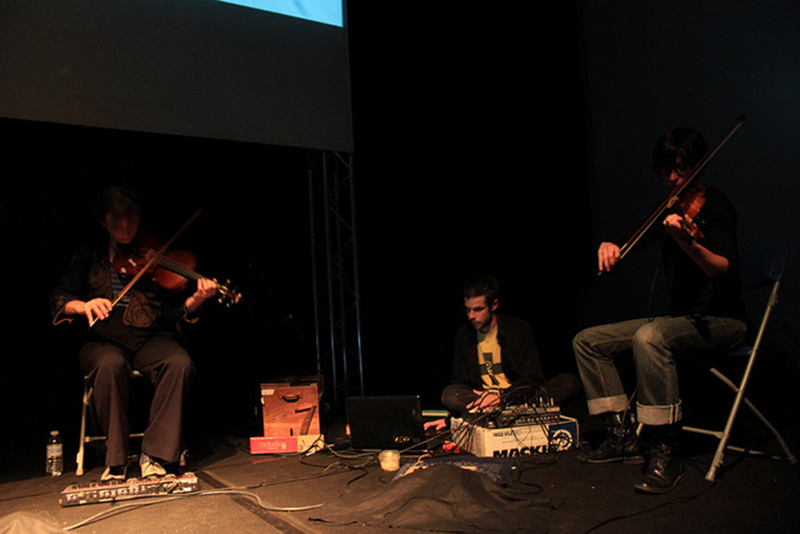 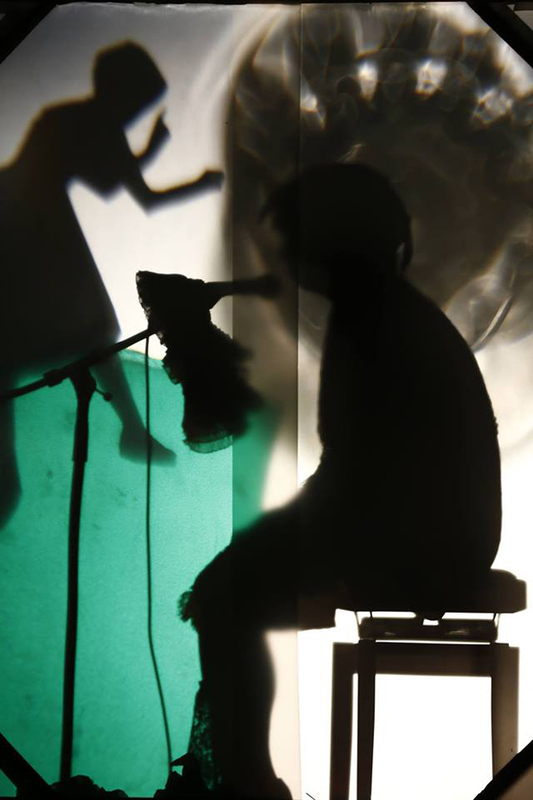 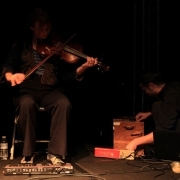 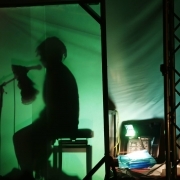 performers produce a sonic improvisation. 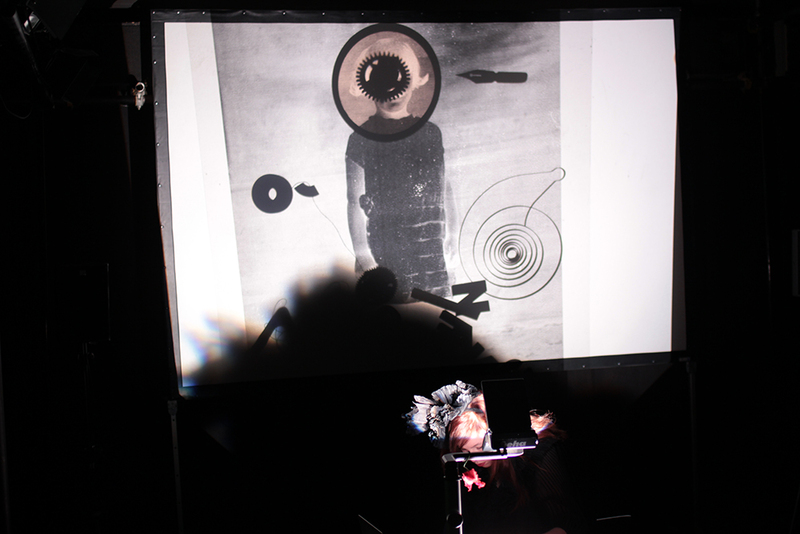 The experience of reality slowly drifts into a ritual mythological narrative, immersing the spectator in surrealist audio-visual shadow play. 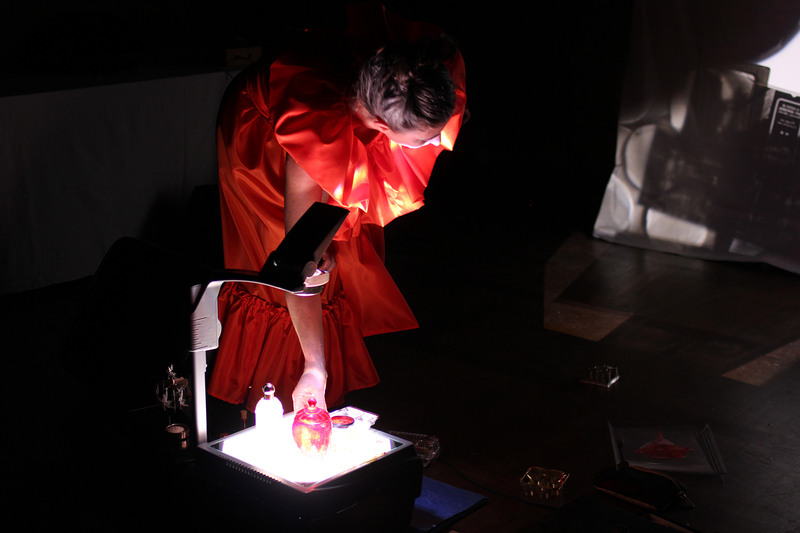 The performance is a sort of shamanic experience on how to transform reality into fiction exploring the idea of catharsis as an essential mode of survival. 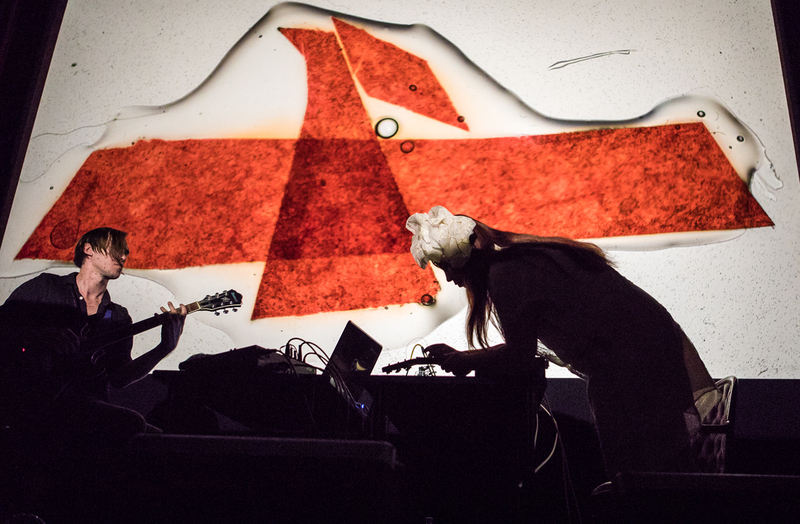 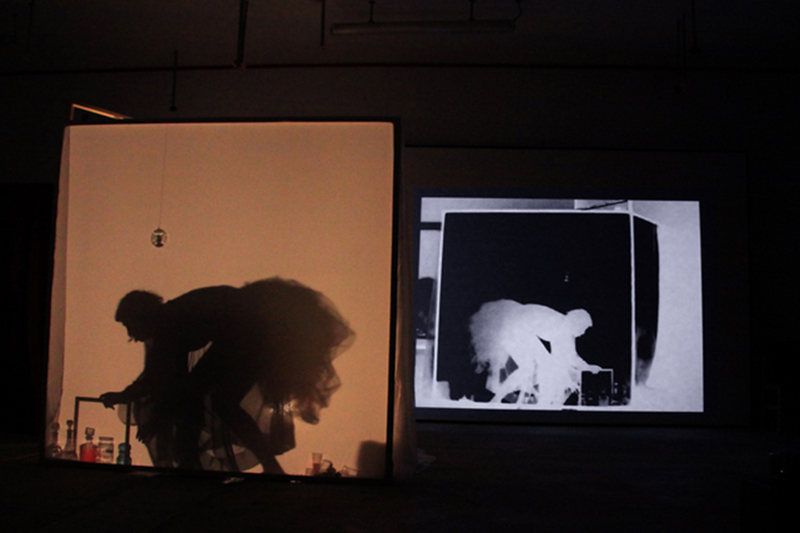 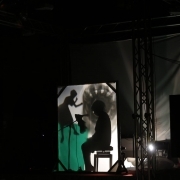 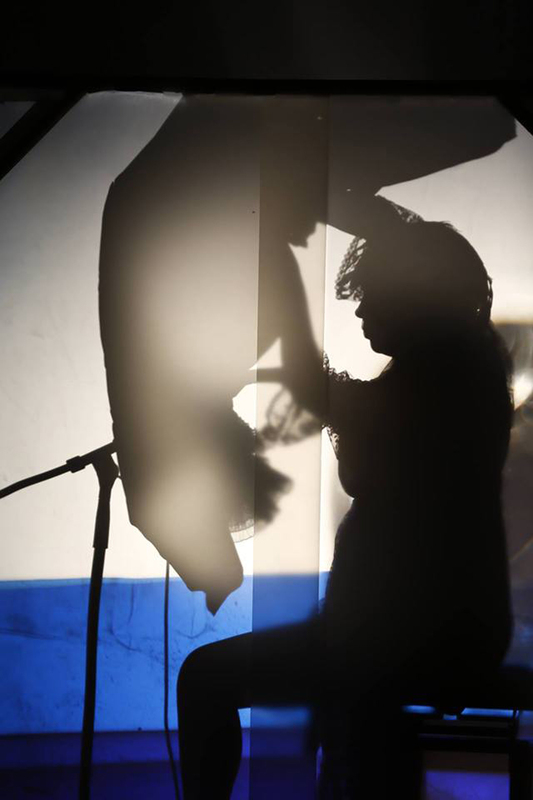 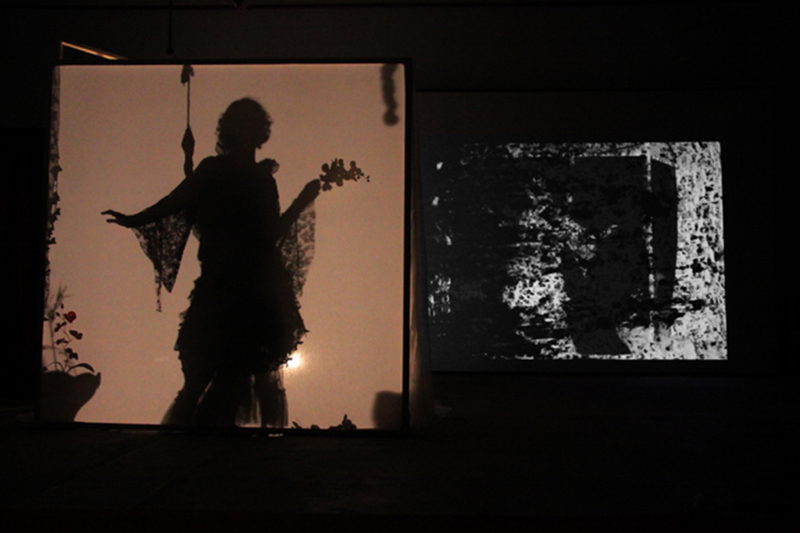 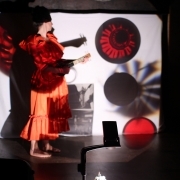 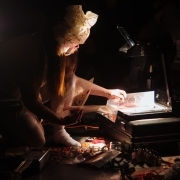 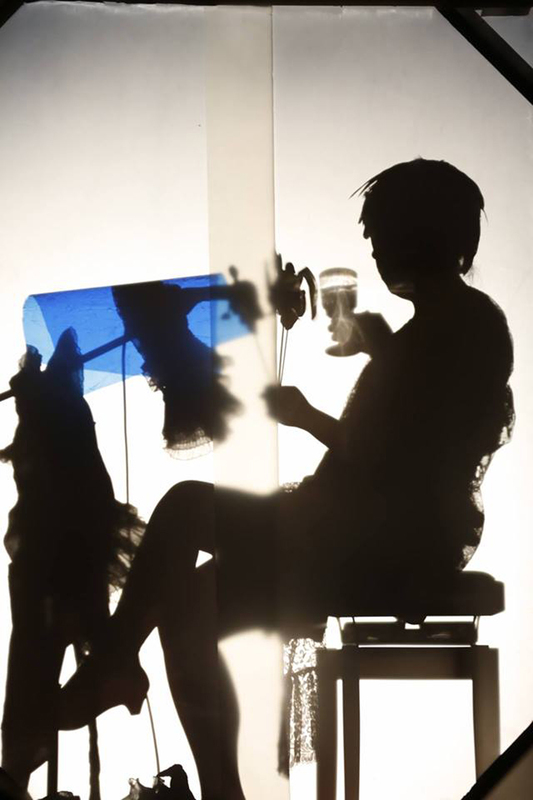 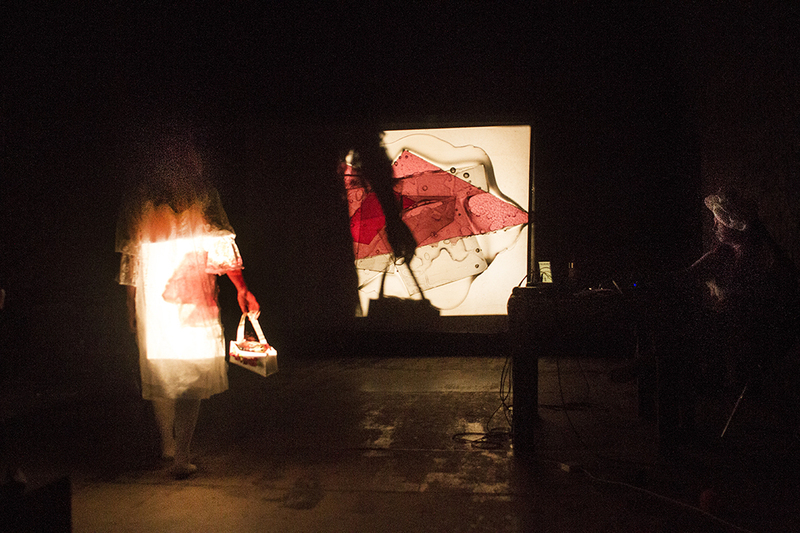 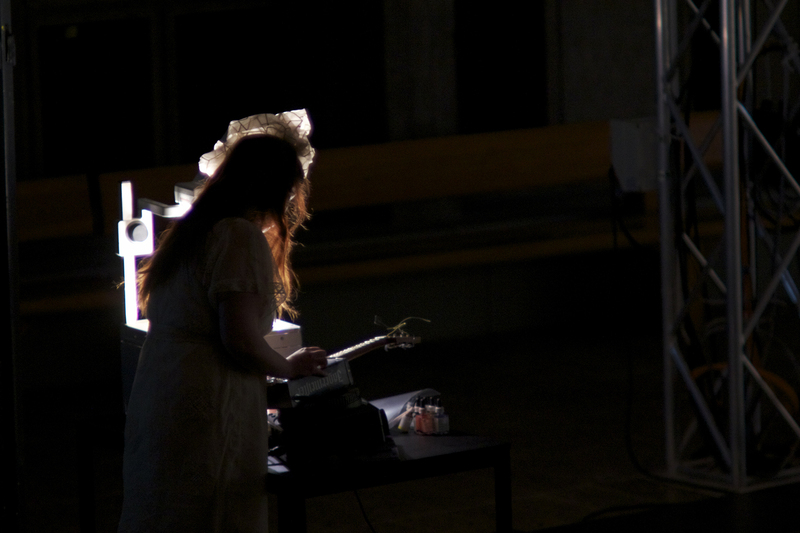 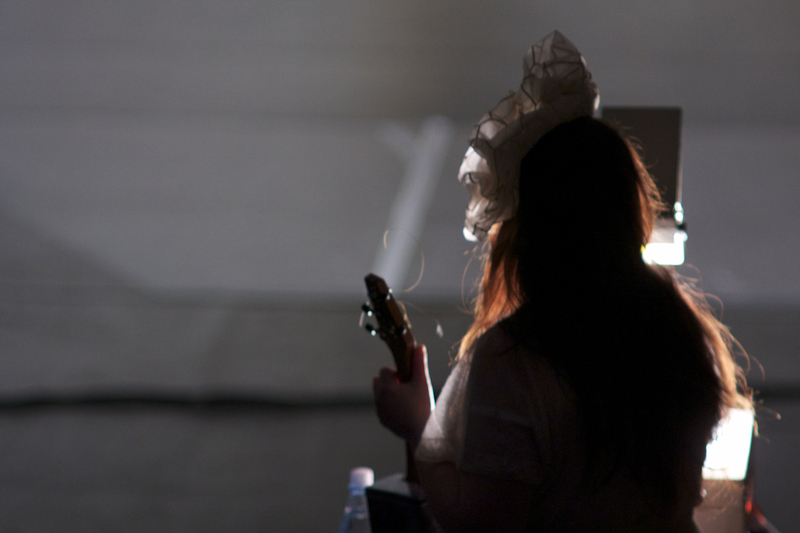 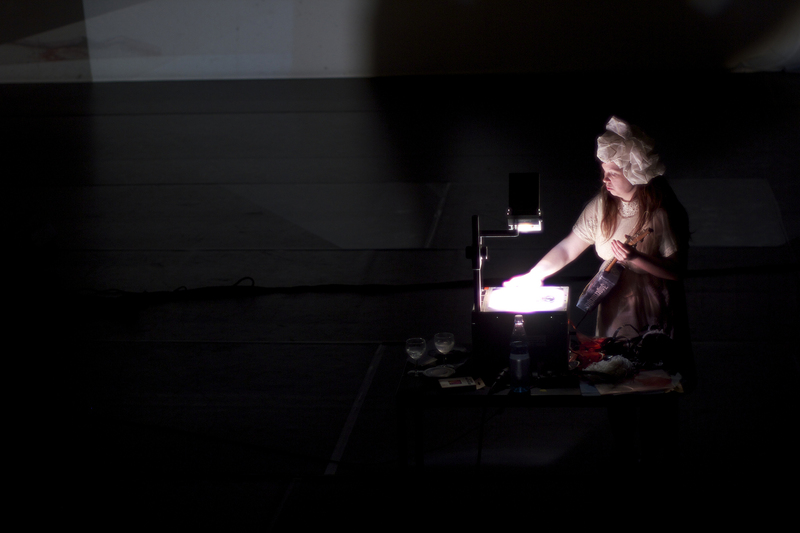 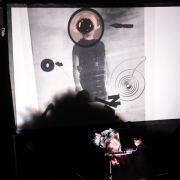 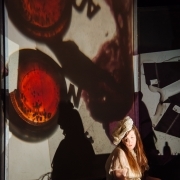 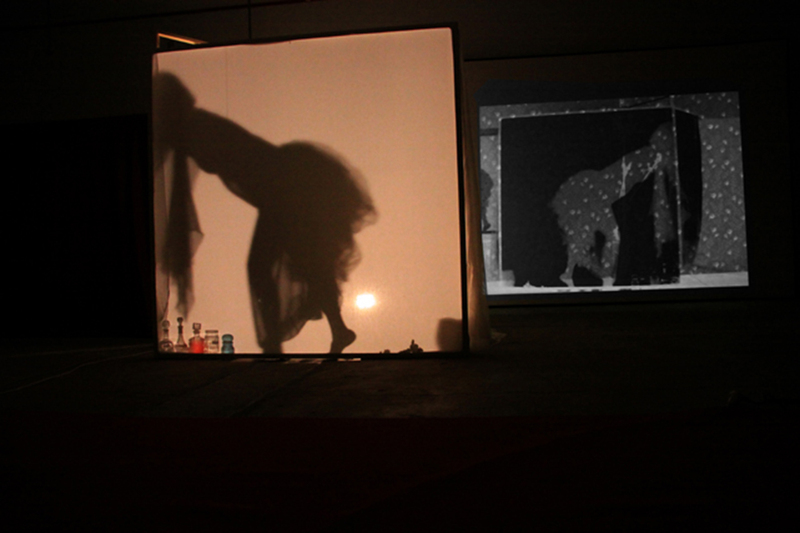 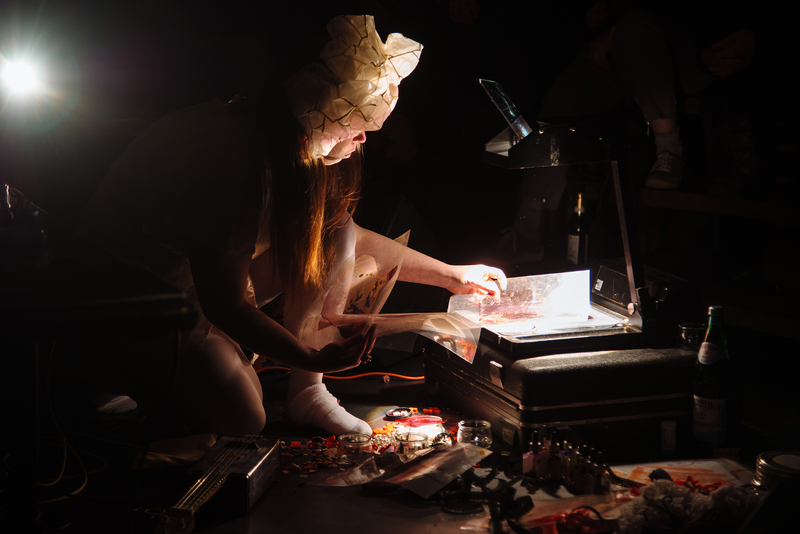 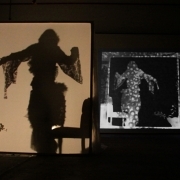 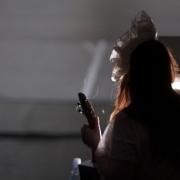 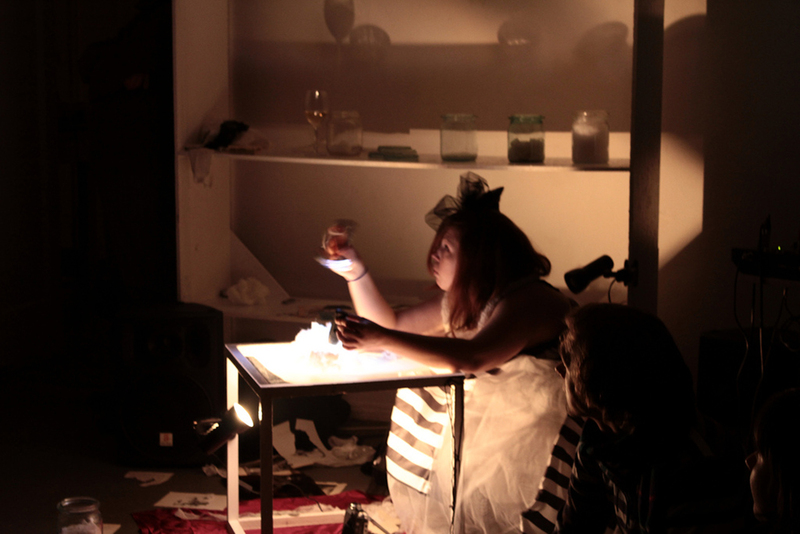 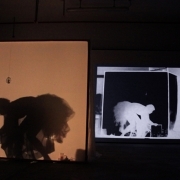 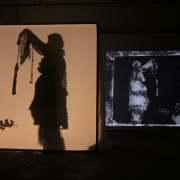 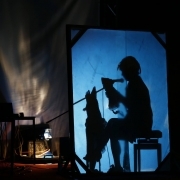 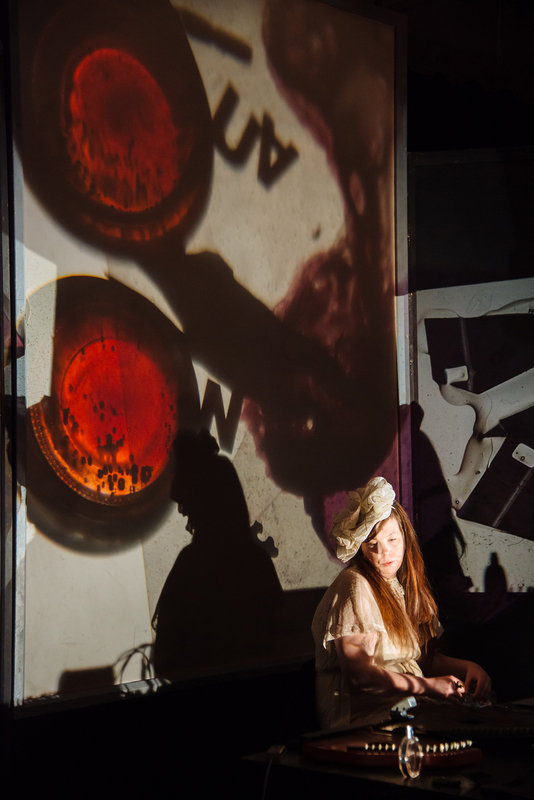 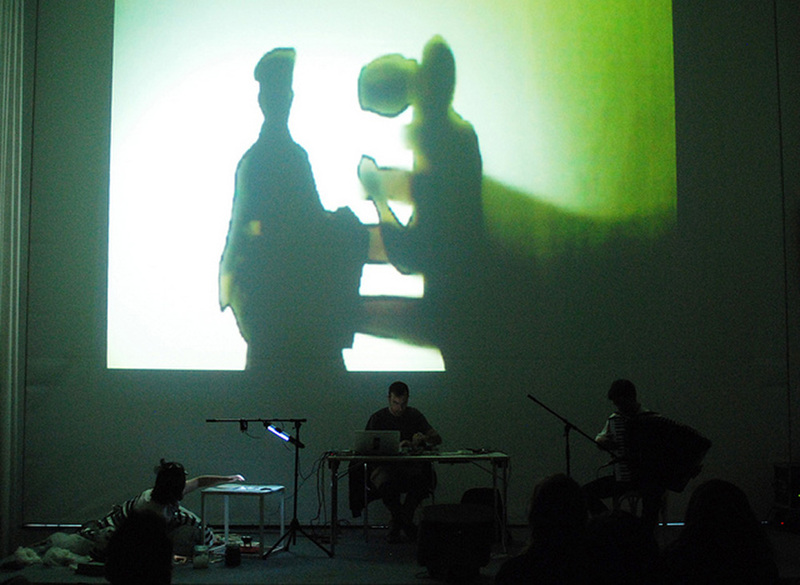 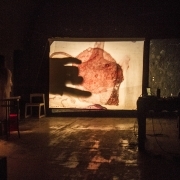 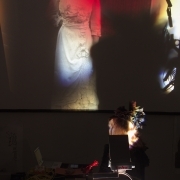 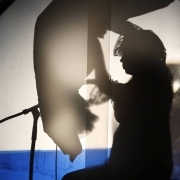 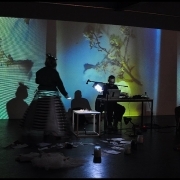 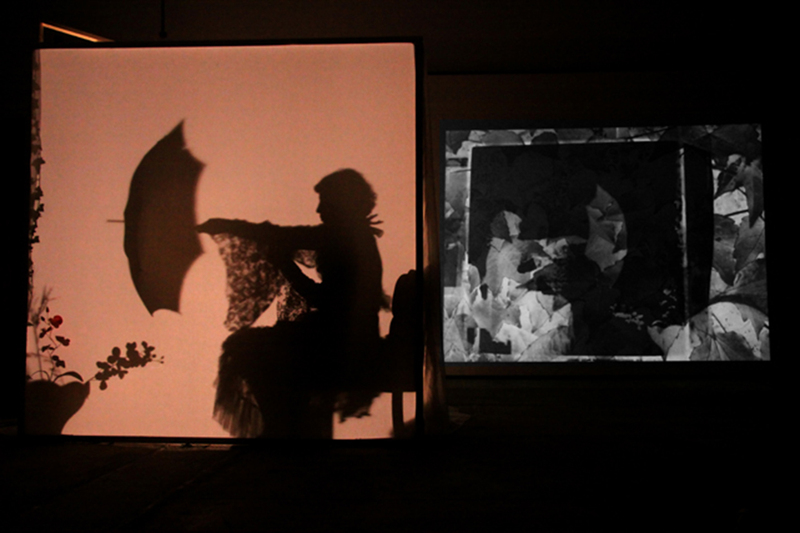 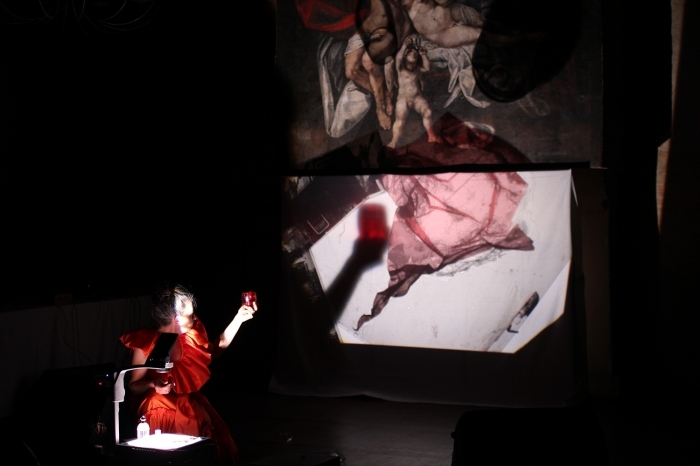 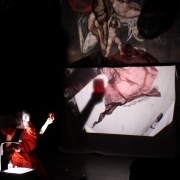 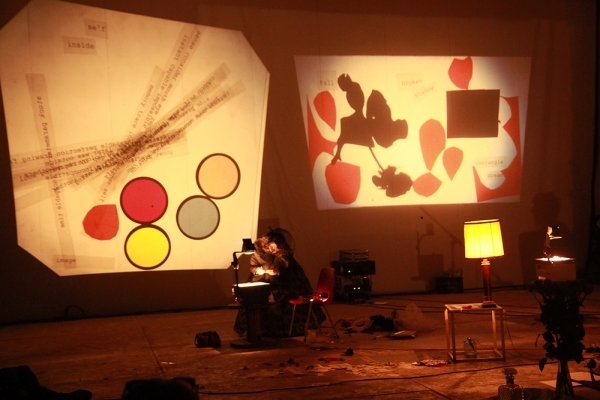 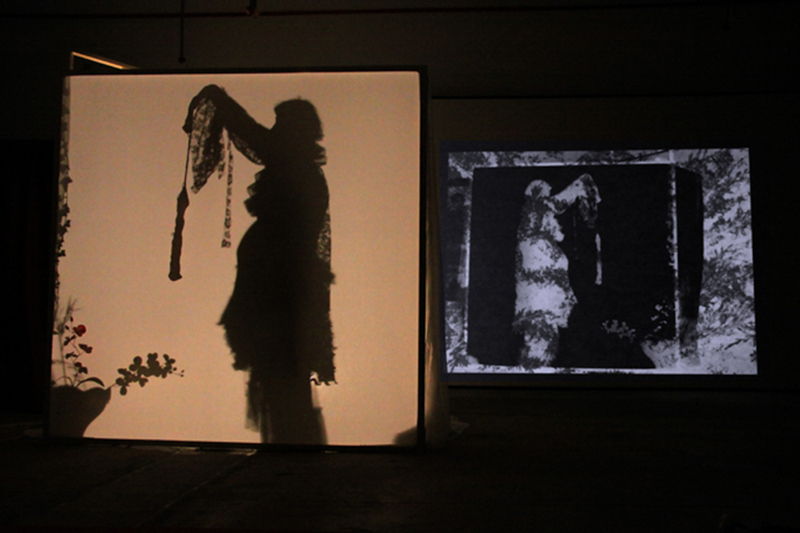 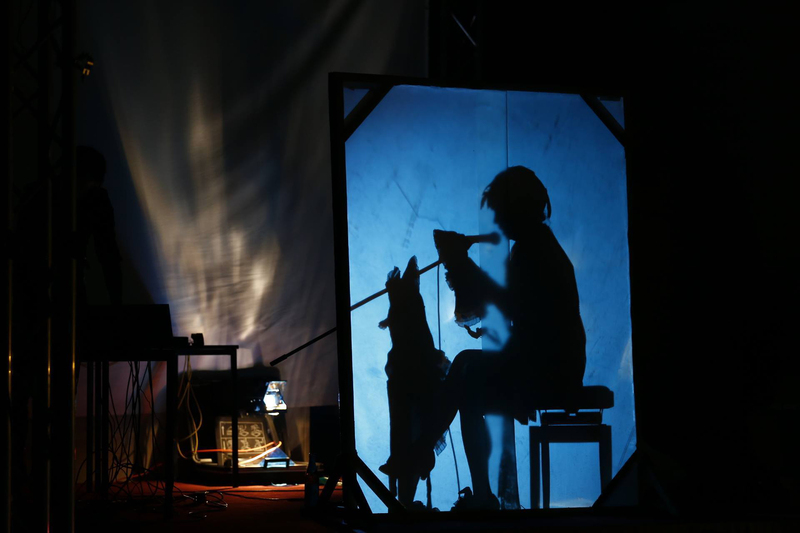 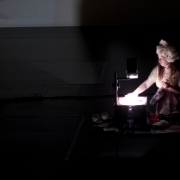 The two performers dressed in white lace costumes interact on the scene, playing with the projectors, interacting with material elements creating moving shadow play. 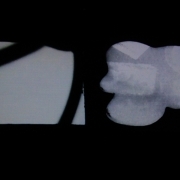 They move on the scene and exchange position, like two ghost figures interacting with the pulsating light and sound. 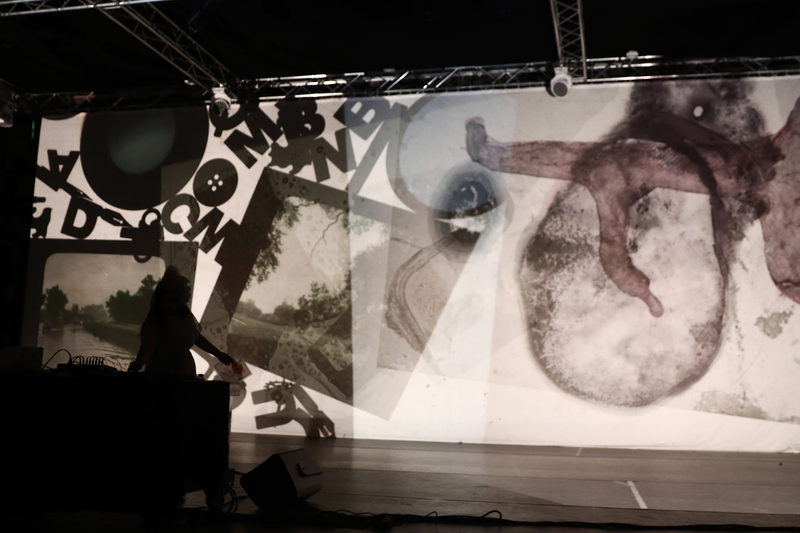 The figures are a sort of surreal apparition of the body, shaping the light with symbolic elements diffracting the beams of the projection and creating an immersive space of fragile poetry. 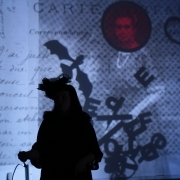 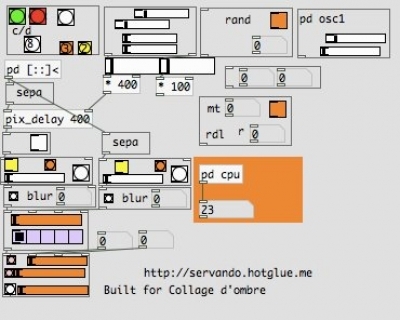 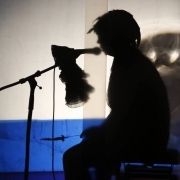 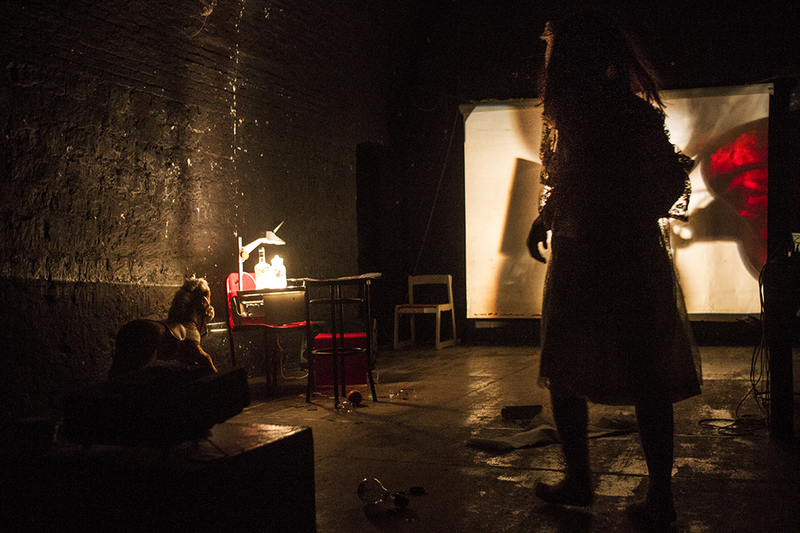 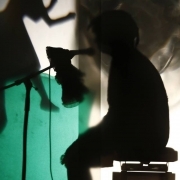 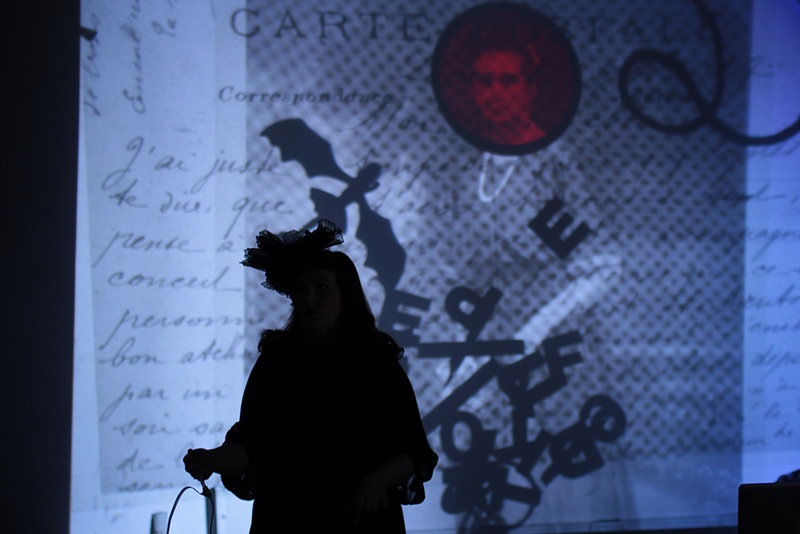 “Cauchemar” is text based experimental performance inspired by Antonin Artaud. 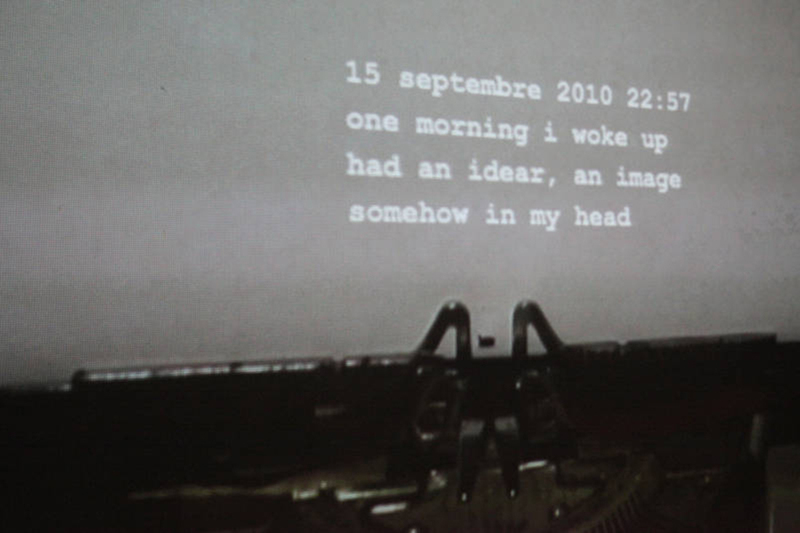 The spoken words are slowly distorted becoming the hallucinated voice of the imaginary persona trapped inside a nightmare. 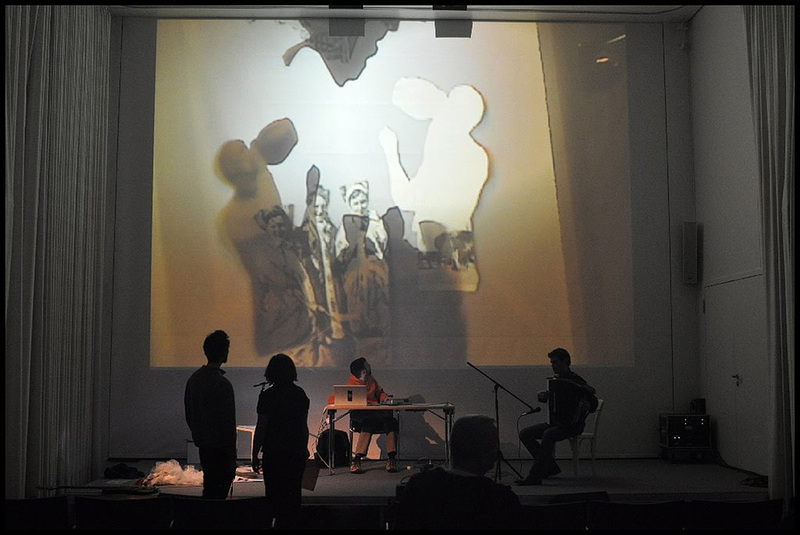 Combining guitar, effects units, shadow play and irrational poetry, the performance immerses the viewer in the audio visual poetry collage. 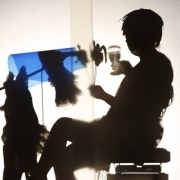 The figure speaks an improvised poetry telling about the imaginary experience on morphine where the body trapped in the unbearable pain finds mental dispositif of survival. 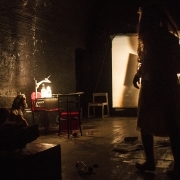 The imaginary persona splitts into different stories and scenarios of the nightmares experienced under the infuence of the drug, fragments of splitted memory are reactivated and deformed inside a disturbing monologue. 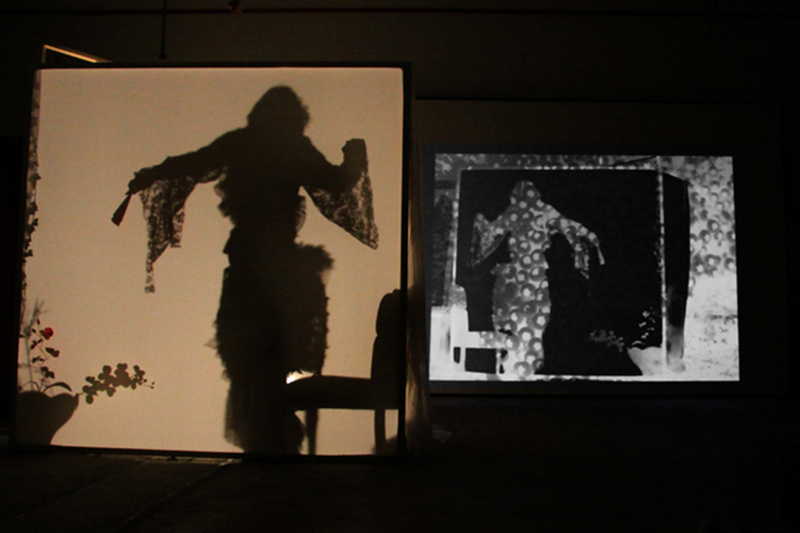 The project is a cathartic metaphor on how to transform reality into fction, revealing the fragility of the human body.The shadow figure plays with light and paper cuts, interrupting and punctuating the voice improvisation. 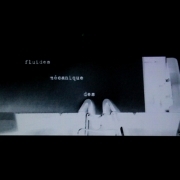 Cauchemard premiere at museum Galiläakirche from AudeRrose on Vimeo. 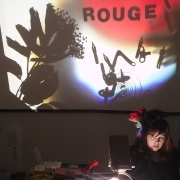 Rouge sang from AudeRrose on Vimeo. 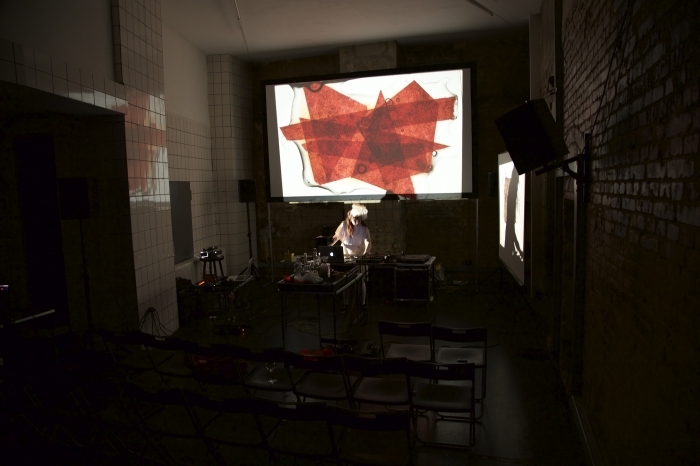 Special thanks to Lieke, Alfredo, Pharaz, Khanh, Mo, Wolfgang and all the friends and audience who came and support my work. 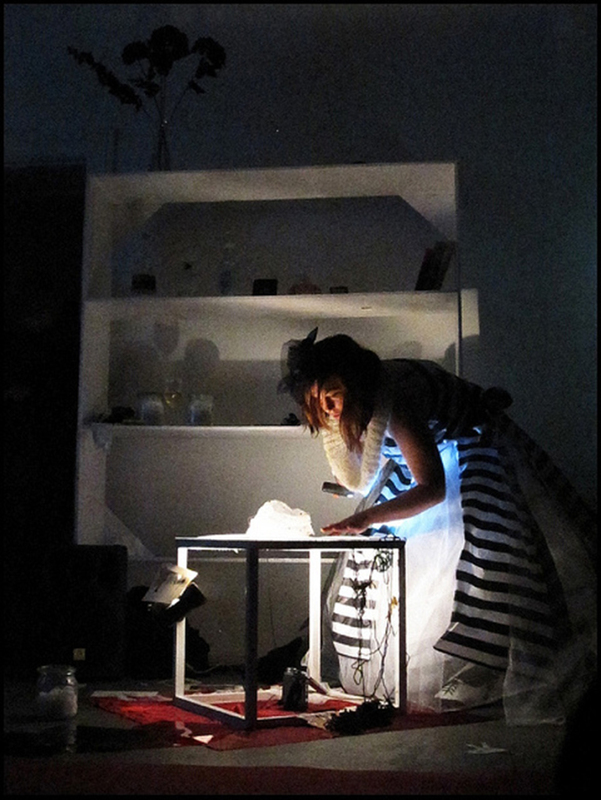 The performance is a sort of shamanic experience on how to transform reality into fiction exploring the idea of catharsis as an essential mode of survival. 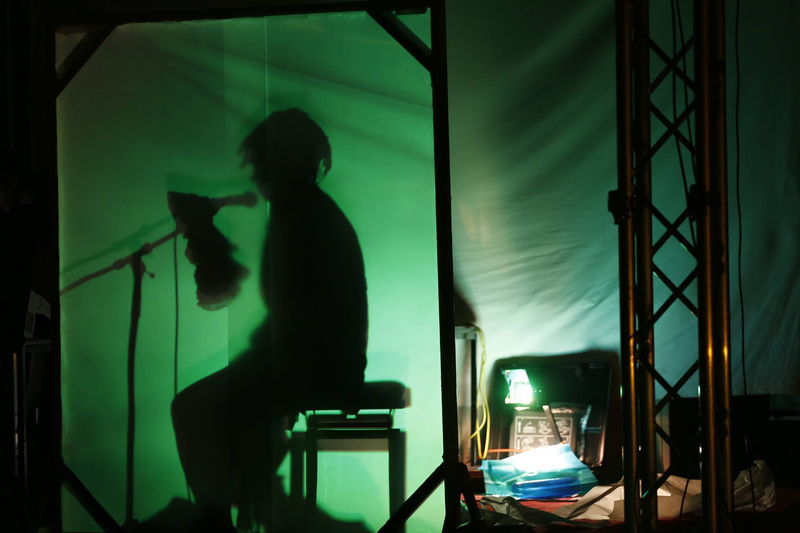 How can reality be transferred into an immersive fiction? 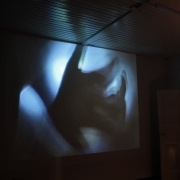 The image becomes another reality that can be release from the memory and generate the necessary oblivion of the unbearable lightness of the being. 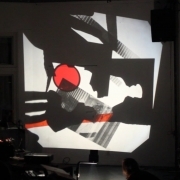 Le paradis rouge et l'oiseau impossible at Shiny Toys Festival from AudeRrose on Vimeo. 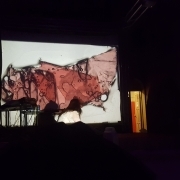 Was playing “Le paradis rouge et l’oiseau impossible” in Augsburg on the 28th november 2016 in the little theater! 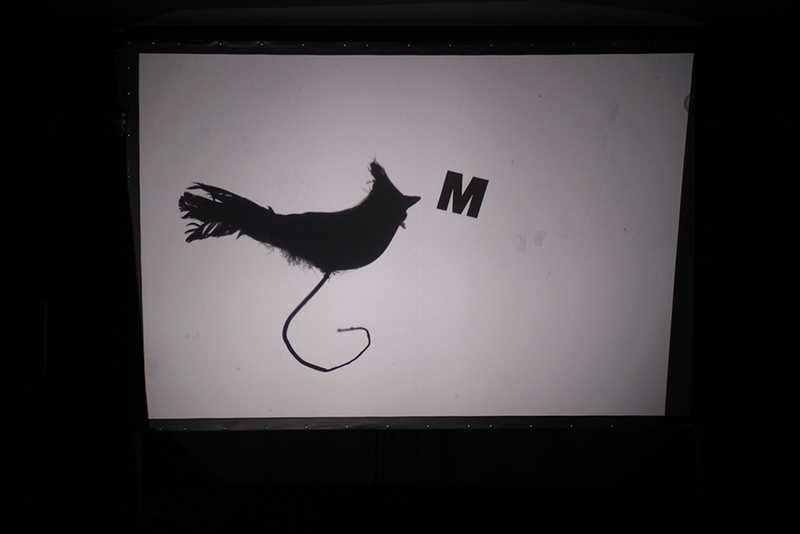 Le paradis rouge et l'oiseau impossible at Lab30 from AudeRrose on Vimeo. 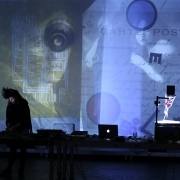 Rotative memory live at Spektrum from AudeRrose on Vimeo. 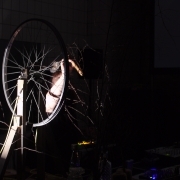 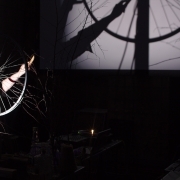 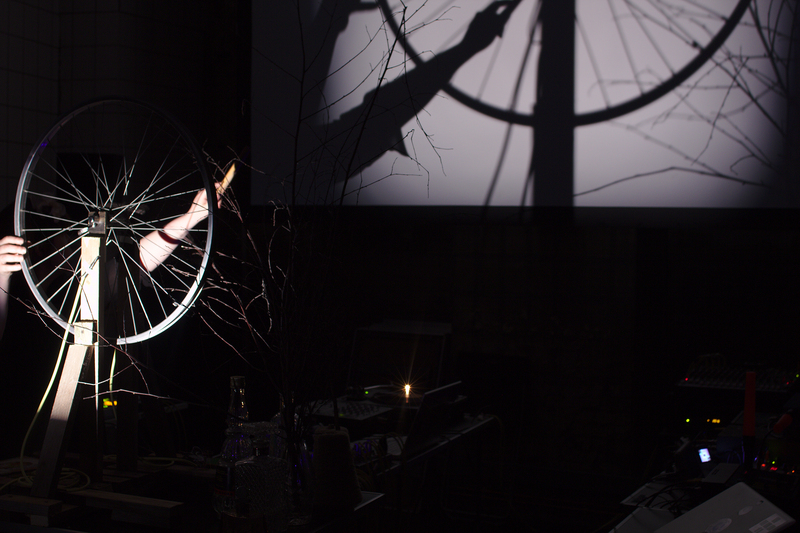 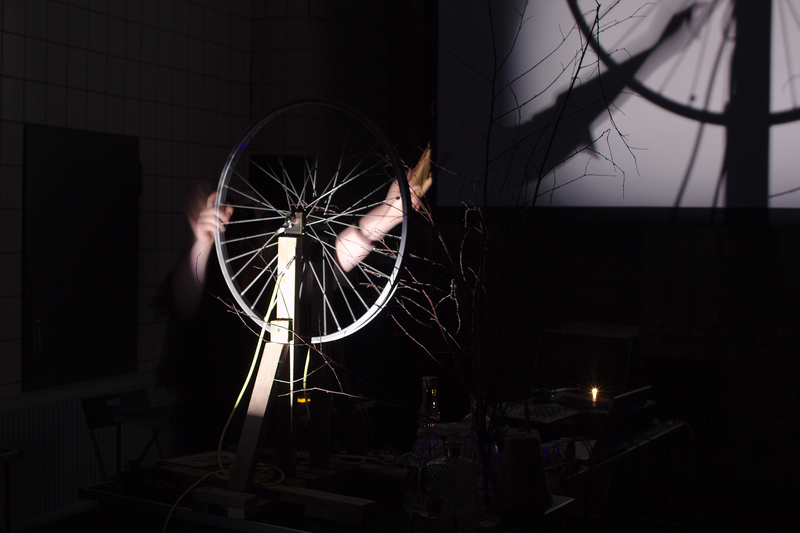 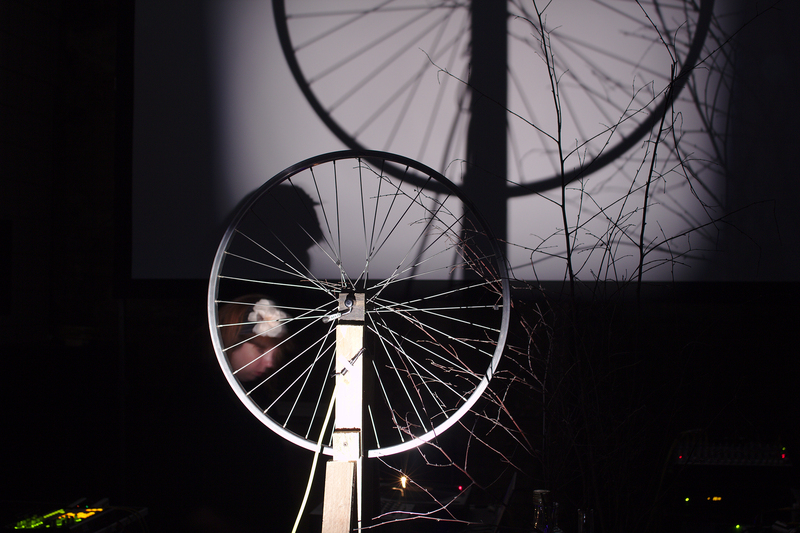 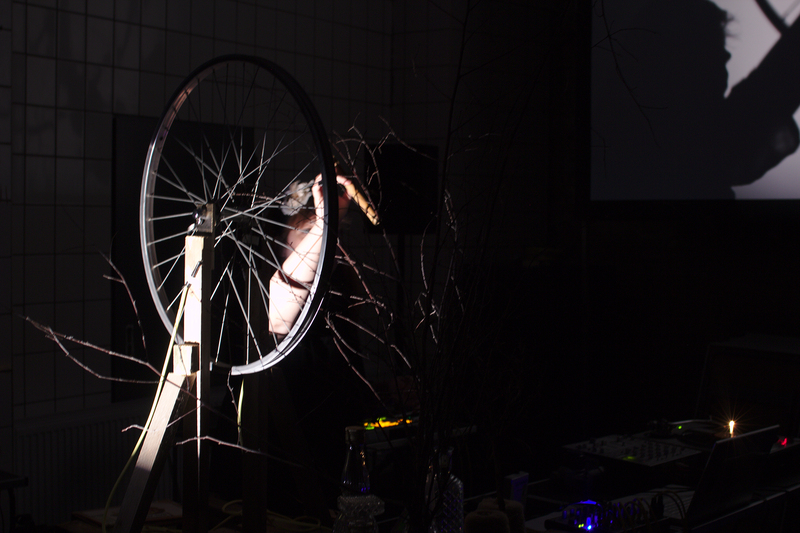 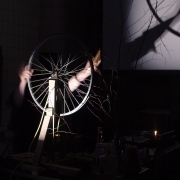 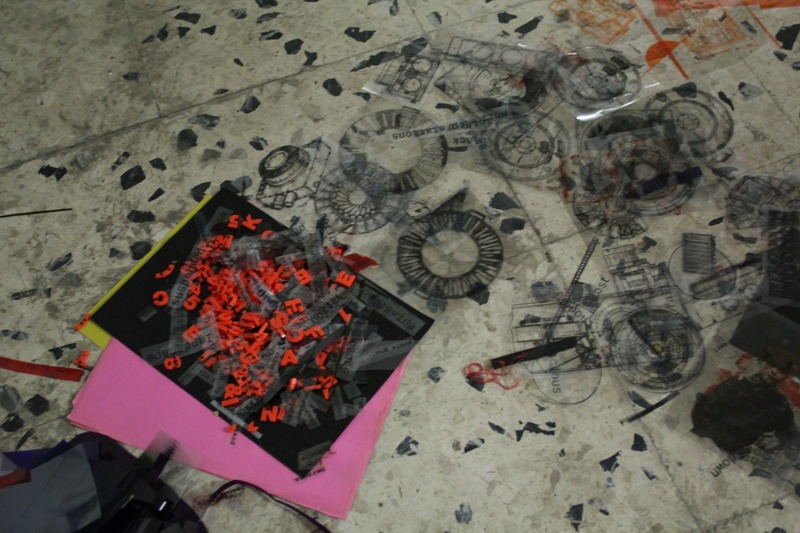 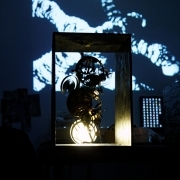 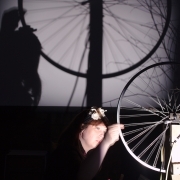 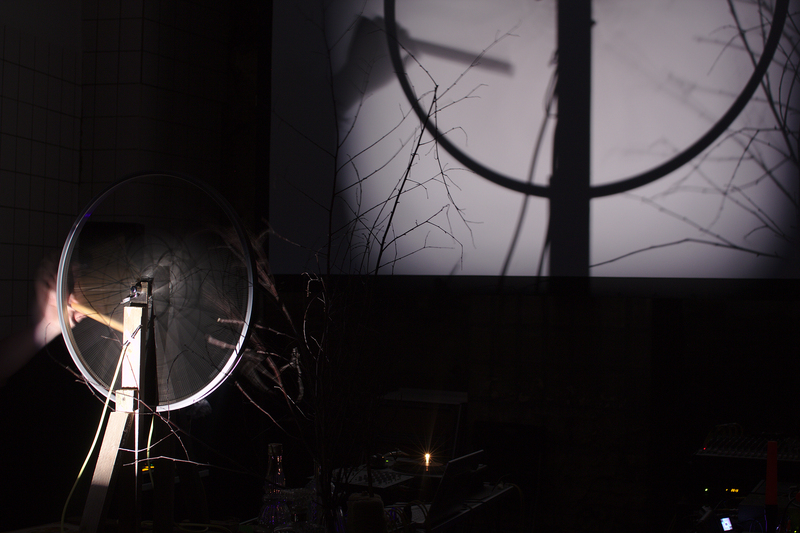 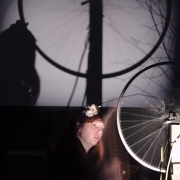 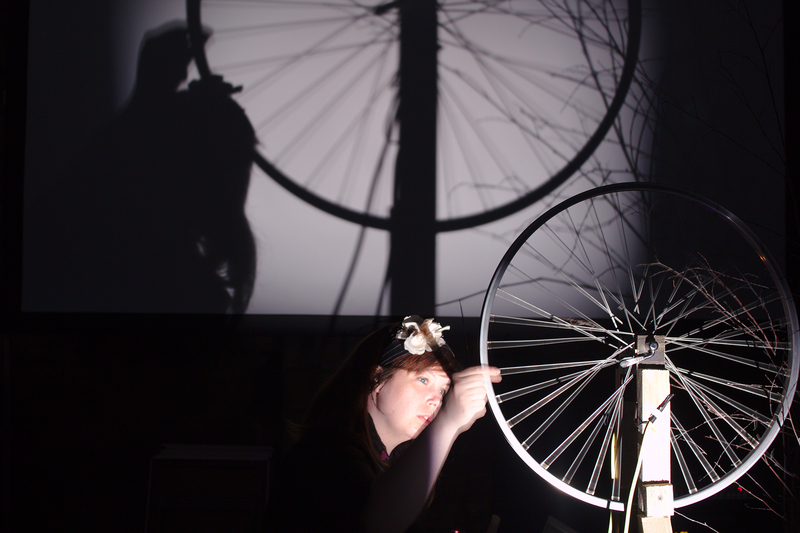 “Rotative memory” is the shadow tale of the infinite movement of rotating bicycle wheel. 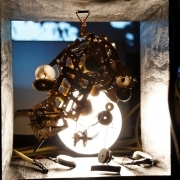 On the stage a collection of mechanical objects explore different variations of circular movements. 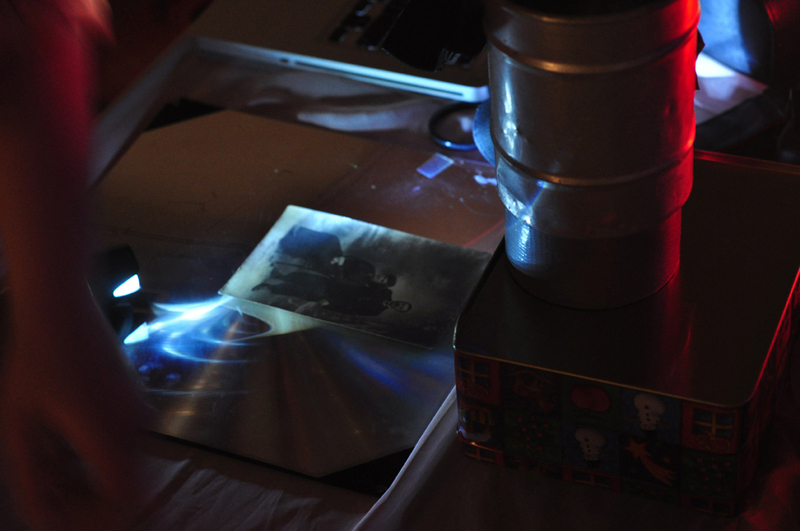 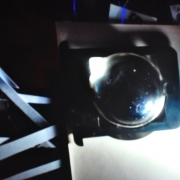 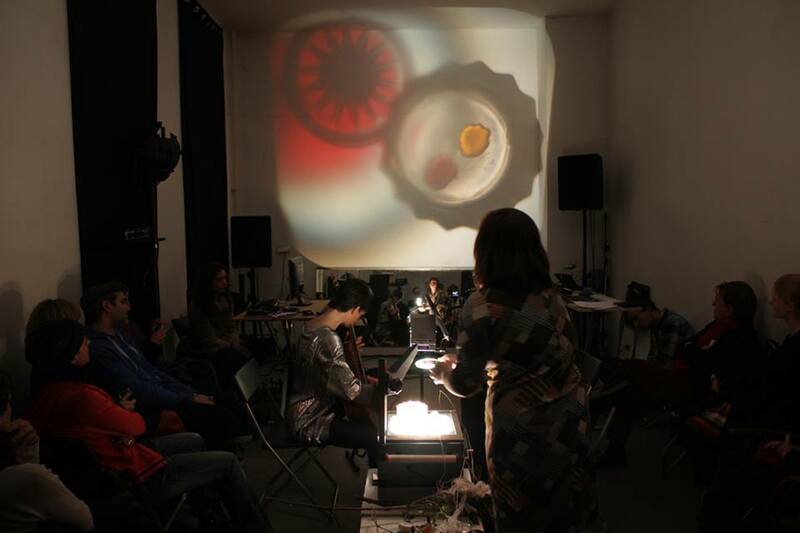 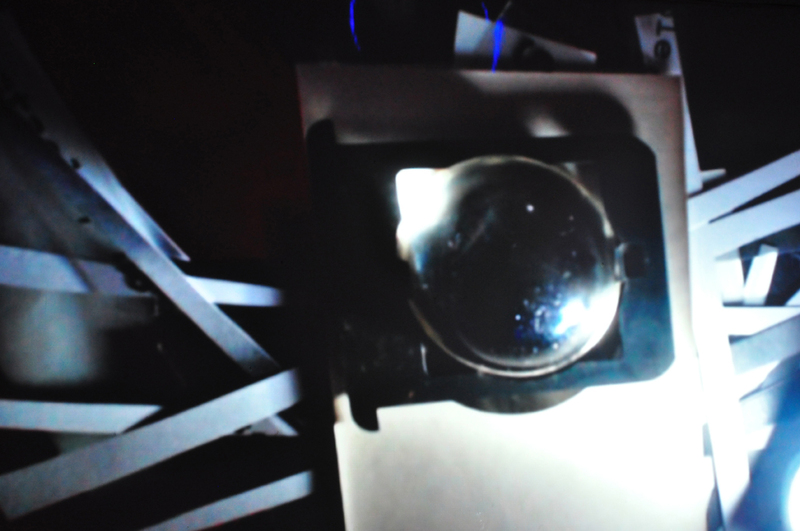 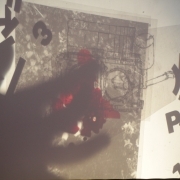 The elements are creating moving shadows inside the room with an overhead projector and a Super 8 projector alternating light sources and diffracting the shadows of the rotating wheels. 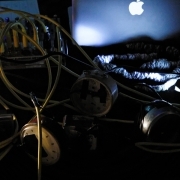 A collection of sound objects, phone, wheel, turntable (…) are picked up with piezo microphones, creating a metallic and mechanical sound patterns slowly modified in real time. 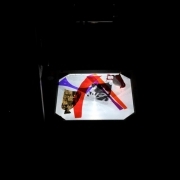 A fragile moving mirror sculptures made with servo motors is turning in the middle of the space alternatively diffracted by the light beams. 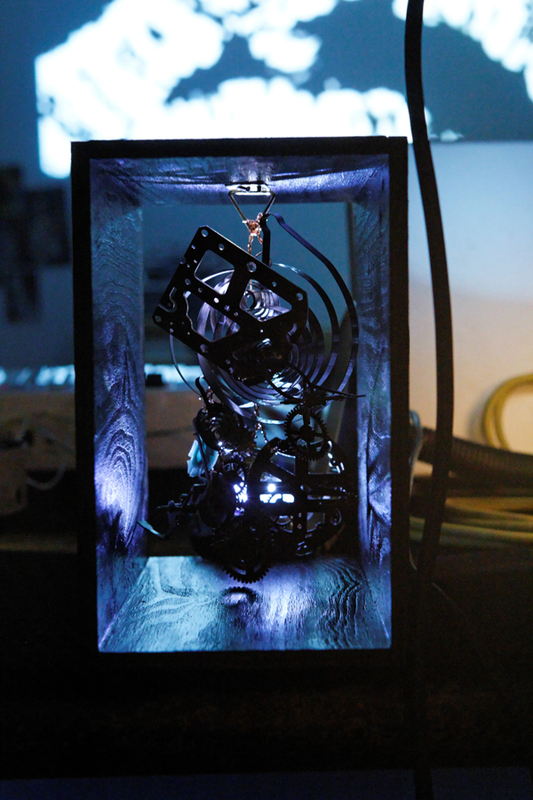 Finally a homemade electronic suitcase hides the surrealist treasures of another secret electronic apparatus. 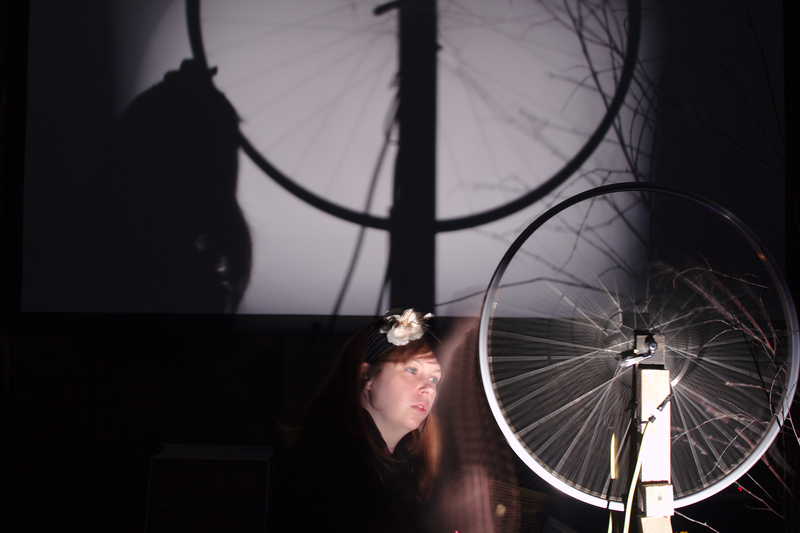 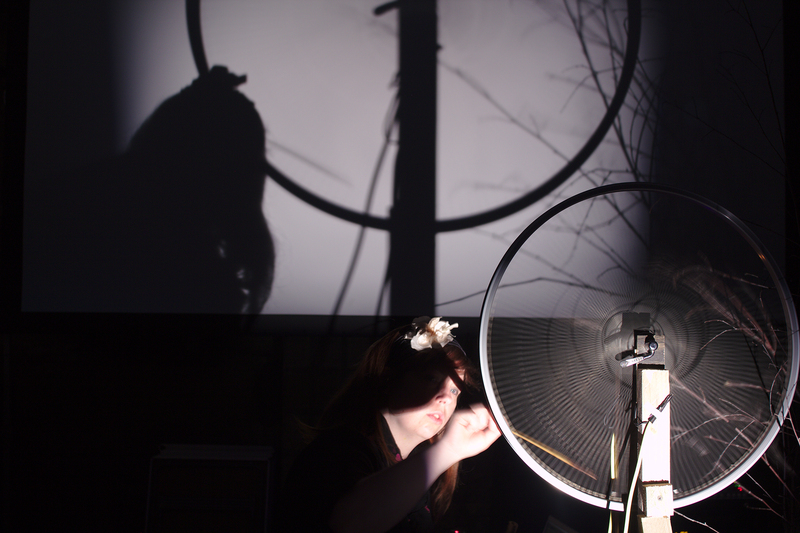 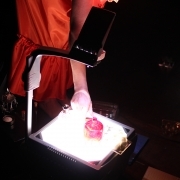 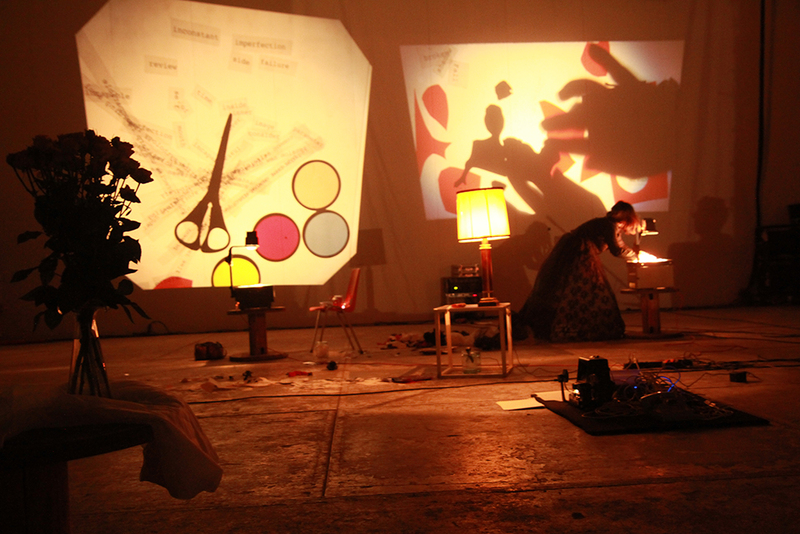 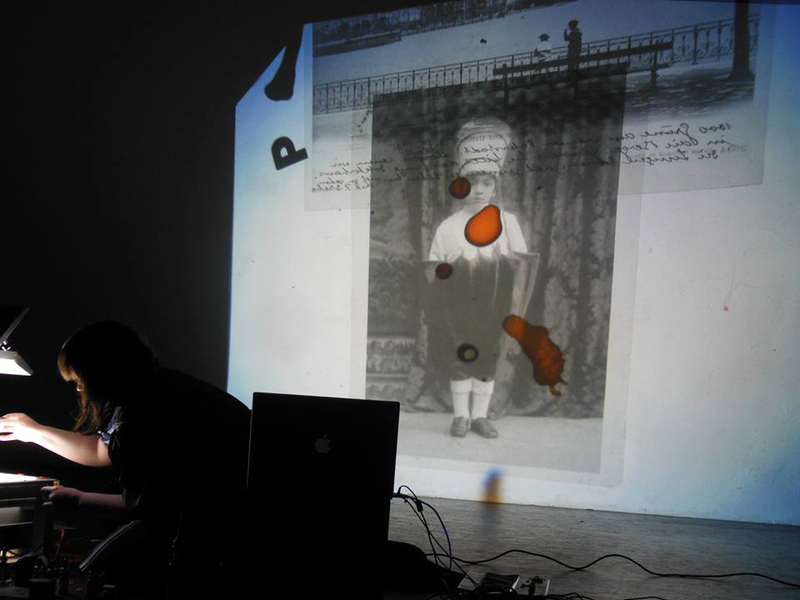 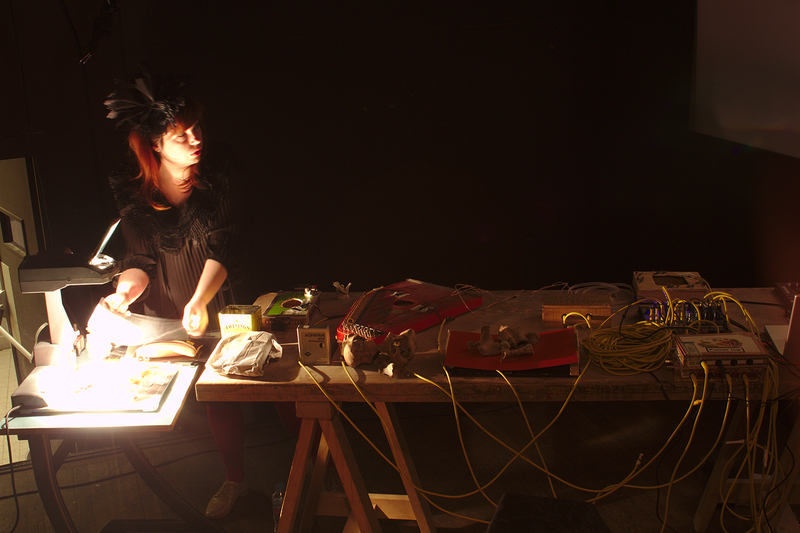 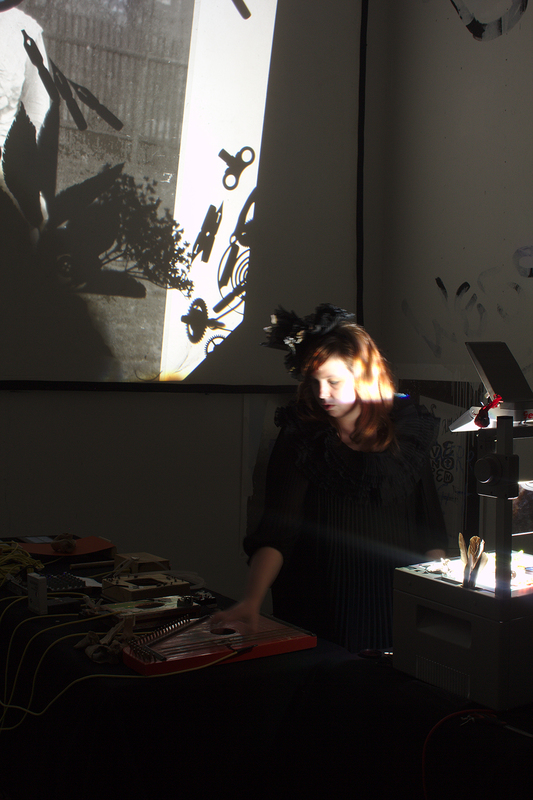 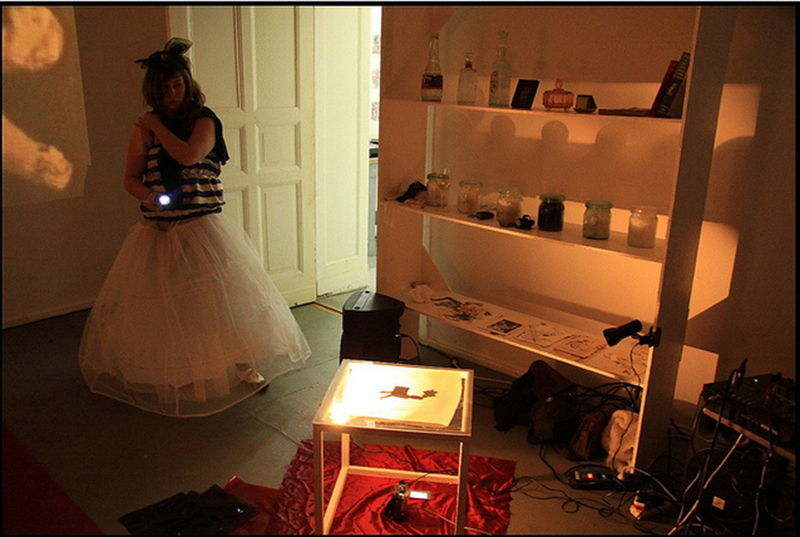 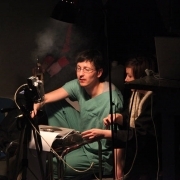 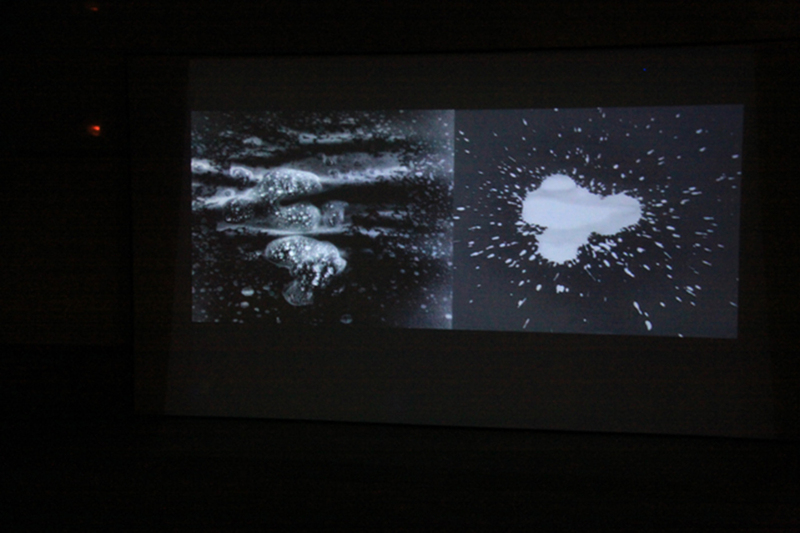 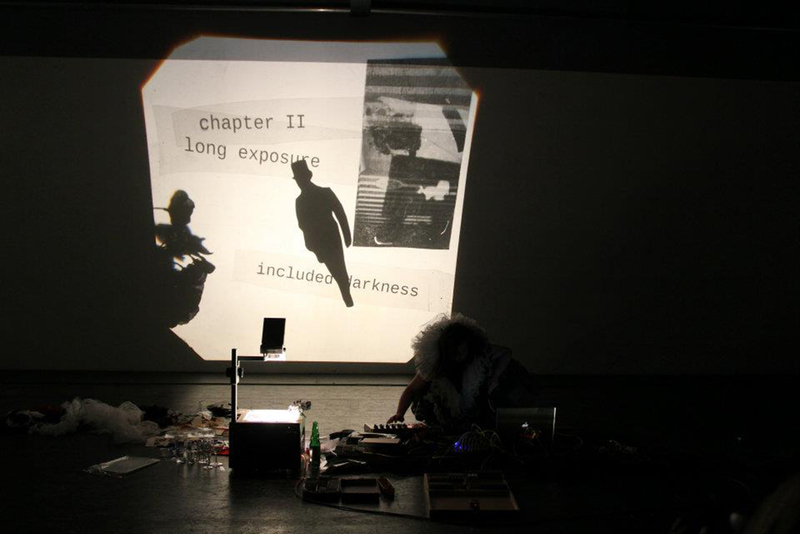 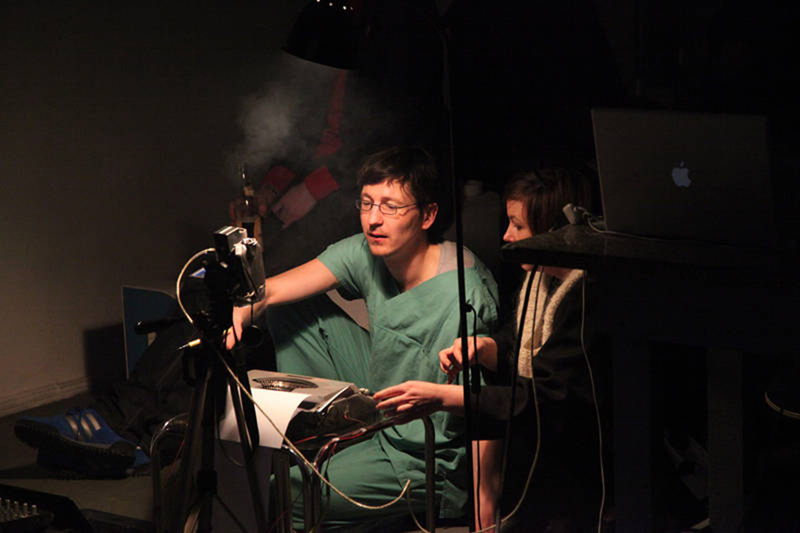 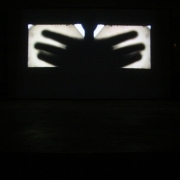 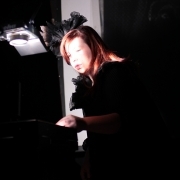 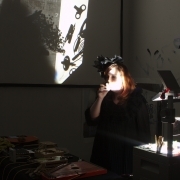 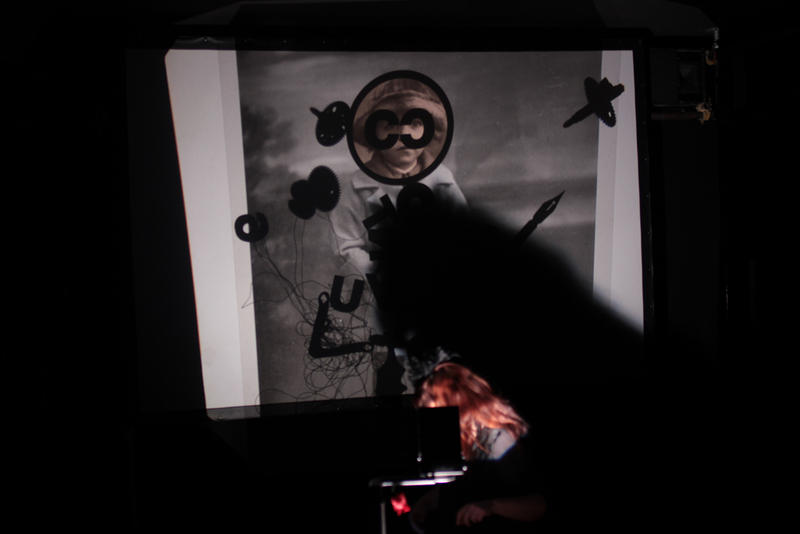 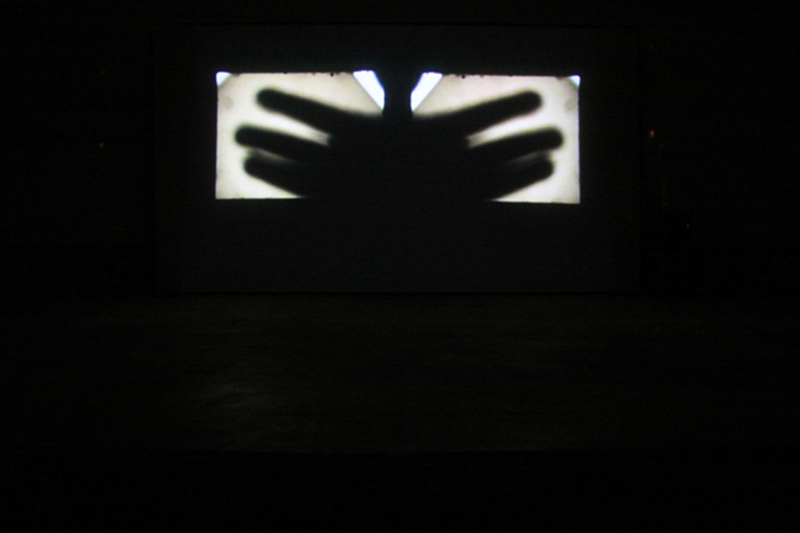 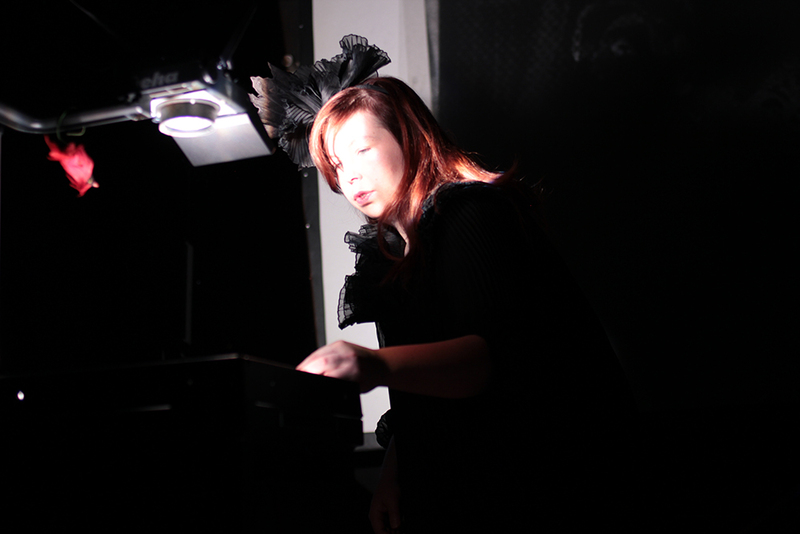 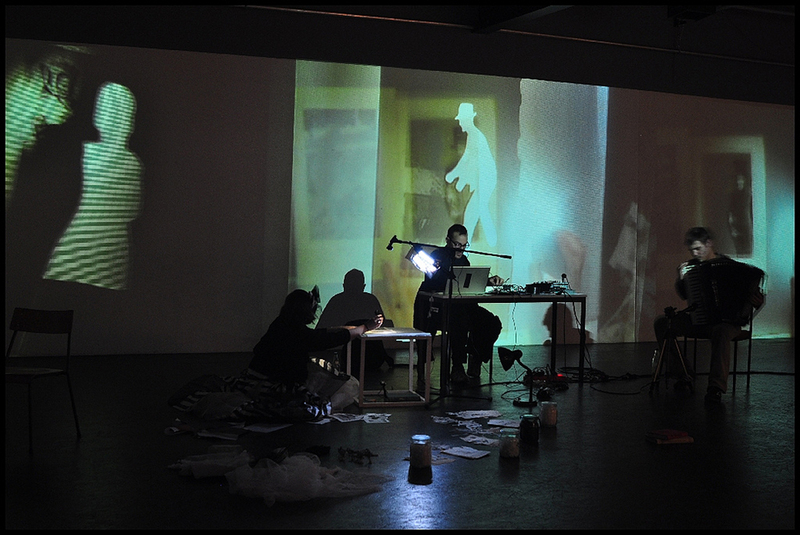 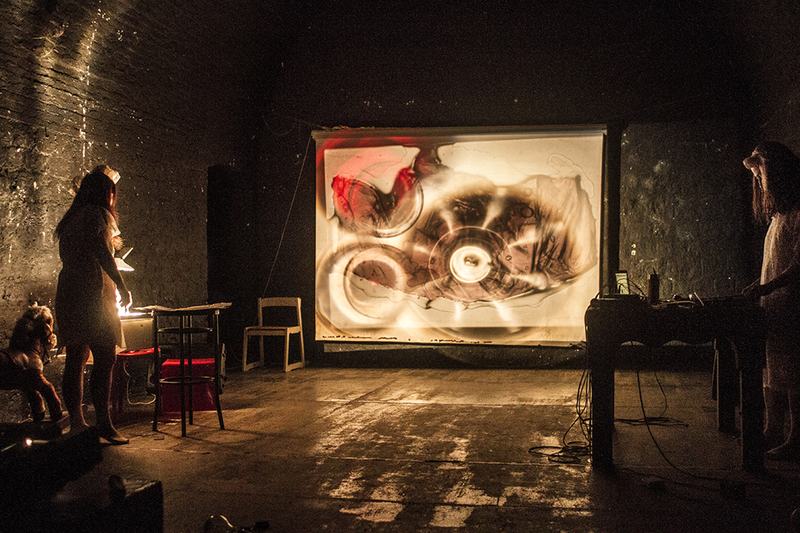 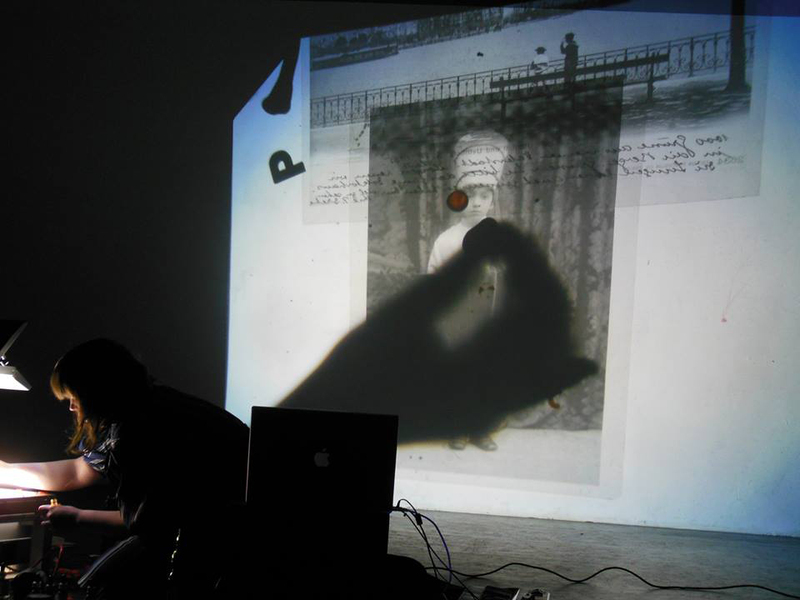 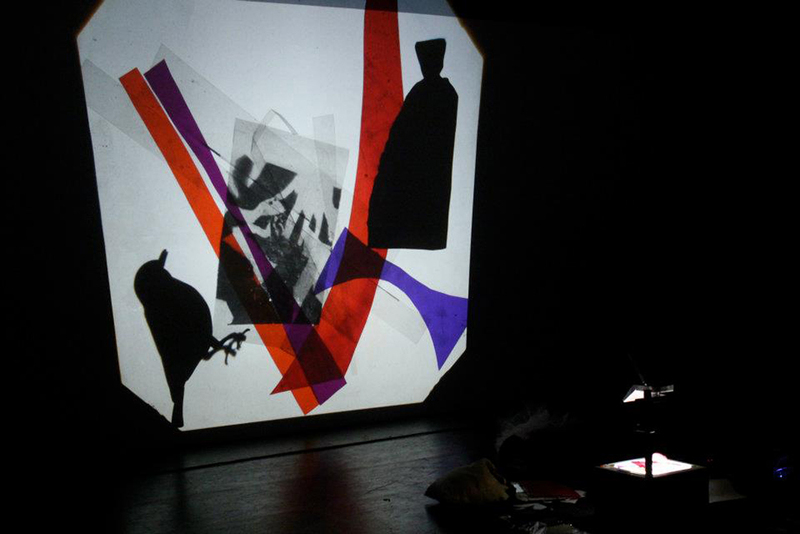 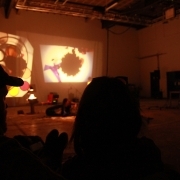 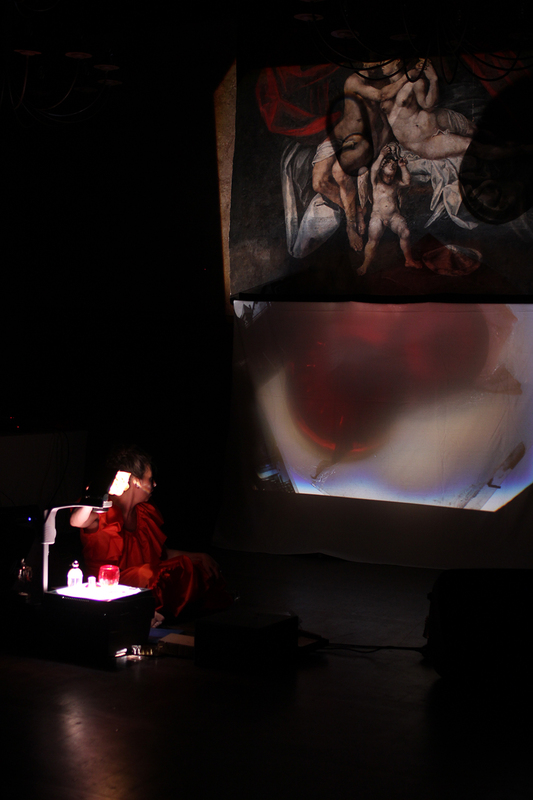 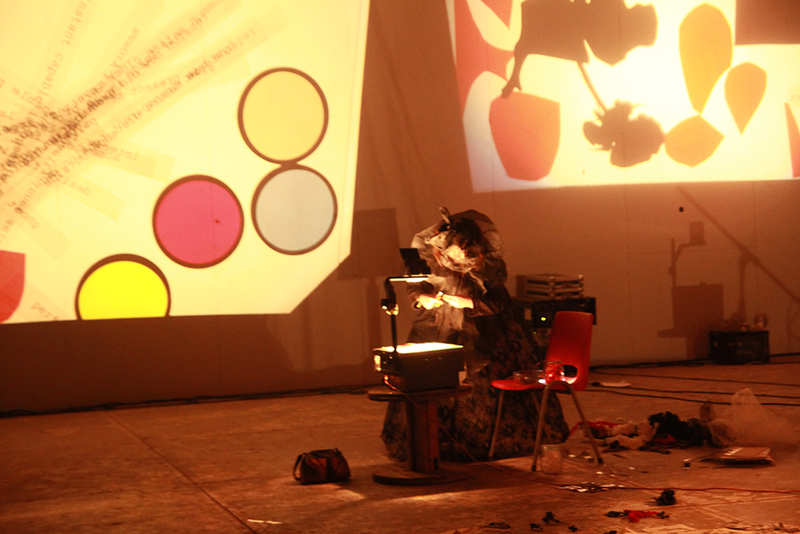 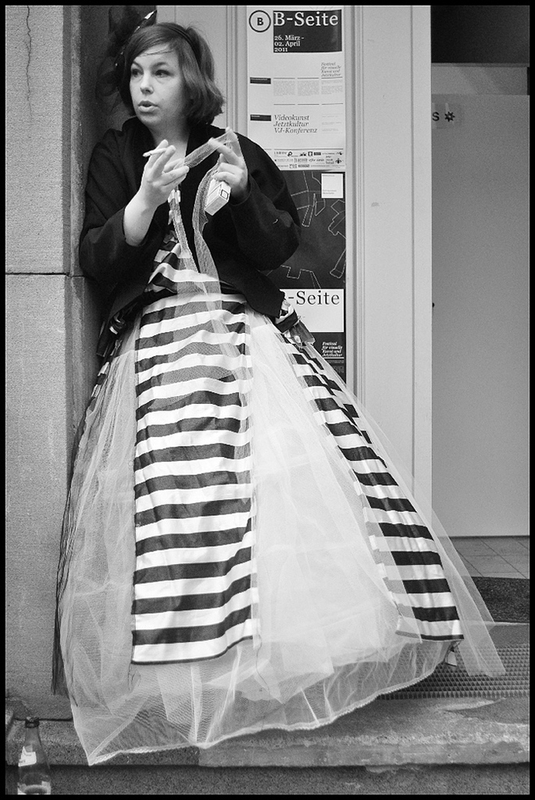 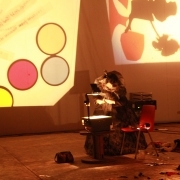 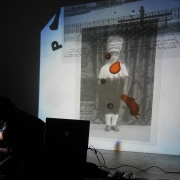 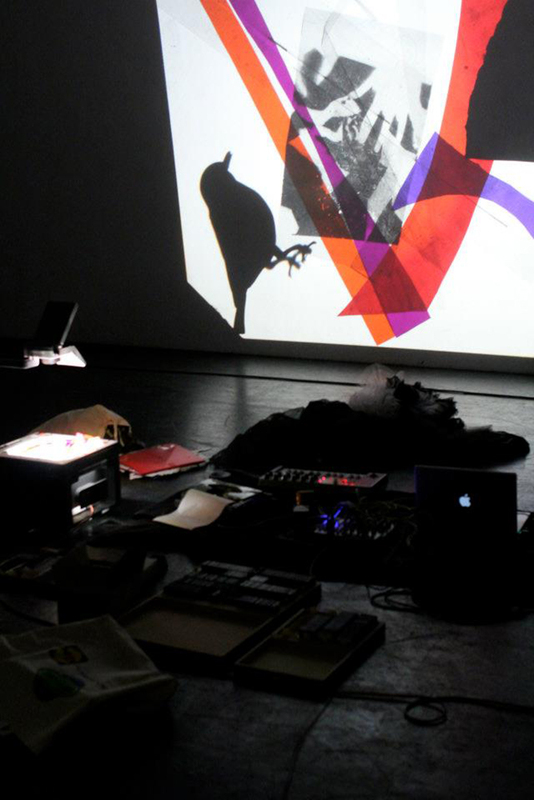 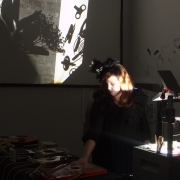 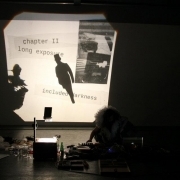 AudeRrose is multi-disciplinary artist working with performance, photography, sound and projection. 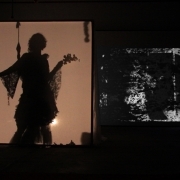 Her imagery plays with narrative structures, developing dreamy and intimate universes, exploring various forms of interplay between body, images in motion, deconstructive narrations and self-mythology. 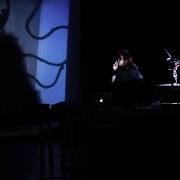 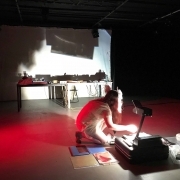 Her performances articulate live scenography protocols integrating the projection as an environment medium, considering the black box as a possible oneiric space, where sounds and images communicate in a narrative journey. Was playing “Le paradis rouge et l’oiseau impossible” in Mannheim on the 27th may, was very special moment! 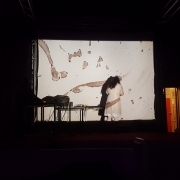 Thanks so much to Sqar, Robin, Melanie, and all the festival organisation to make this possible and to the audience who came to see the show. 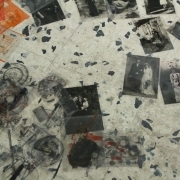 Fragile fragmented memory trace, the paradise birds were singing inside a metaphorical dream bubble. 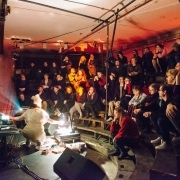 In the run-up to this year’s Schwindelfrei festival, the Mannheim linguist activists at wortbruch invite you to take part in two excellent events that open up new scope for words: on 27 May there will be an audiovisual tale of the future, Le paradis rouge et l’oiseau impossible mit Aude Rose. 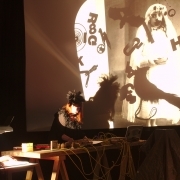 And on 29 May, the musicians from LEKTRON will plunge into Padget Powell’s English language novel, The Interrogative Mood. 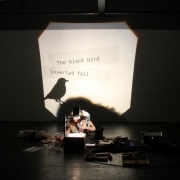 Le paradis rouge et l'oiseau impossible at Theater festival Schwindel Frei from AudeRrose on Vimeo. Playing live in Paris at Centre Mercoeur, was a very special moment! 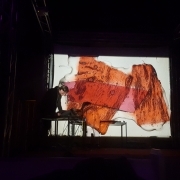 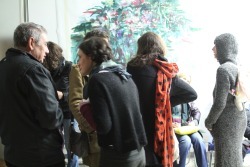 Thanks so much to Sqar, Laurent and all the visionr team, homemade collective, centre mercoeur and all friends and family who came! 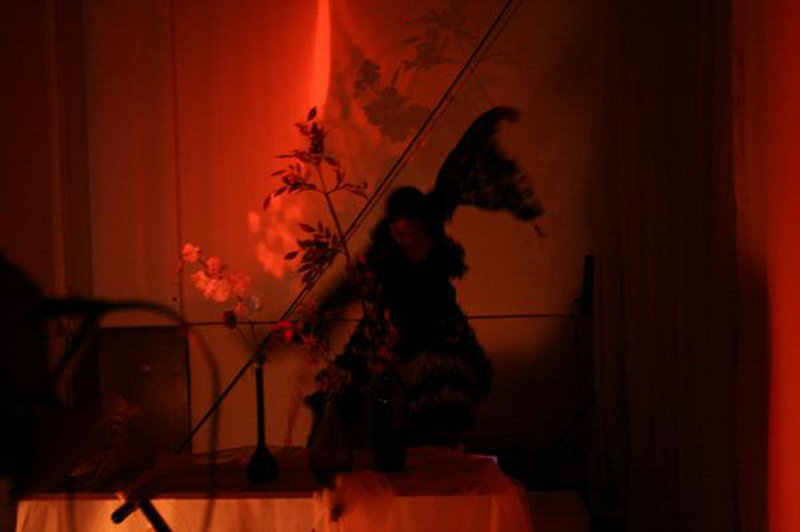 It was a magic strange fragile moment suspended inside a fragment of memory. 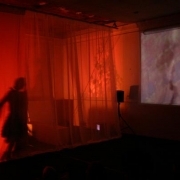 Le paradis rouge et l'oiseau impossible live at visionr festival from AudeRrose on Vimeo. 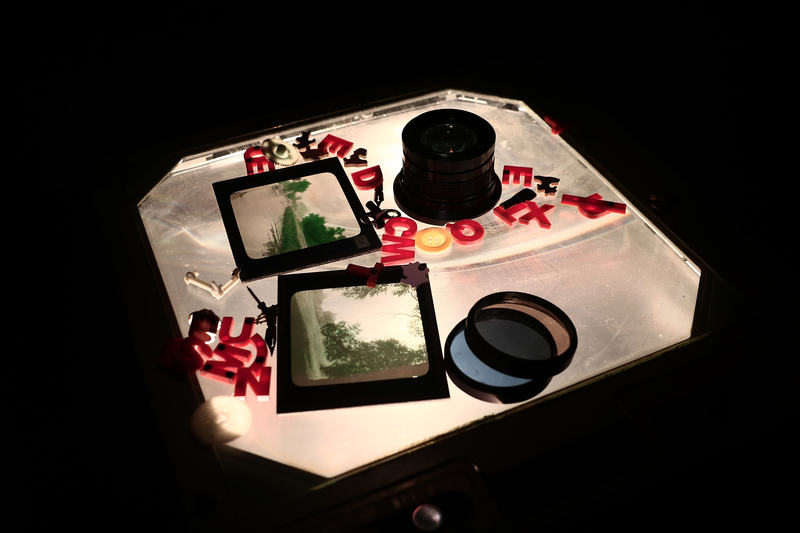 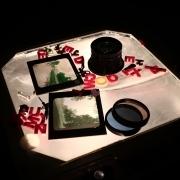 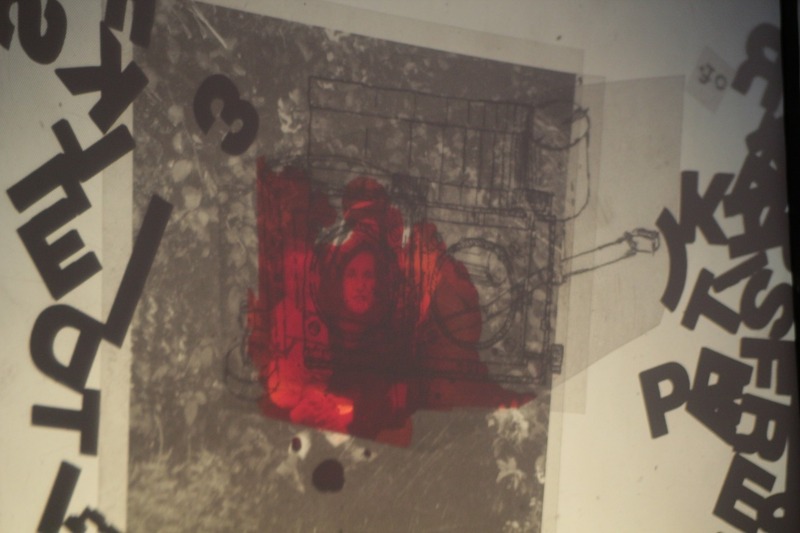 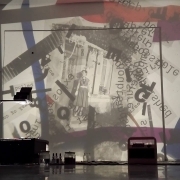 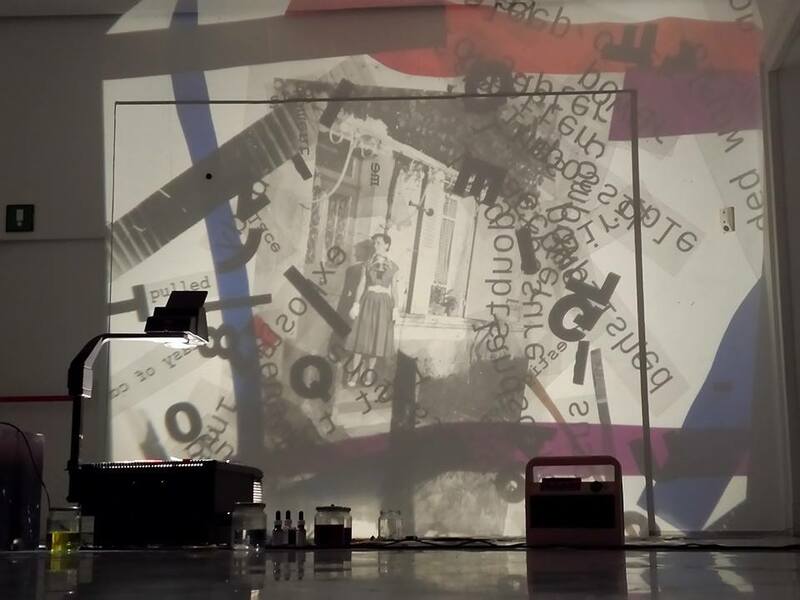 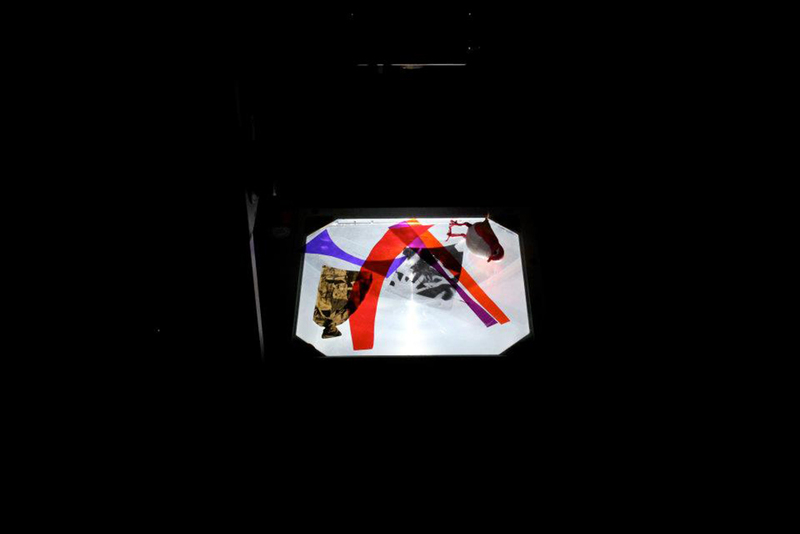 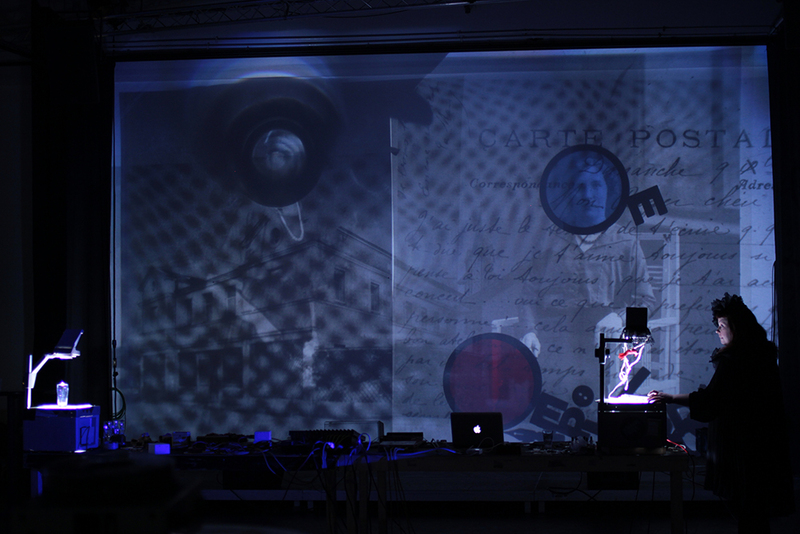 The projection is created live on the surface of an overhead projector, with various series of archive images, inks, glass, letters (…) and other composite materials that are assembled on the glass of the projector, creating deconstructed light collage. 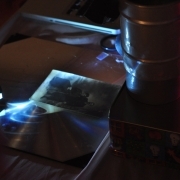 The collection of im- ages were found in the box belonging to my grand mother, they were digitalised and printed for projection. 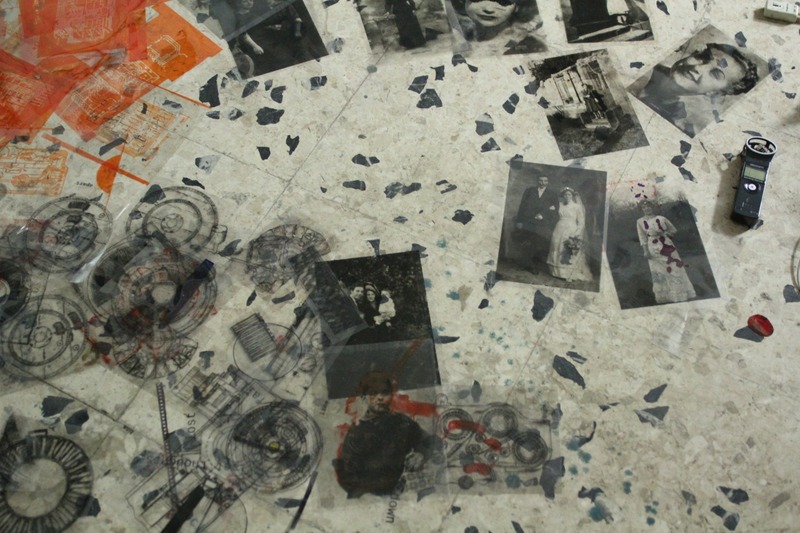 The narrative reactives visual fragments of her personal history, recomposing them in new narration. 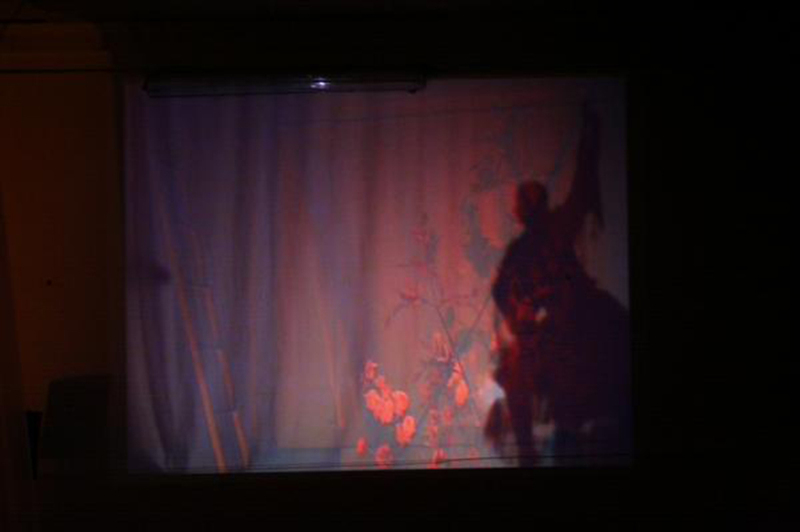 The slides were done with a modified cross development process to achieve this colour result out of the black and white material. 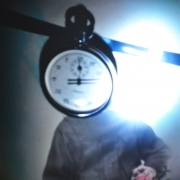 Two figures are photographed with long time exposure, creating a third vanishing body. 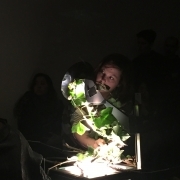 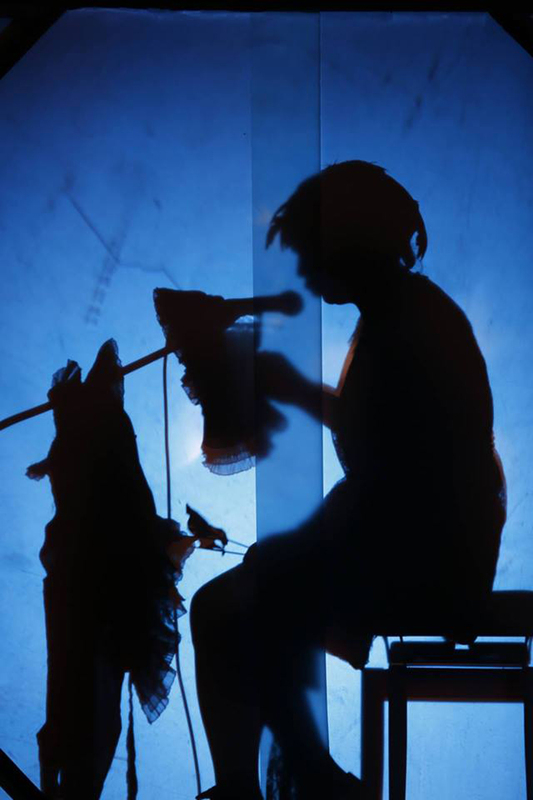 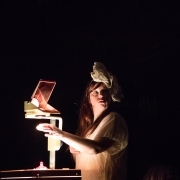 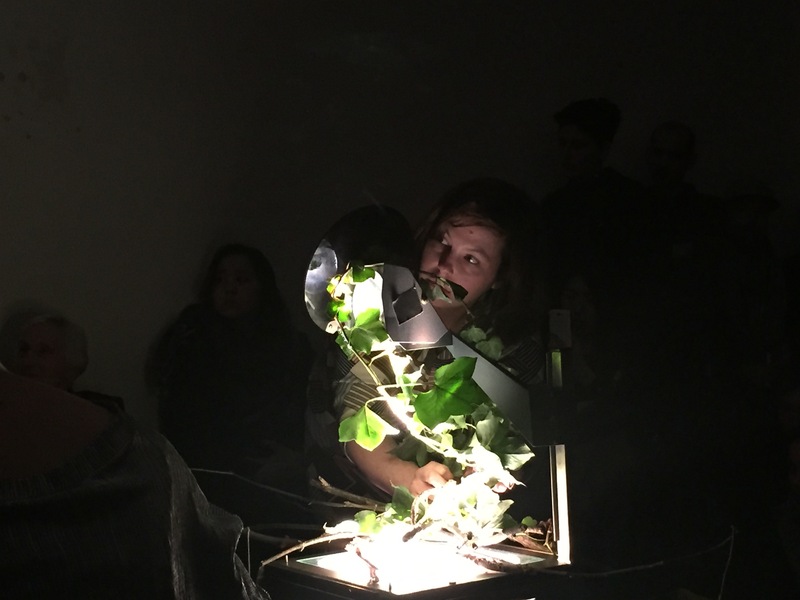 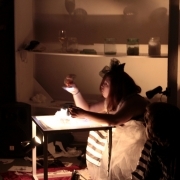 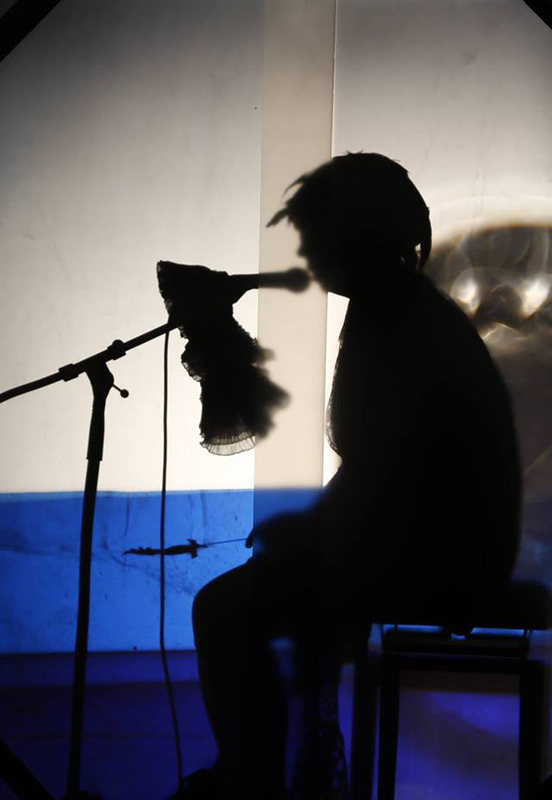 Between action and improvisation, the performance is an immersive piece placing the viewer in an oneiric space between sounds, projec- tions, story telling and ritual narration. 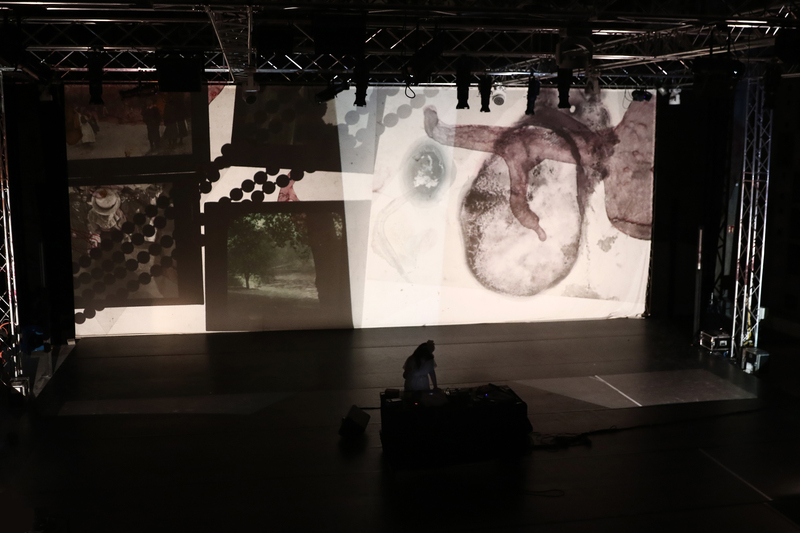 The sound and visual performance is seen as a process, activating our memory loss immersed in a sonic collage. 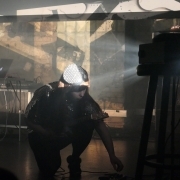 The performance was created in the summer 2015 and presented live at Spektrum, Berlin, Germany in September 2015 and Live at Data- bitme festival, Arles, France in November 2015. 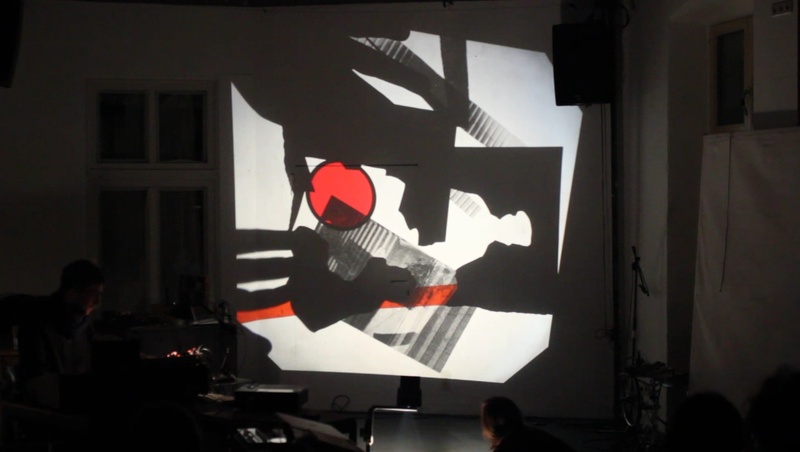 Le paradis rouge et l'oiseau impossible live at Spektrum Berlin from AudeRrose on Vimeo. 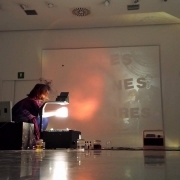 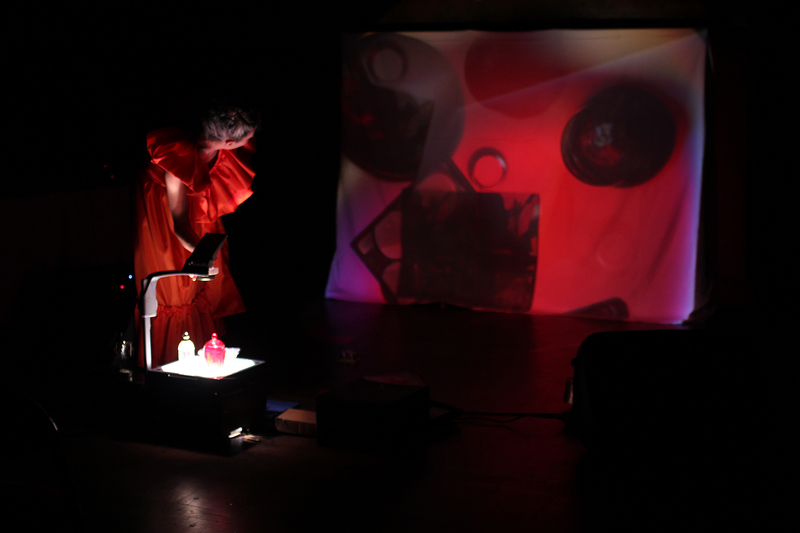 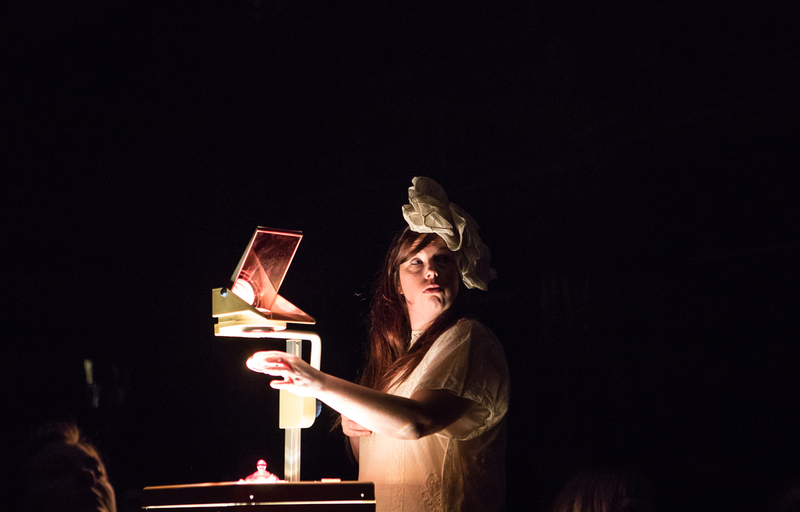 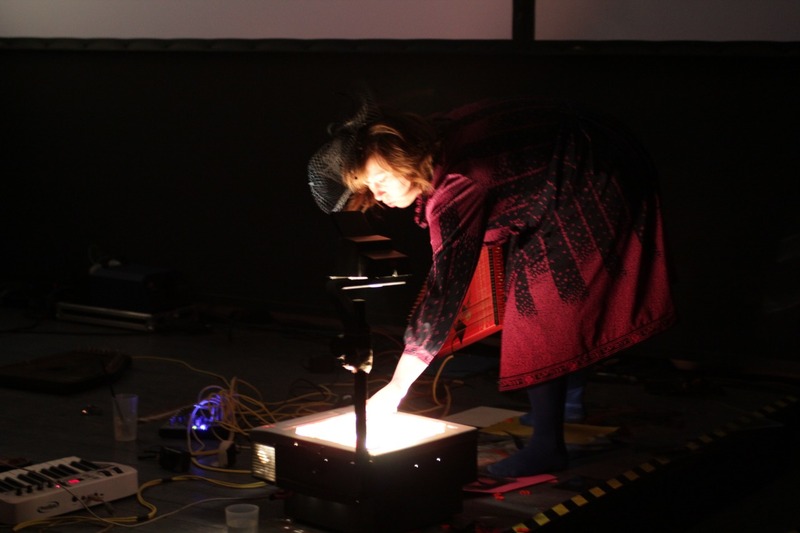 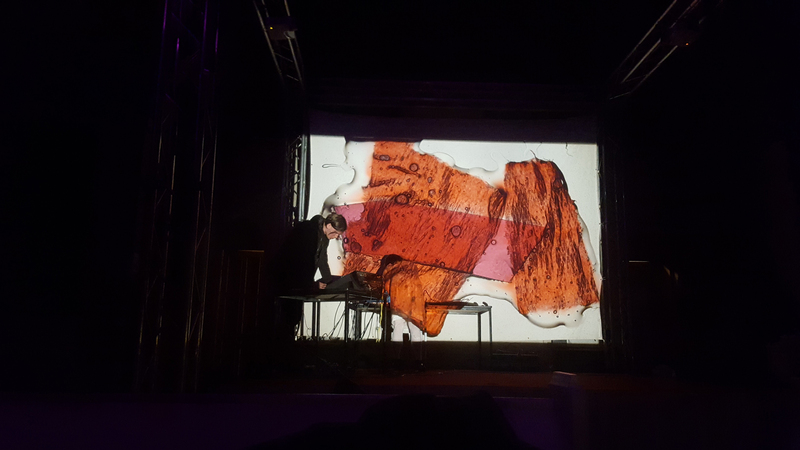 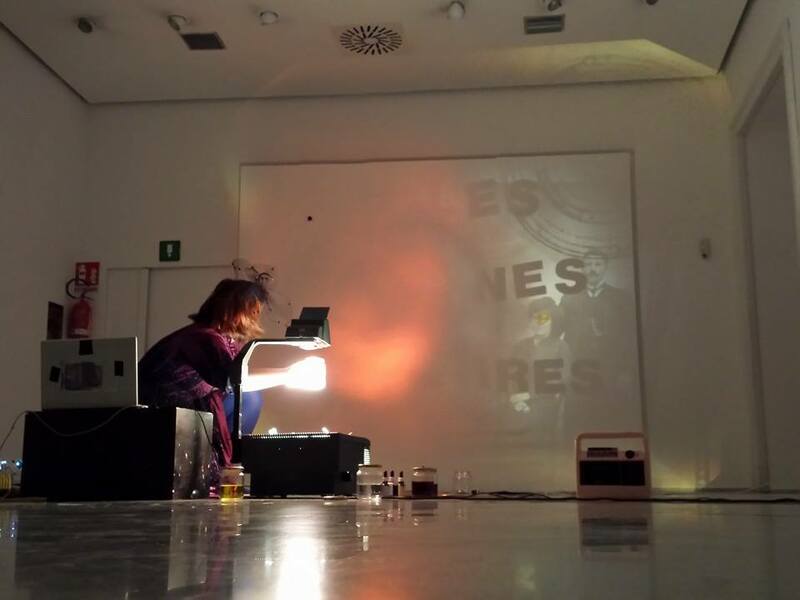 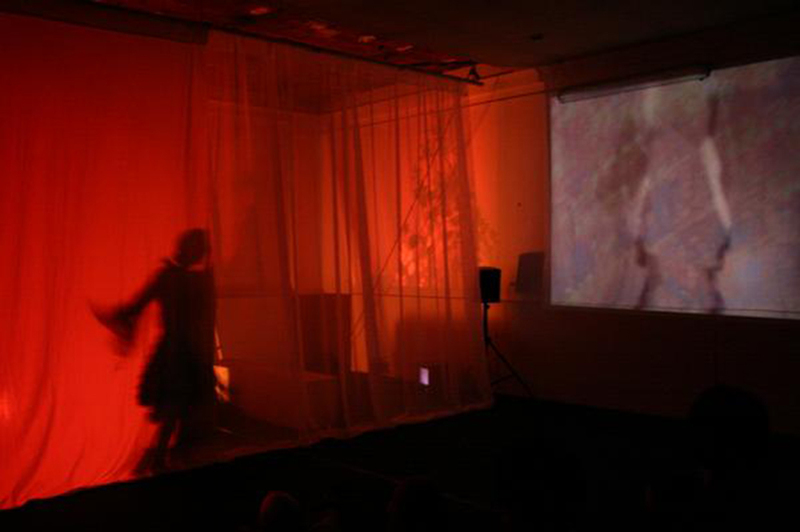 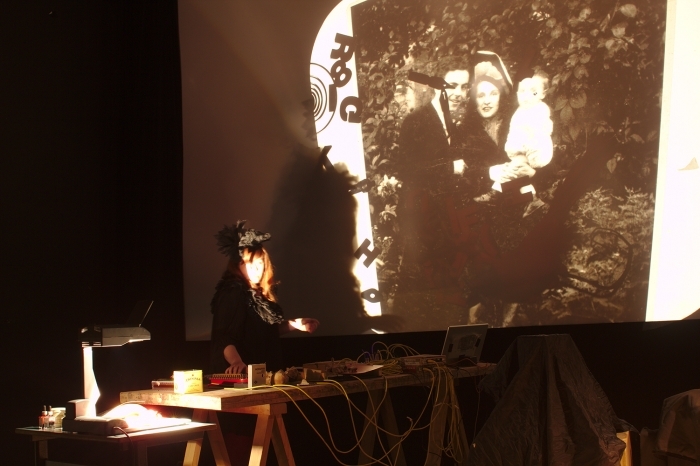 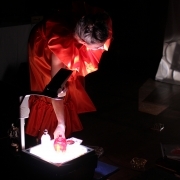 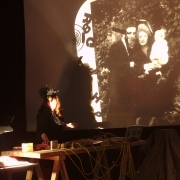 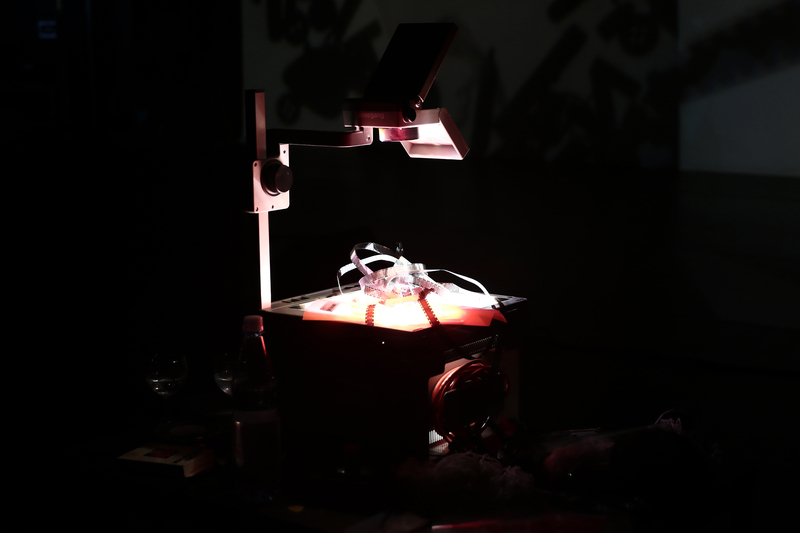 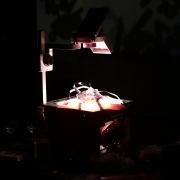 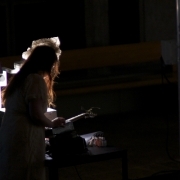 “Le paradis rouge et l’oiseau impossible” is a semi-improvised audio-visual performance that links the movement of the performer to the sound via a handmade theremin, creating electrical variations. 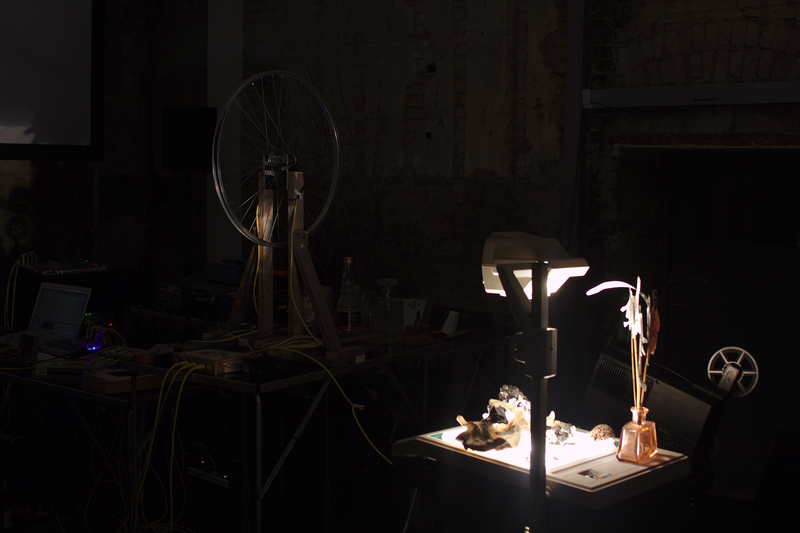 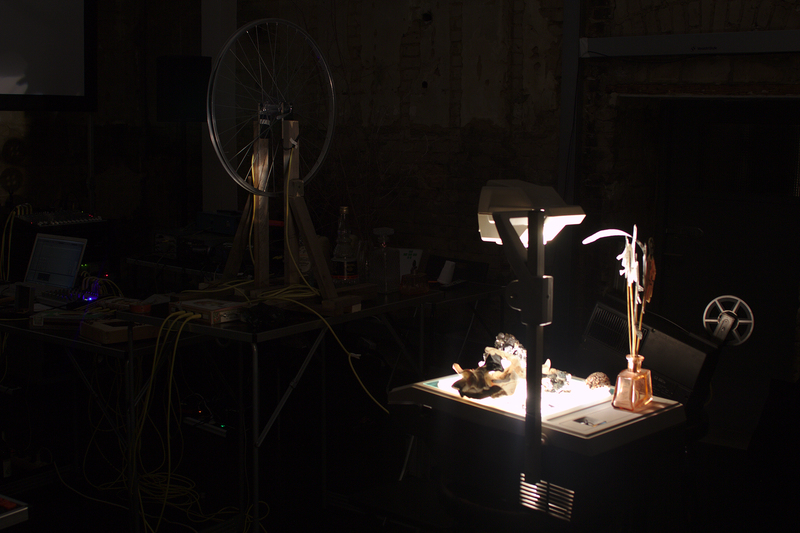 The stage is filled with a collection of sound objects, covered with contact microphones, creating a sound collage trying to reproduce the movement of a fallen bird. 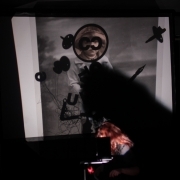 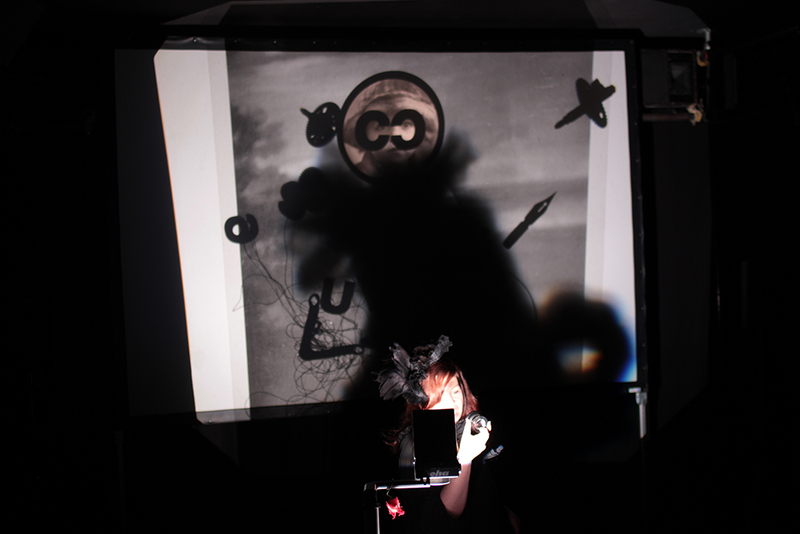 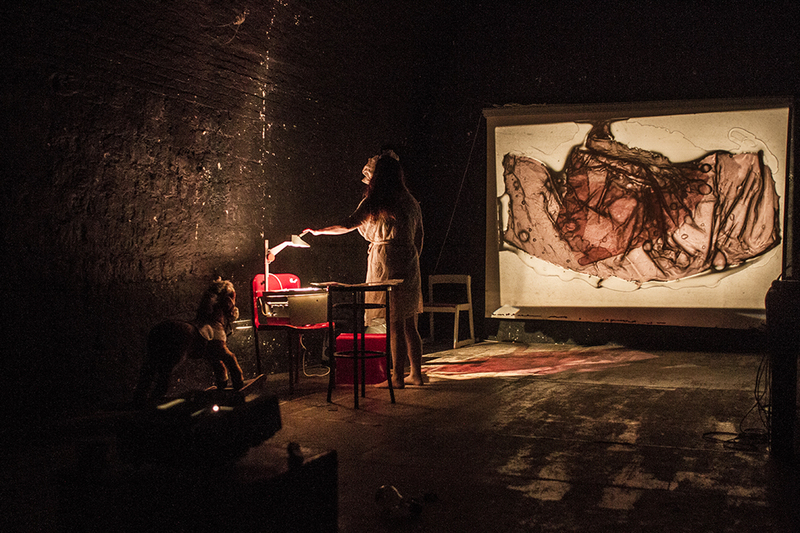 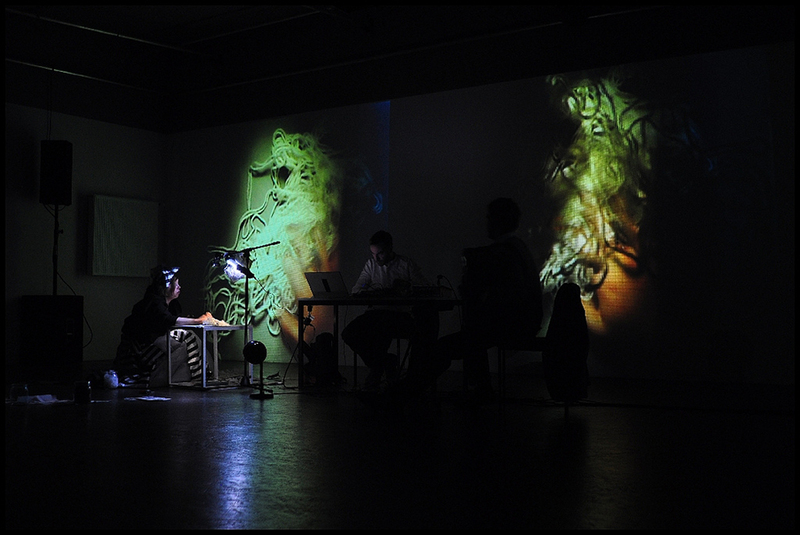 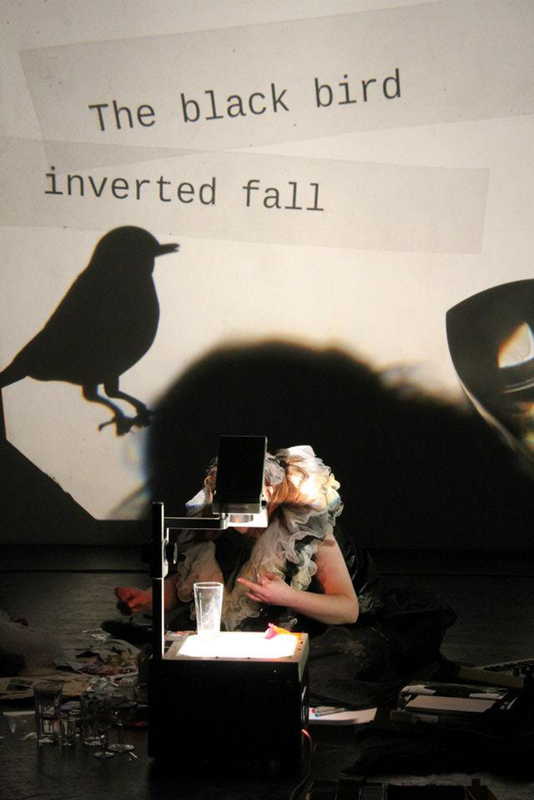 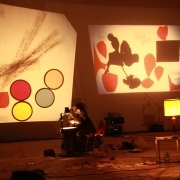 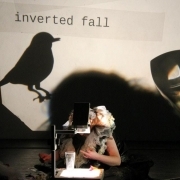 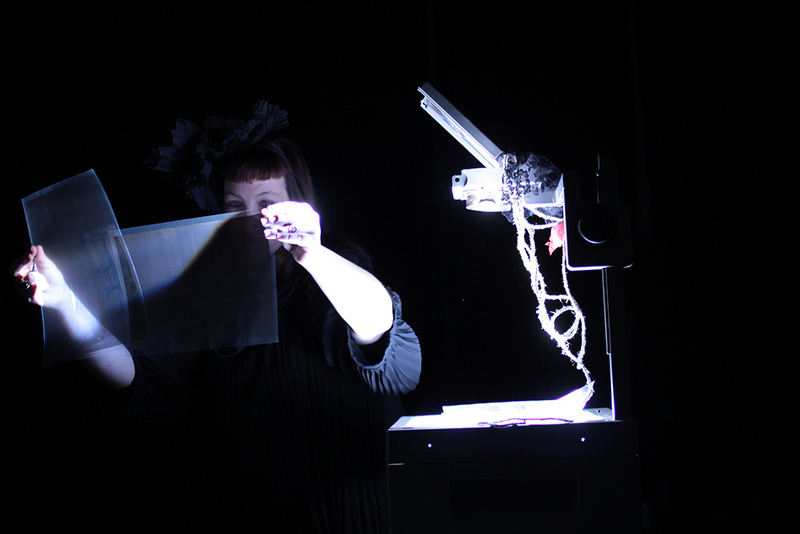 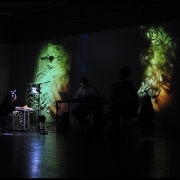 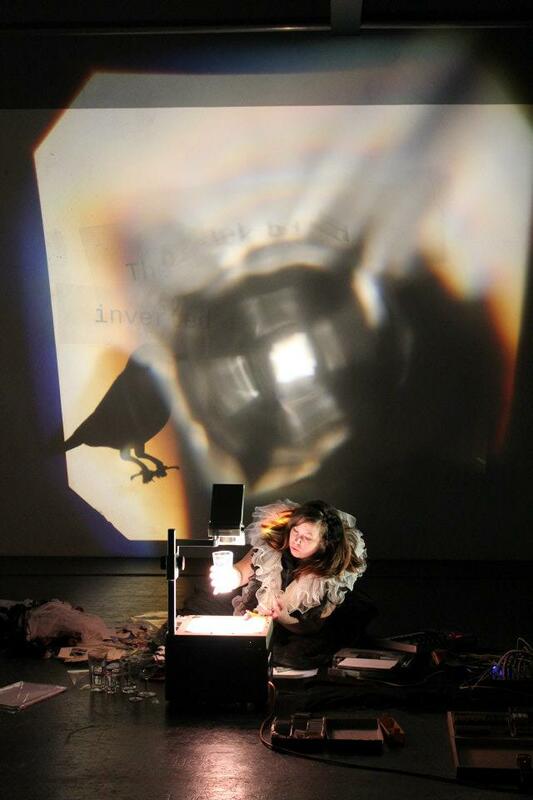 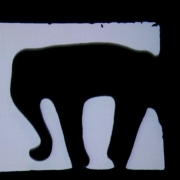 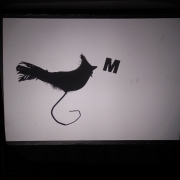 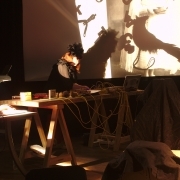 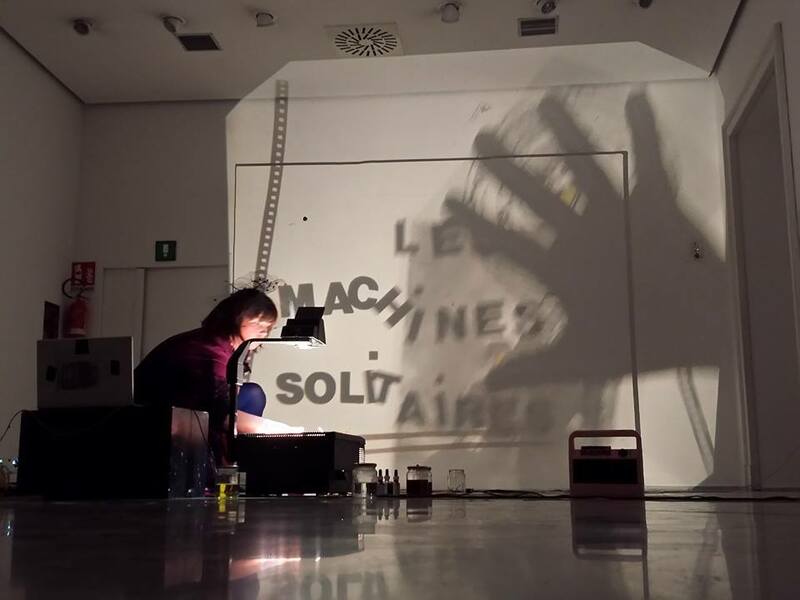 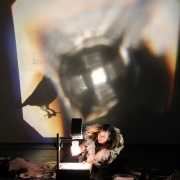 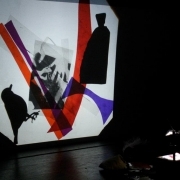 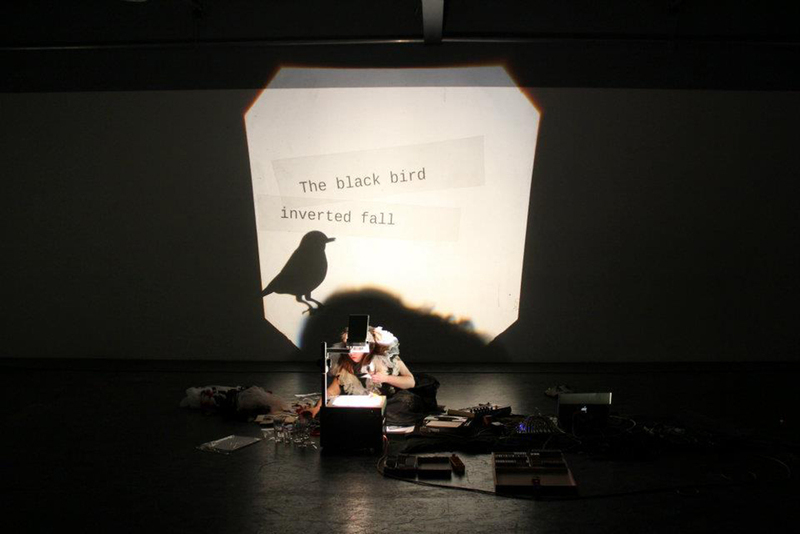 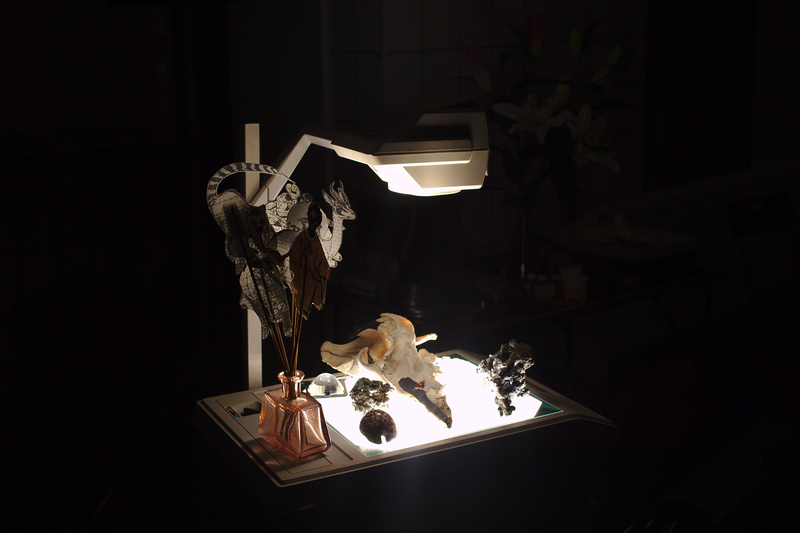 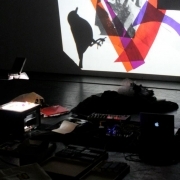 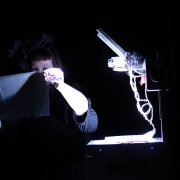 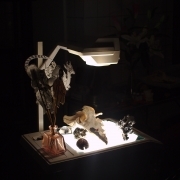 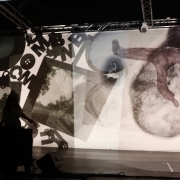 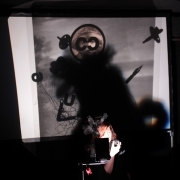 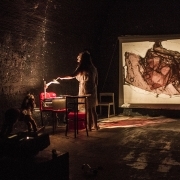 The projection is created on the surface of an overhead projector, with various series of archive images, inks, shadow, bones and other composite materials that are assembled live, creating the tale of a bird who forgot to how to fly. 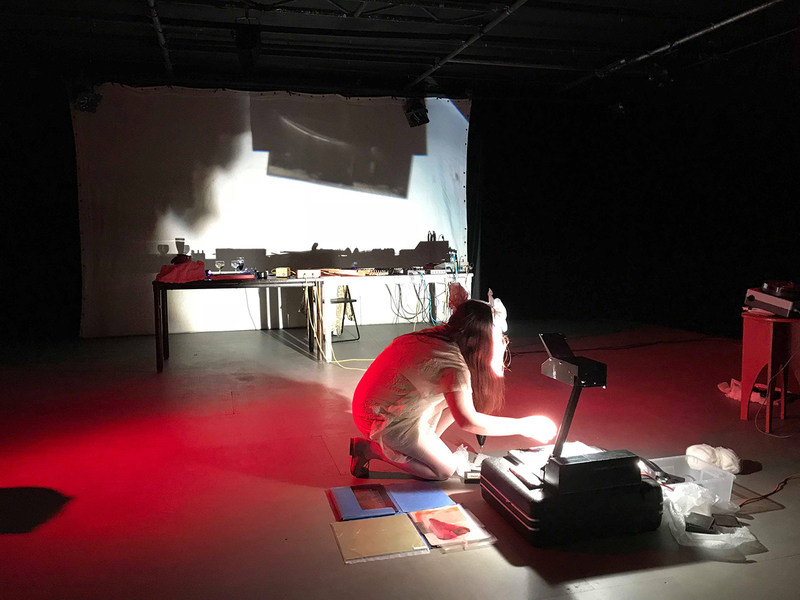 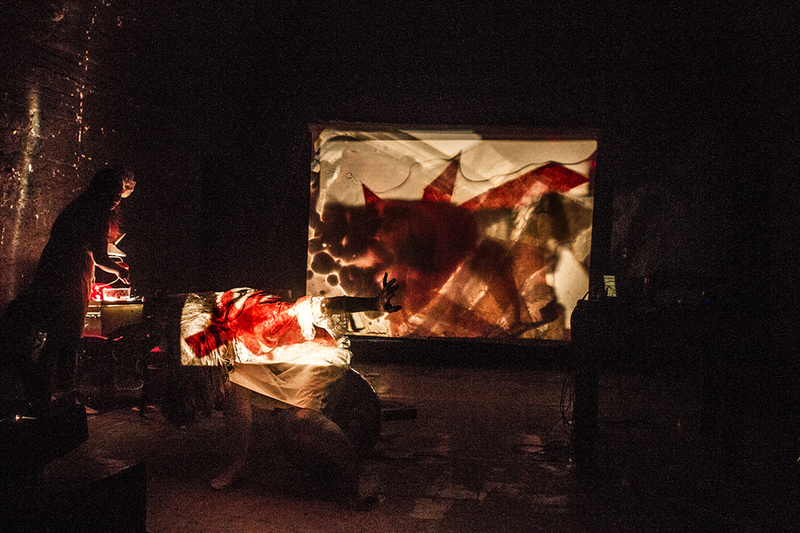 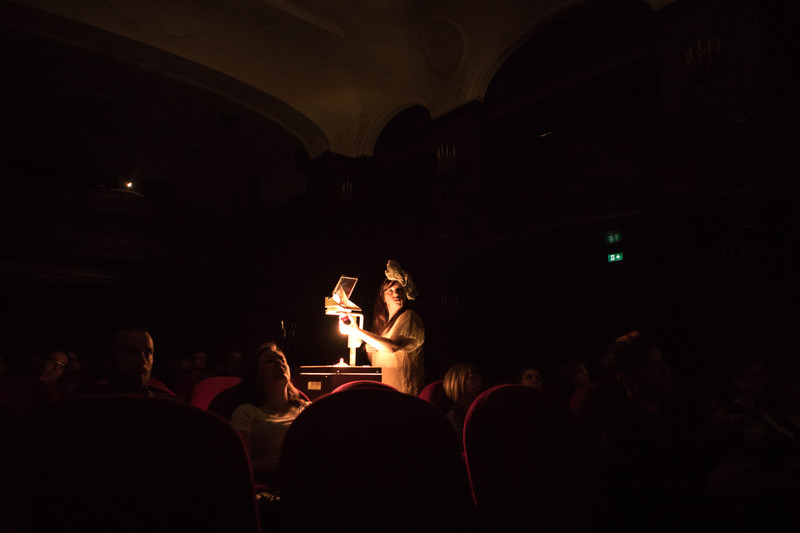 Between action and improvisation, the performance is an immersive piece placing the viewer in an oneiric space between sounds, projections, story telling and ritual narration. 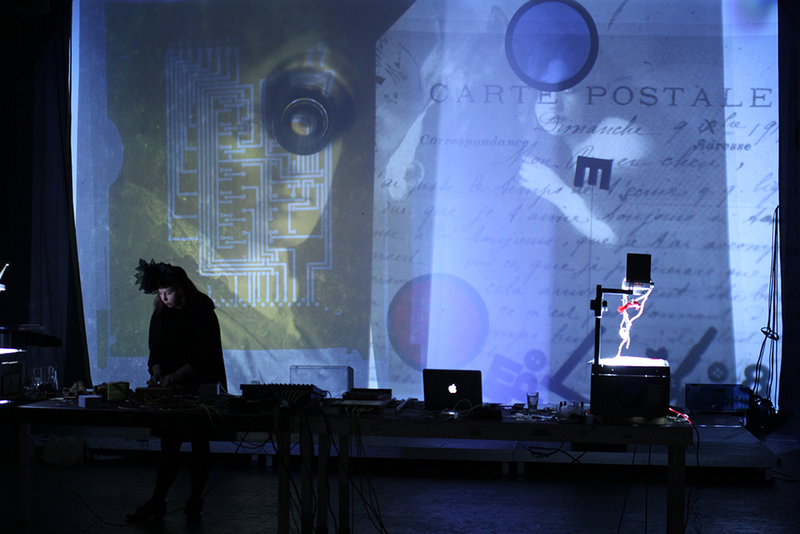 Special thanks to Spektrum for the great venue, and Sqar.inc for the electronic wonder! 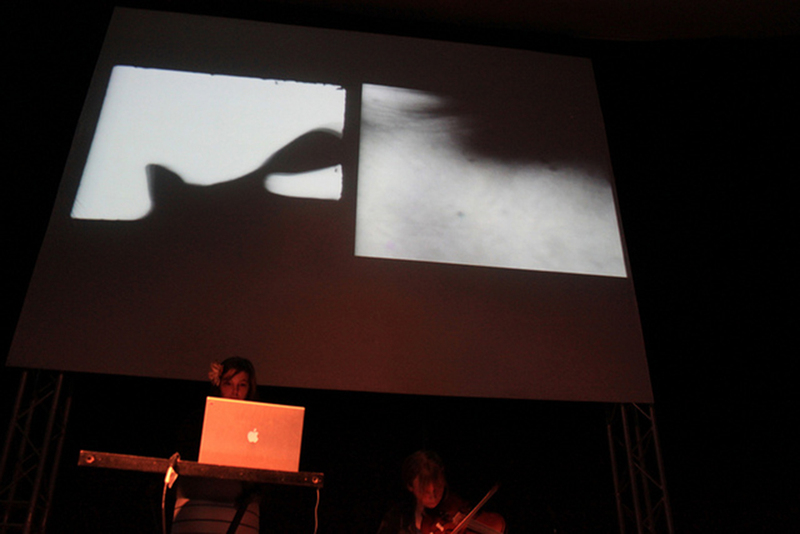 Untitled improvisation with Susanne Froehlich, recorder and AudeRrose live overhead manipulation. 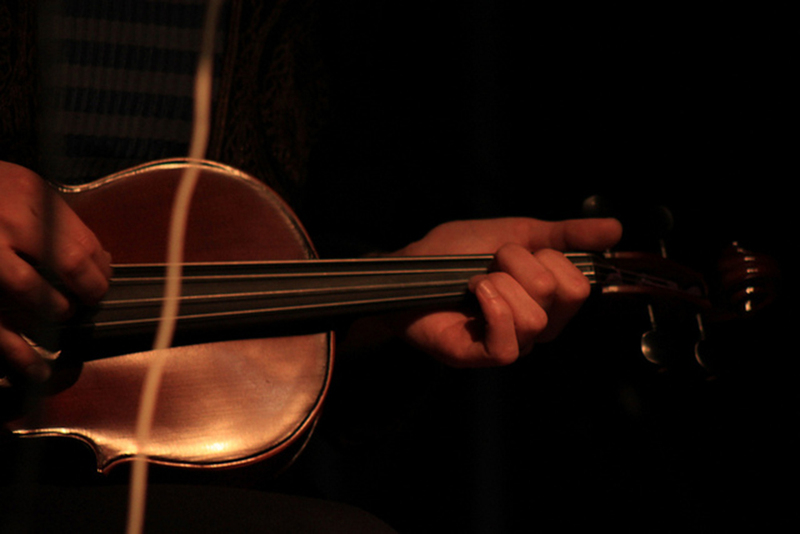 It was wonderful, i was transported in a narrative drift with the amazing sound of the instrument. 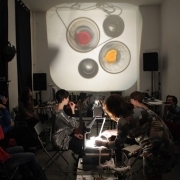 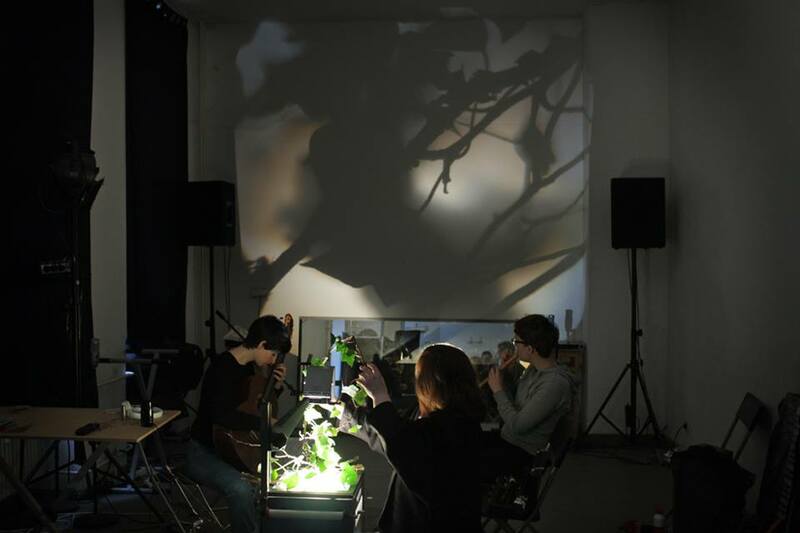 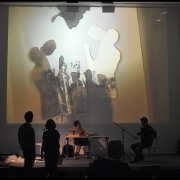 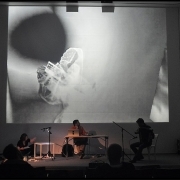 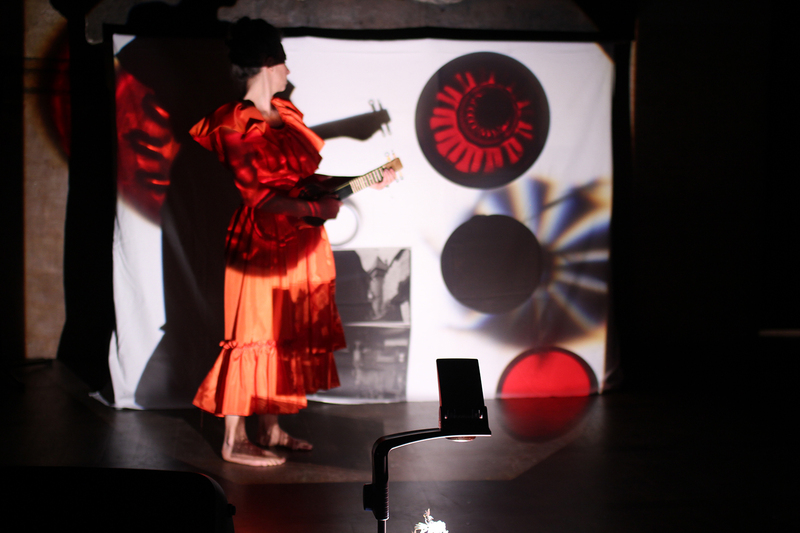 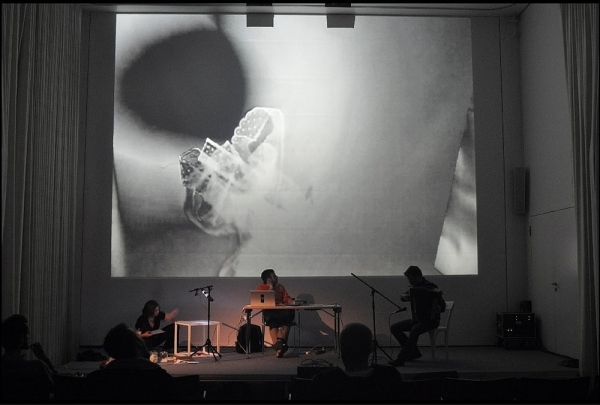 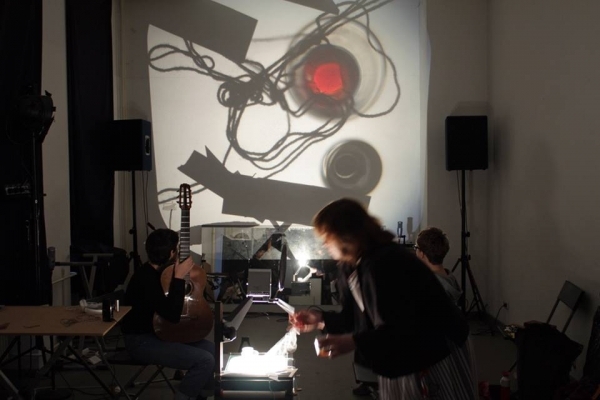 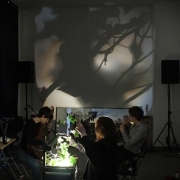 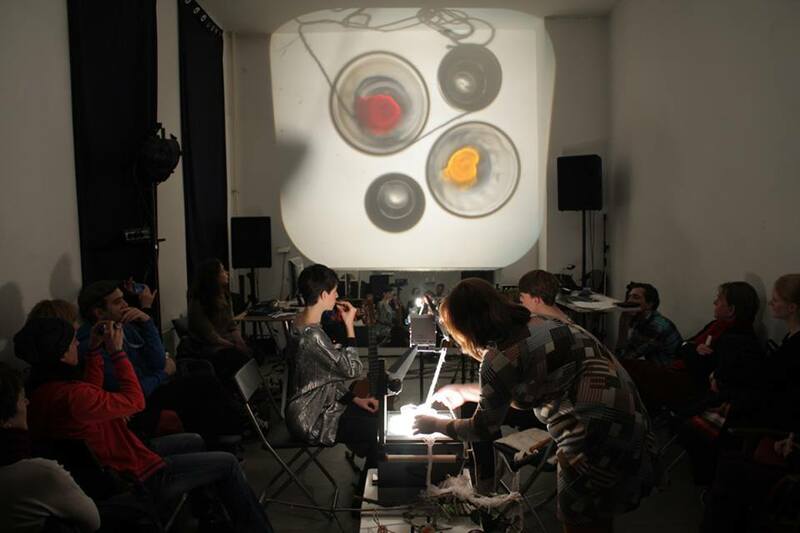 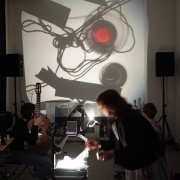 Gineke Pranger / Maya Shenfeld / AudeRrose – Drei Miniaturen – for recorder, guitar and overhead projection. 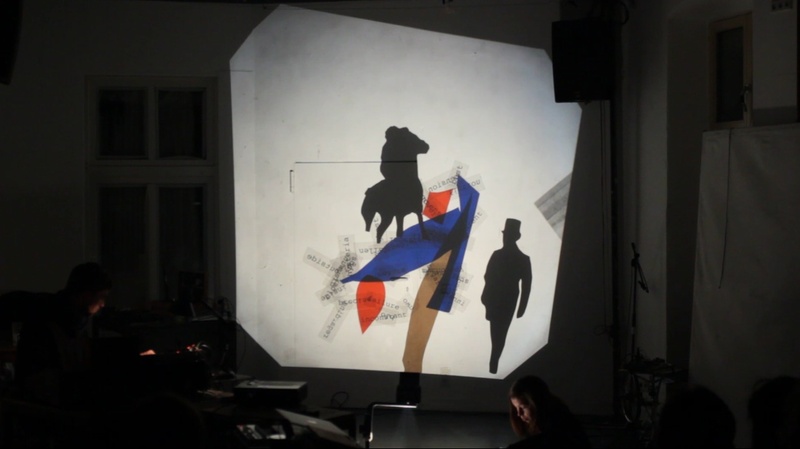 Drei Miniaturen from AudeRrose on Vimeo. 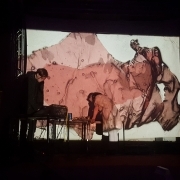 Les machines solitaire live at DokfestLoundge, Kassel. 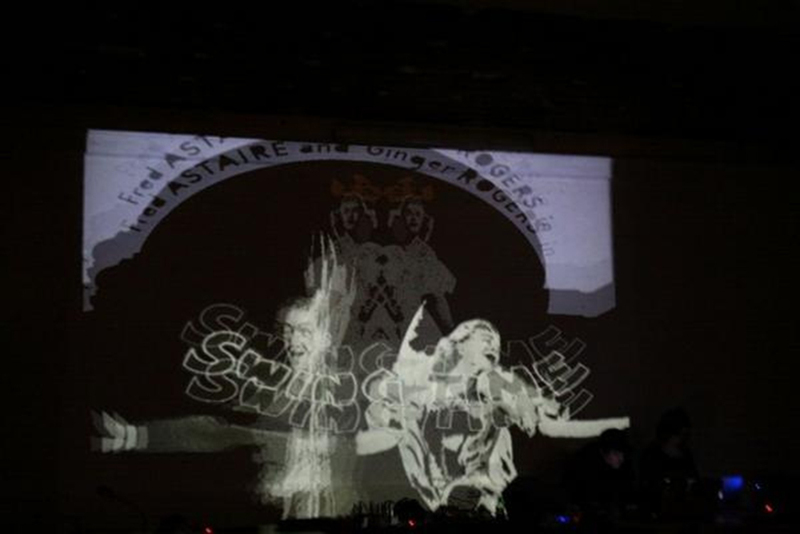 Special slide and cithar variation. 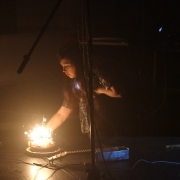 Thanks to Jan, Claire, Homemade, and all the organisation. 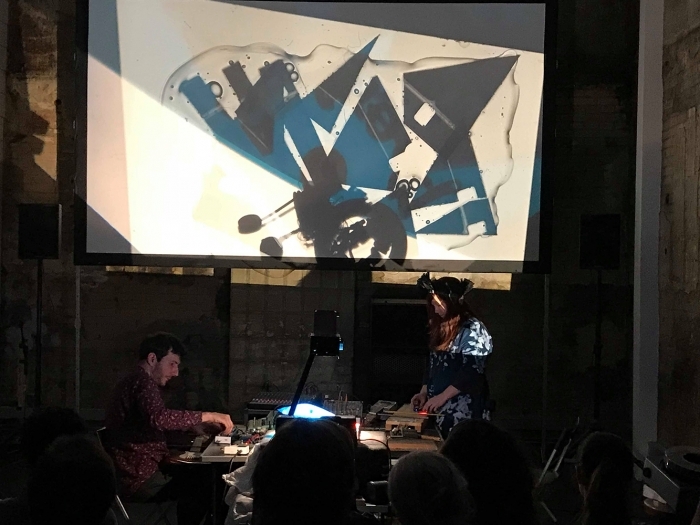 Born from the discovery of Yogalala concept and the desire to create a performance based on pure frequencies, Spectralala project is a spectral music fantasy composed by Domitille Sanyas (cello) and André Fèvre (concrete sounds). 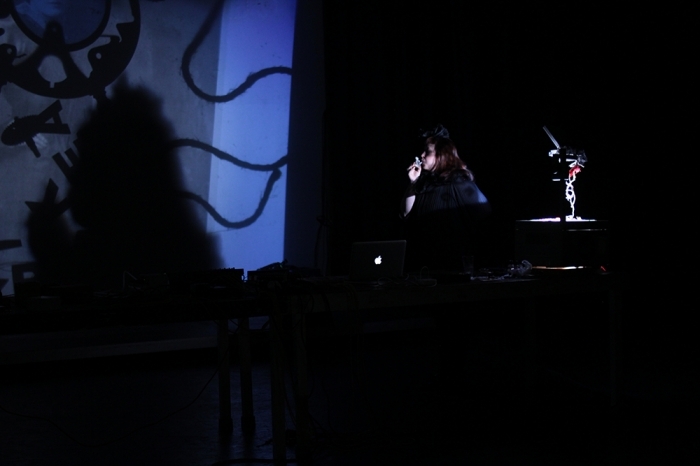 The live video part is composed and played by A-li-ce, AudeRrose and Karina JunkFood as a collaborative process. 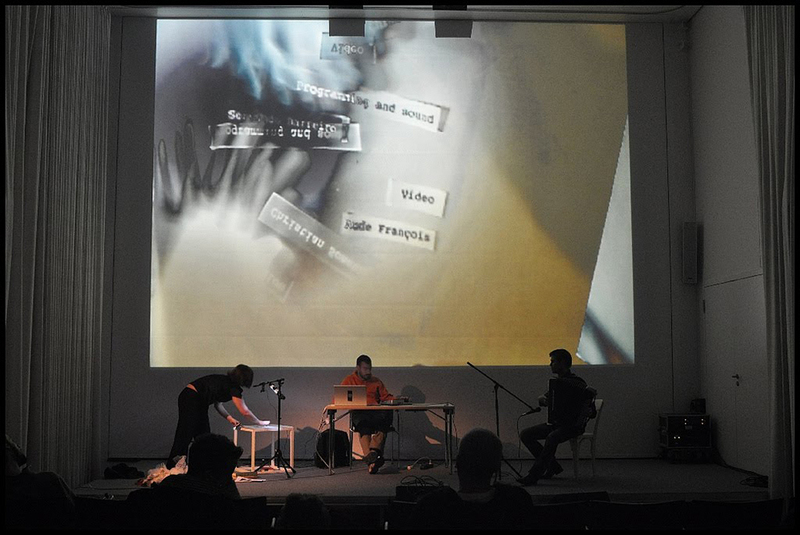 Performance, variation in Rome, Italy, special thanks to valeria, julie and tommaso. 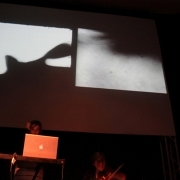 It was a unique projection variation done with two episcope composed as diptych greatly manipulated and composed by valeria and tommaso, i created the sound part in a very experimental way. 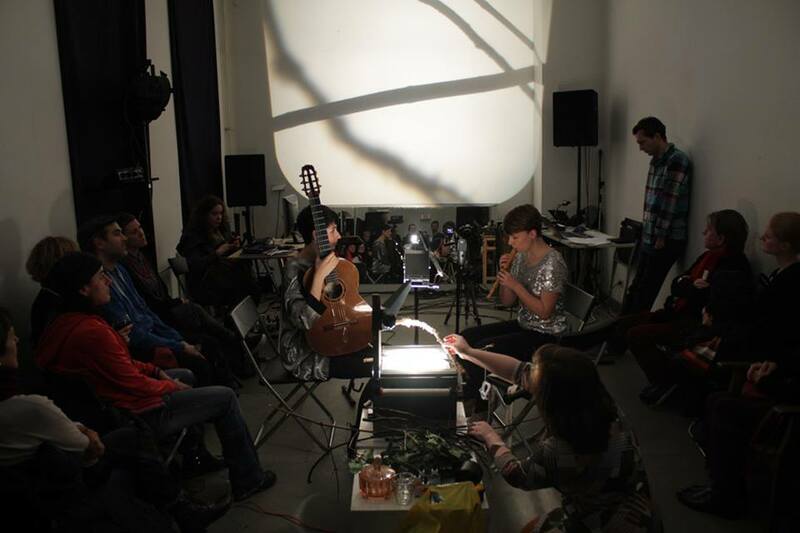 the acoustic of the room was fine and my cithar was sounding like an electric guitar. 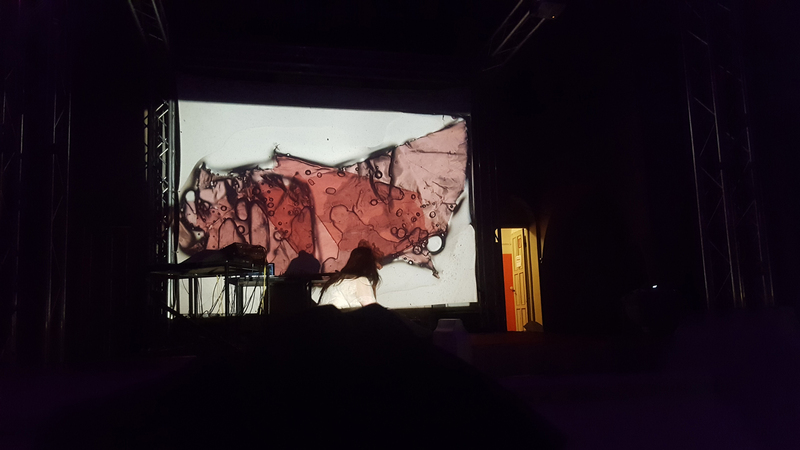 My performance “Les machines solitaires” was selected for the Ole festival on electronic literature, and displayed as performance and installation at the PAN Palazzo delle Arti Napoli, Italy, selected for young contemporary art price. 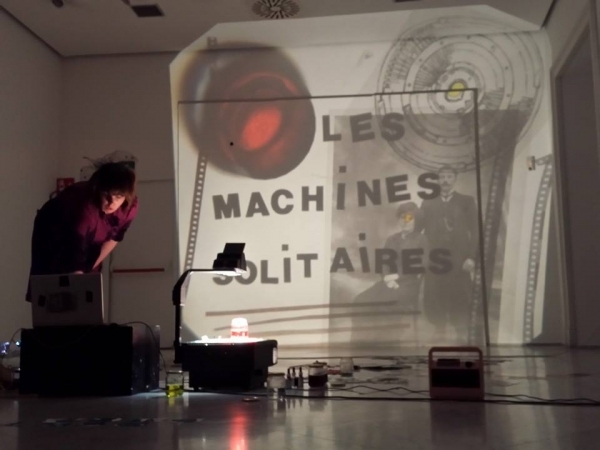 Les machines solitaires live at PAN Palazzo delle Arti Napoli from AudeRrose on Vimeo. 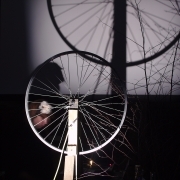 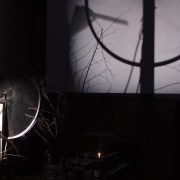 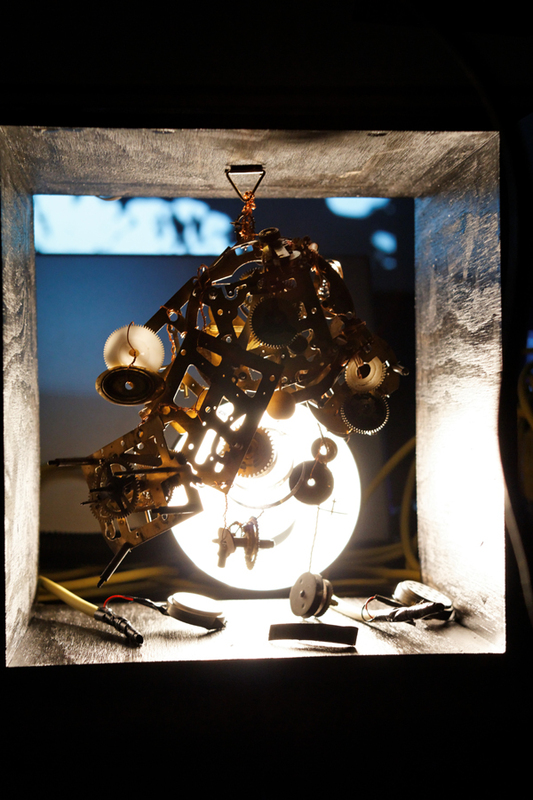 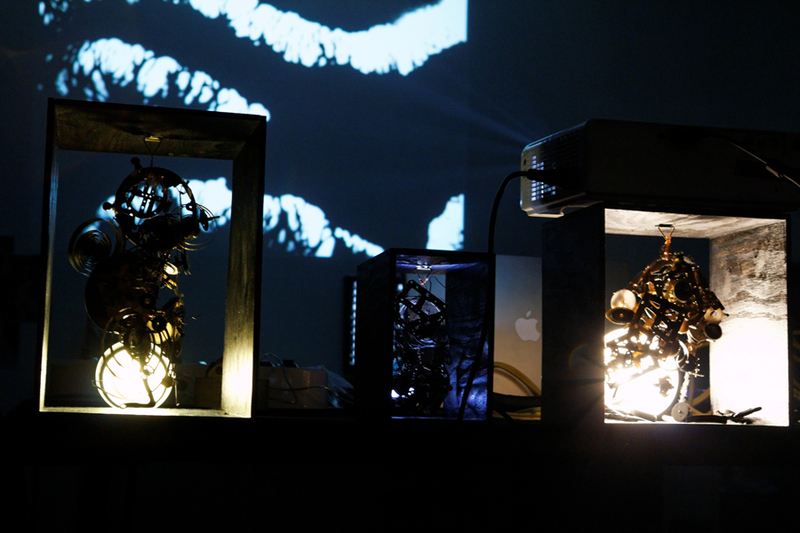 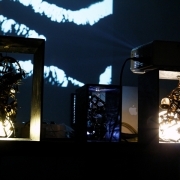 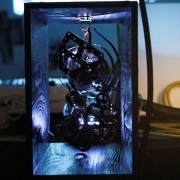 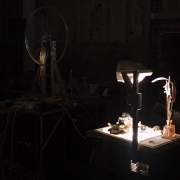 Piece of a strange sound-video-sculpture performance, all generated in real time. 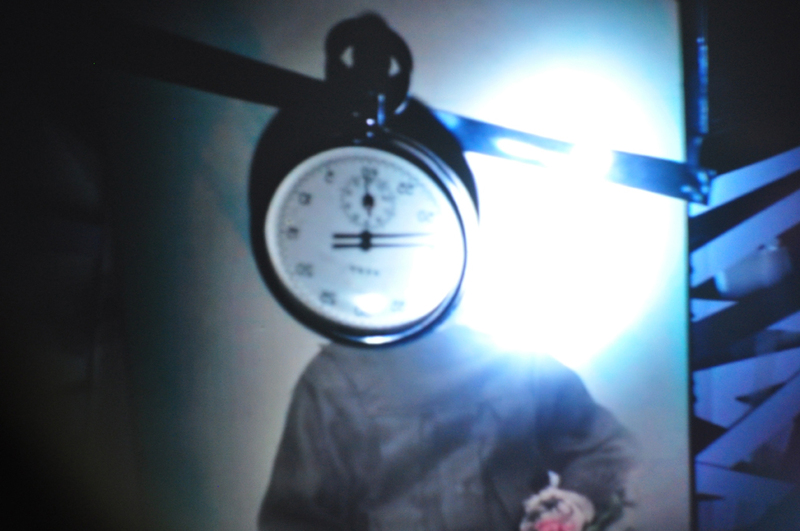 In the corridor of our mind, time is playing under the surface of our skins. 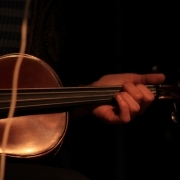 Related metaphors are hidden in every symbolic objects and sounds. 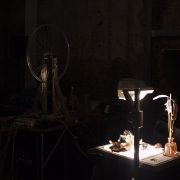 Strange metallic sound-sculpture are hanging and playing with the physical oppression of time. 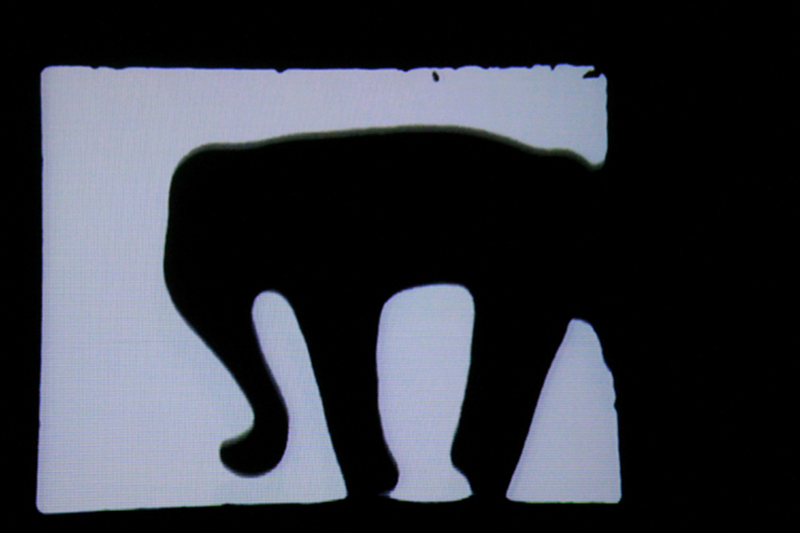 Do we still remember who we are after all those turns and critical behaviors. When does reality remain trapped inside fiction? 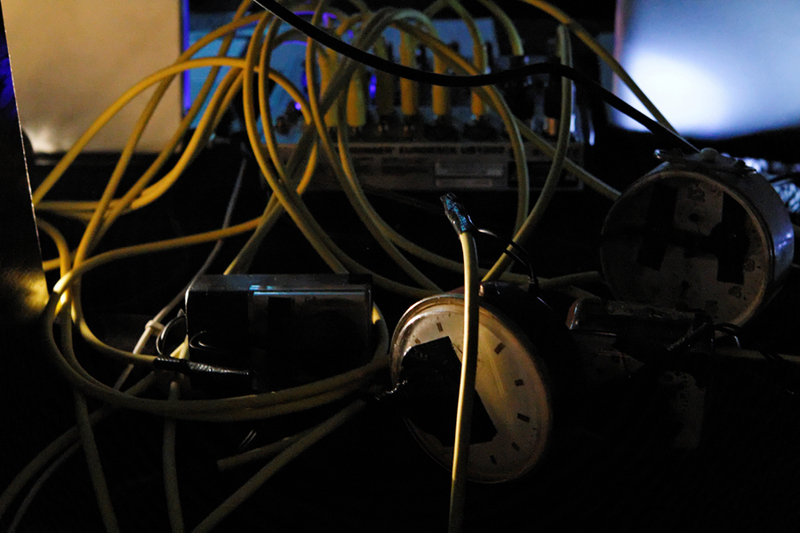 5 real clocks, 3 sound sculptures, live video, 12 microphone piezo micro contact, 2 sensors, midi piano, audio mixer, ableton live, live hd webcamera, modul8, experimental sound collage. 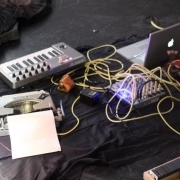 All is generated in real time starting from the minimalist tic tac of the clock and ending in a kind of experimental sound collage, fallen like a dark corner of a metallic hybrid structure. 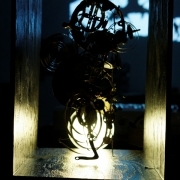 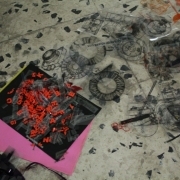 The metallic clock sculpture and organic shapes are filmed in real time and turned into an old image. 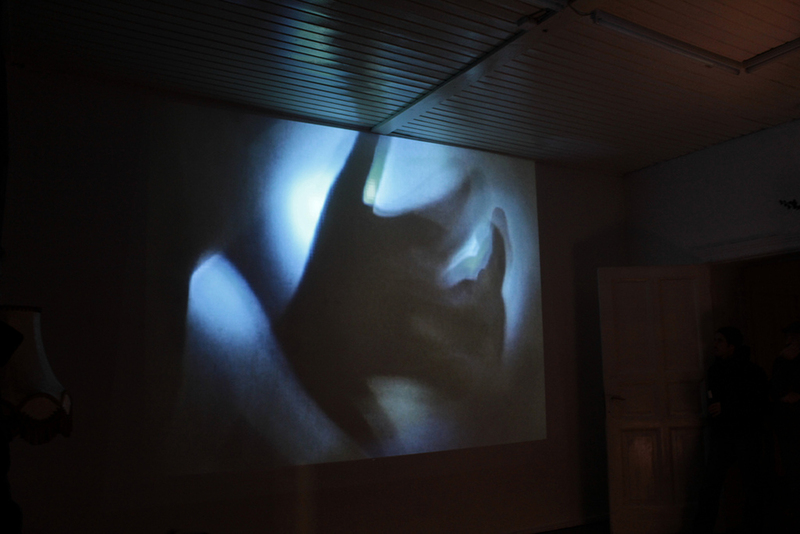 Surreal, dark, dreamy conceptual. 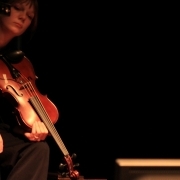 In loving memory of Gisèle Brunaud. 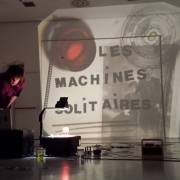 Les machines solitaires av live B-Seite Jetztkultur thanks so much to Benjamin Jantzen, sven/Licht Installationen, Melanie Wetter, Christiano Domingo and Volker Hartmann-Langenfelder. 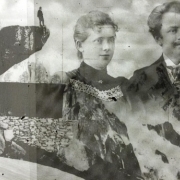 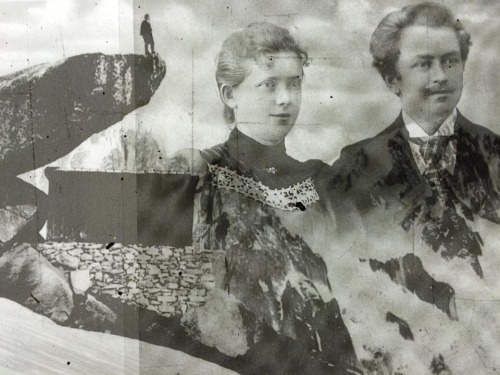 Inside memory is a collection of postcards found in a hidden box of my grandmother, manipulated and transformed in realtime video improvisation. 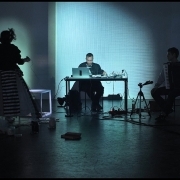 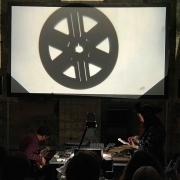 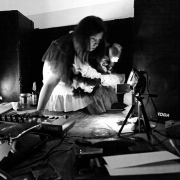 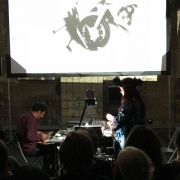 The sound is an experimental sound assemblage, with an old zither, transceiver radio interference, tape recorder with old christmas german songs, metal plate and other improvised sound events. 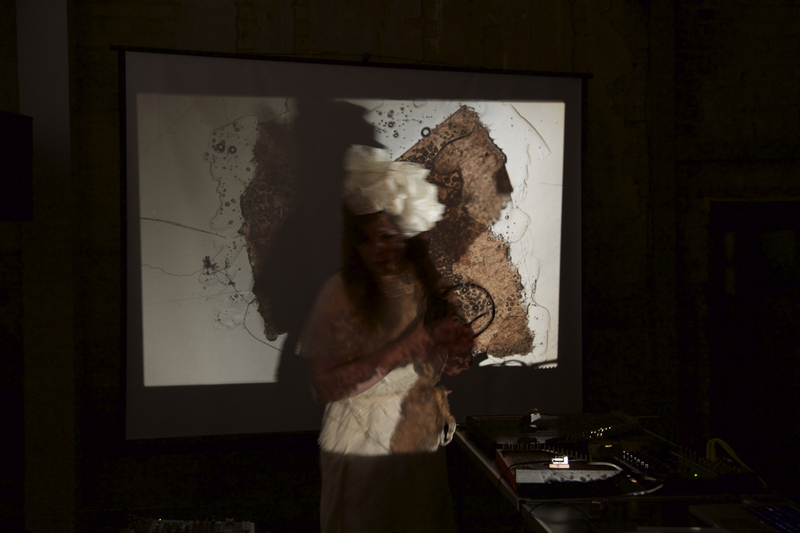 The performance is a kind of metaphoric fall inside the vanishing process of images, memory and time, revisiting images and sound fragments. 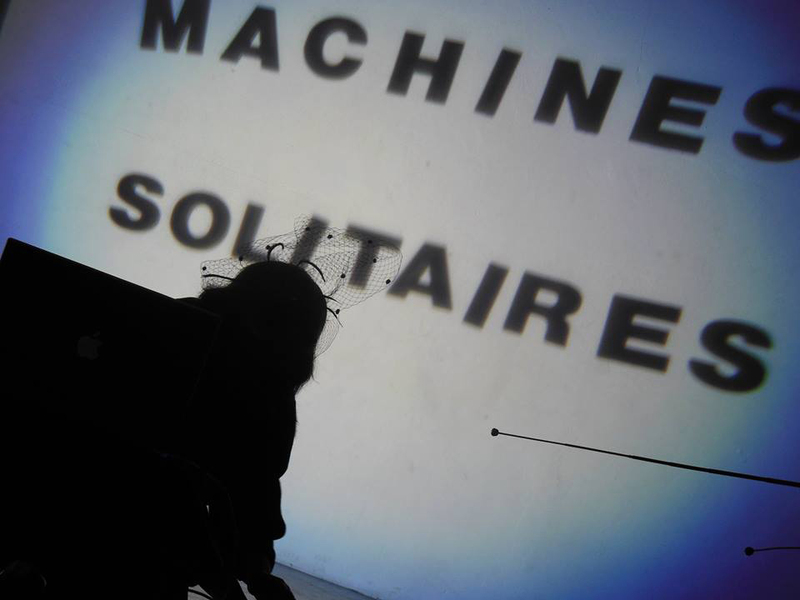 New performance project “Les machines solitaires” 5 real clocks, 3 sound sculptures, live video, 12 microphone piezo micro contact, 2 sensors, midi piano, audio mixer, ableton live, live hd webcamera, modul8, experimental sound collage. 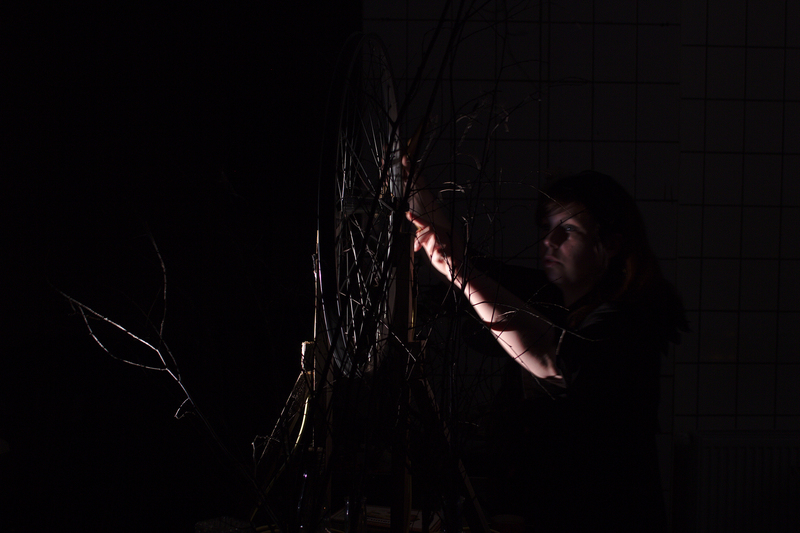 >Time< Sponsored By Sqar Special thanks to Kasia, Brent, Ioann, AV Format and Christian! 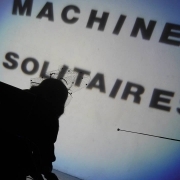 Les machines solitaires – live fragment – from AudeRrose on Vimeo. 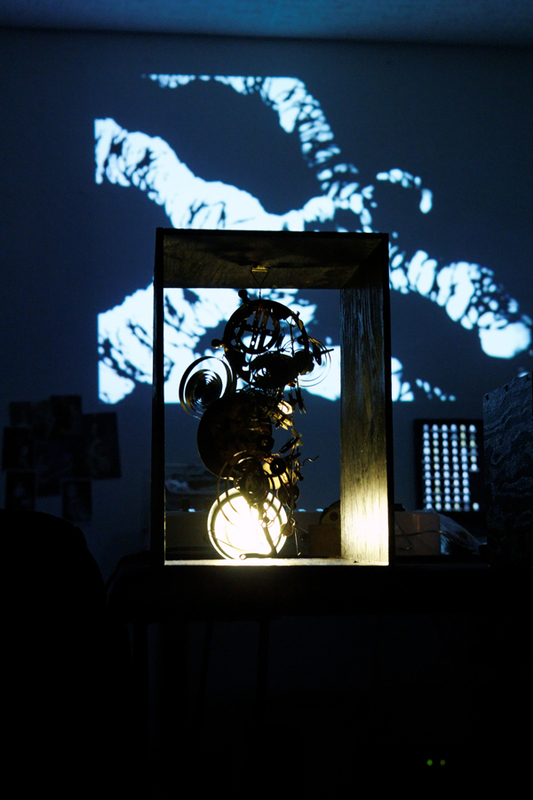 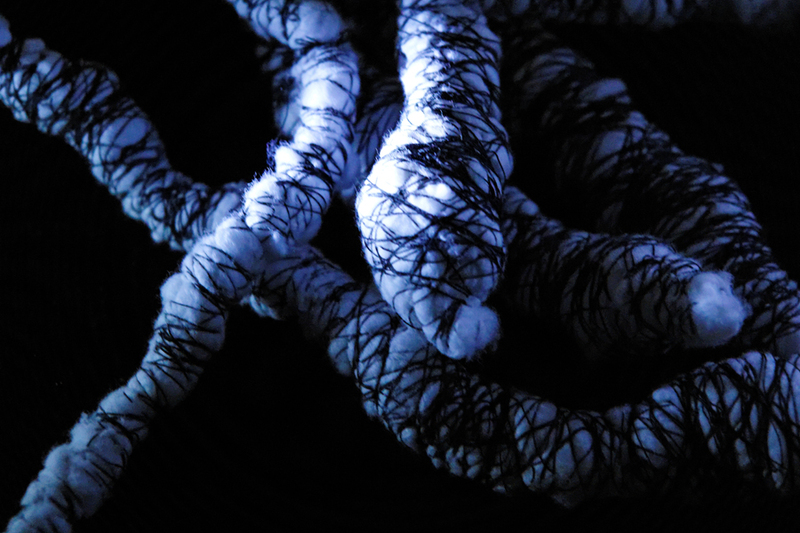 Piece of a strange sound-video-sculpture performance, all generated in real time.In the corridor of our mind, time is playing under the surface of our skins. 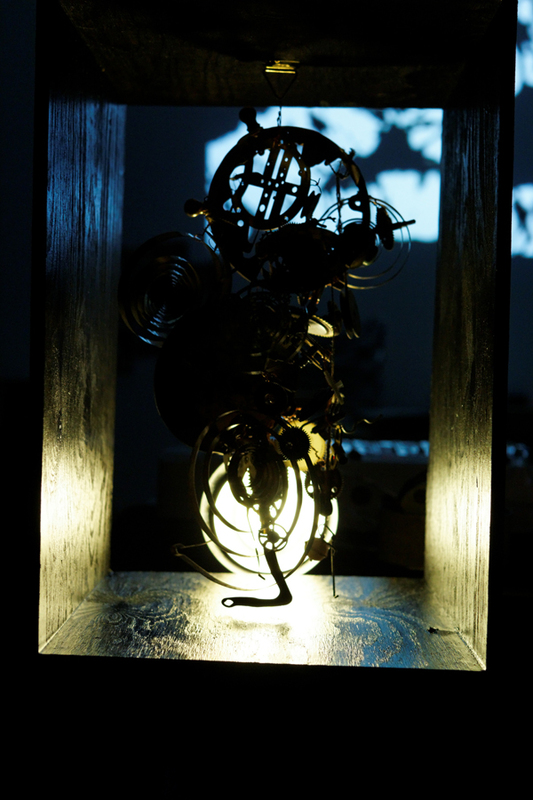 Related metaphors are hidden in every symbolic objects and sounds.Strange metallic sound-sculpture are hanging and playing with the physical oppression of time. 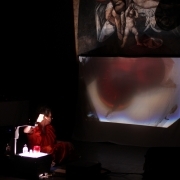 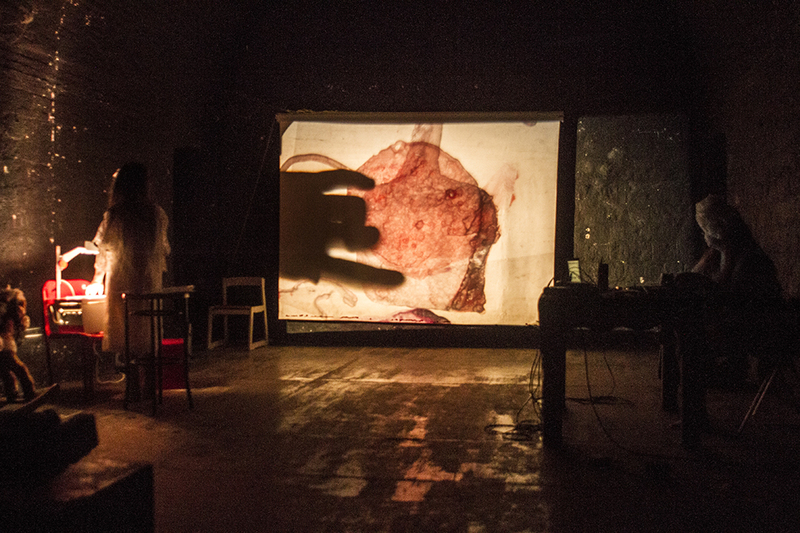 A dialogue between the organic body depicted in video and the sounds and voices present on the stage. 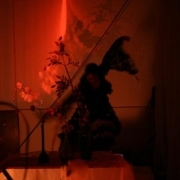 The pieces used, which belong to the works of Anais Nin, are balanced between prose and poetry, between dream and waking. 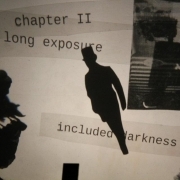 Anais Nin takes us by hand in a “non-place” which represents every place, “the invisibile line between sayable and unsayable…”. 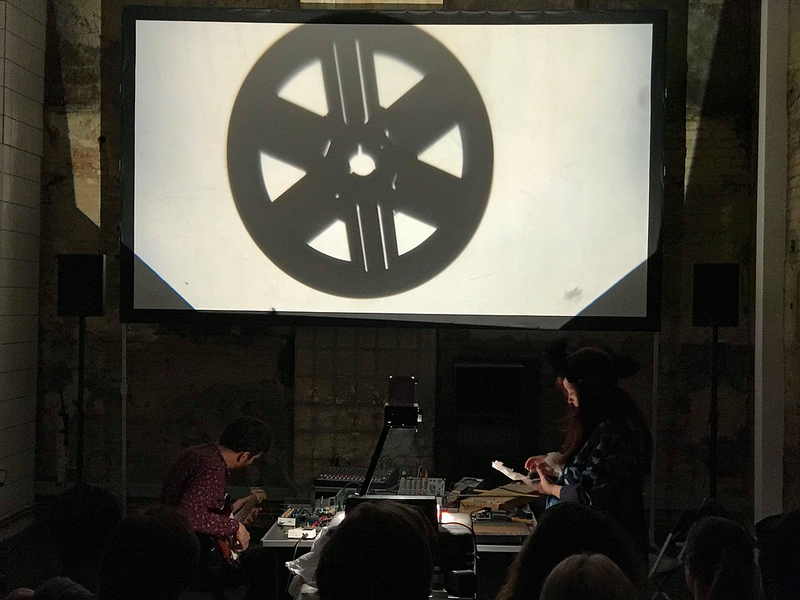 Each single word becomes a sheath, a container of images, the pretext for a sonic investigation whose most authentic meaning consists of the search for the sonic (vocal) fabric which is closest to the emotion of the moment. 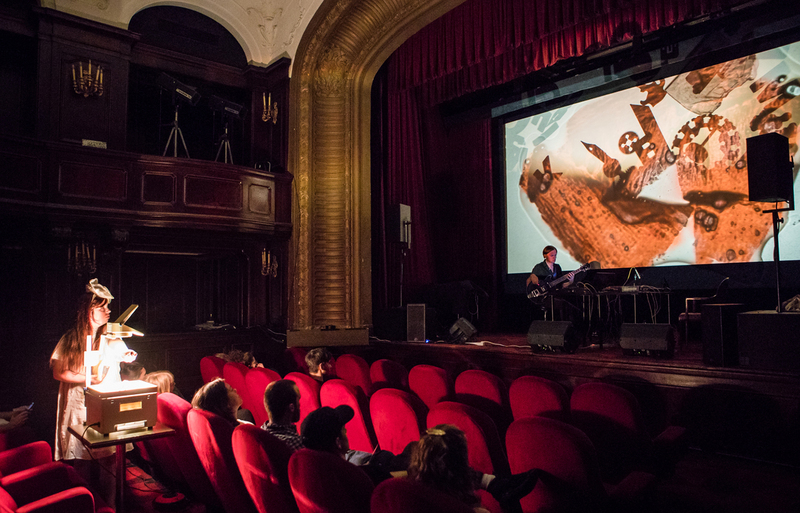 The flow of images visually retraces the vital state of Nin: recreating the voyage in the oneiric universe of Nin. 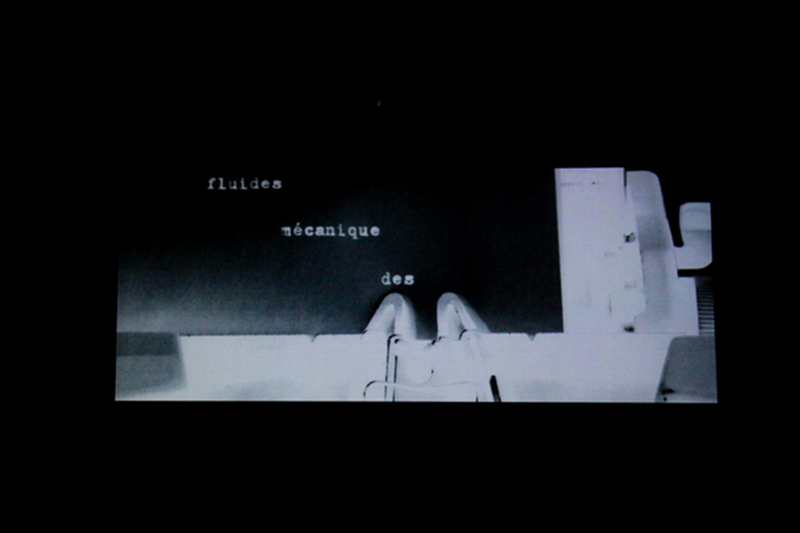 A pause in non-being, a descent into nothingness, a state of grace which only a dream can be in an undefinable time not because it is outside of time but in all possible time. 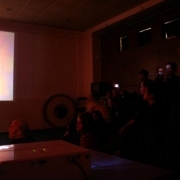 Self made worlds live in Parma from AudeRrose on Vimeo. 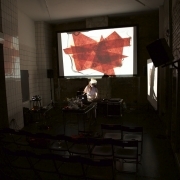 live overhead improvisation with the musicien mads at the kule theater in berlin. 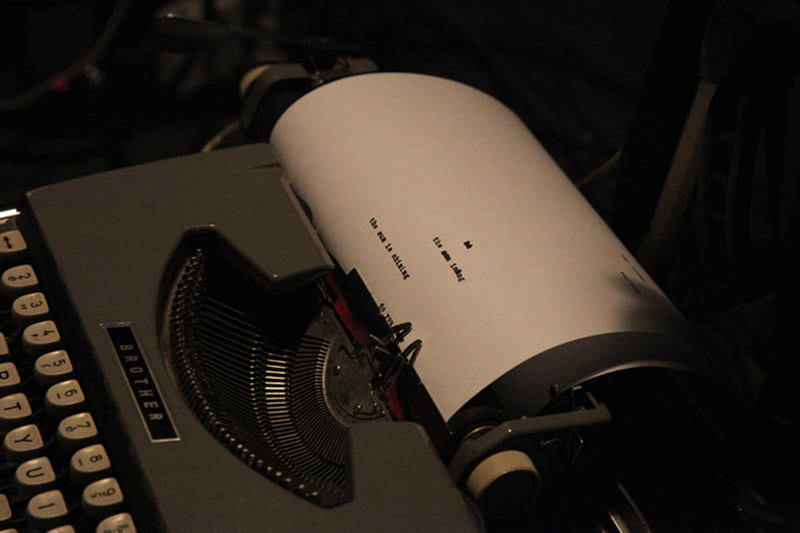 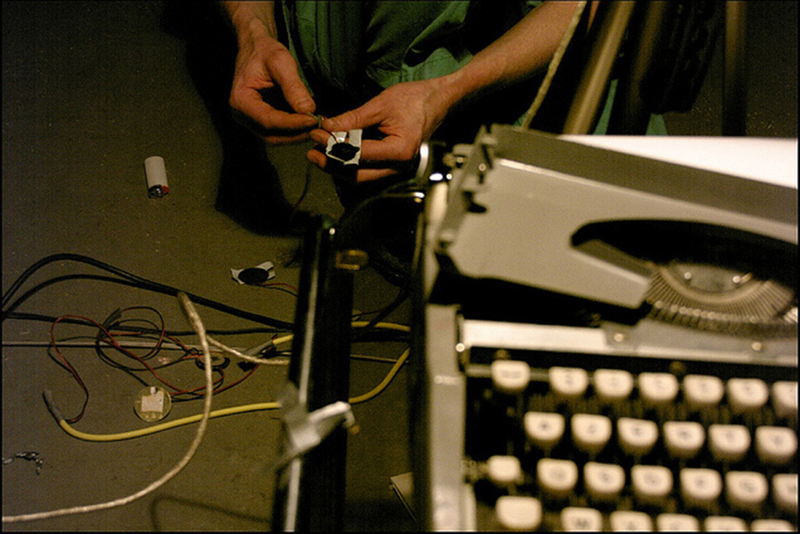 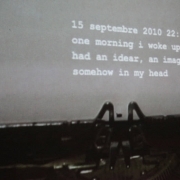 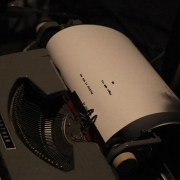 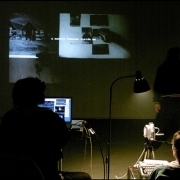 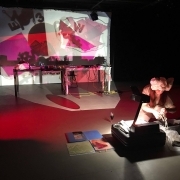 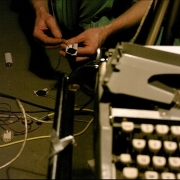 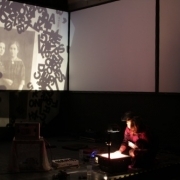 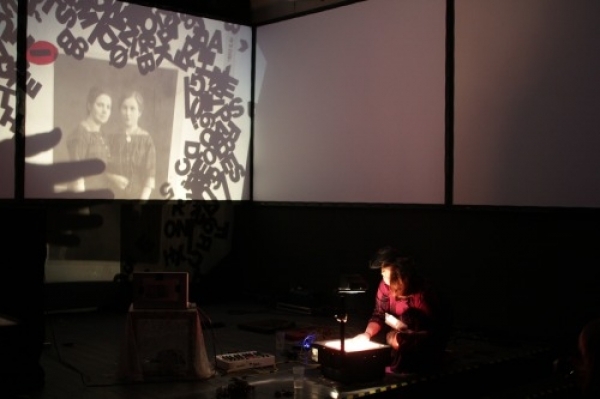 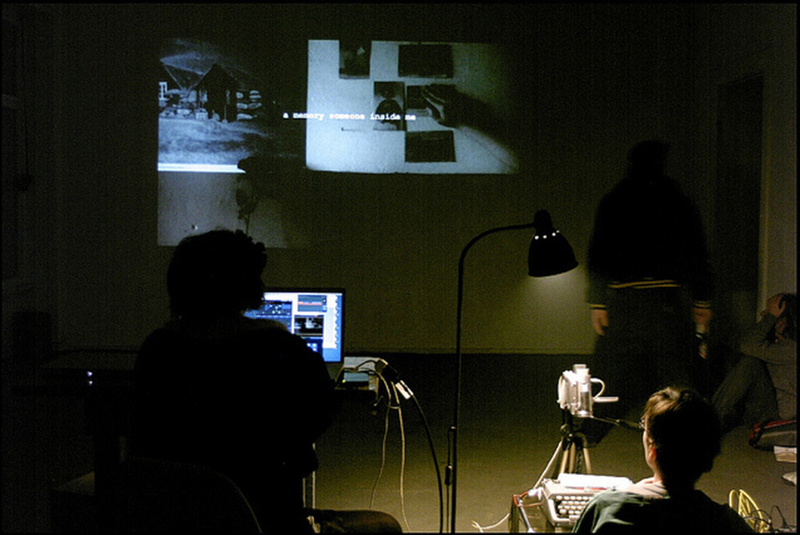 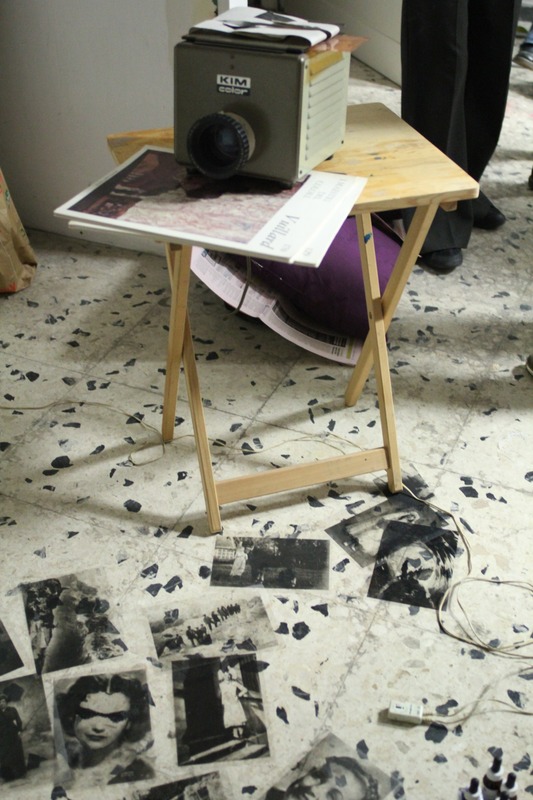 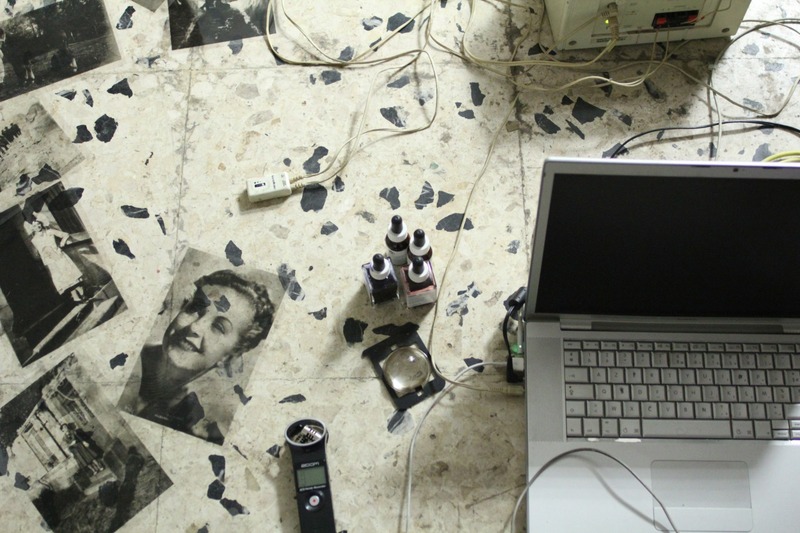 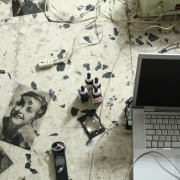 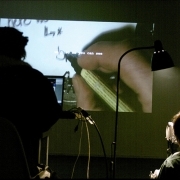 A floating narration, a dialogue between a men and a women, a typewriter and a computer, telling about impossibility to understand or communicate with the other. 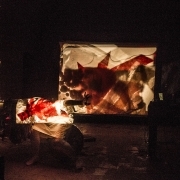 surrounded by a short movie shot in an abandonned berlin braurerei, two personnage, lost in a dream, surrounded by a decomposed environment, answering each other throught gesture and improvised action. 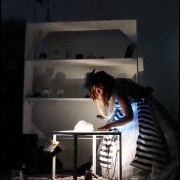 telling about the sadness of acting in inner desert, searching for an impossible perfection. 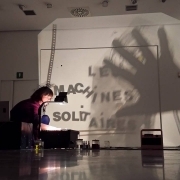 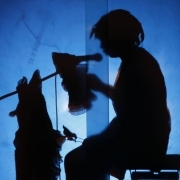 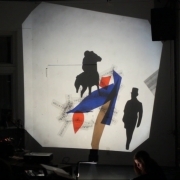 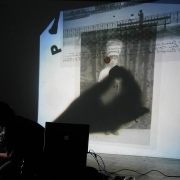 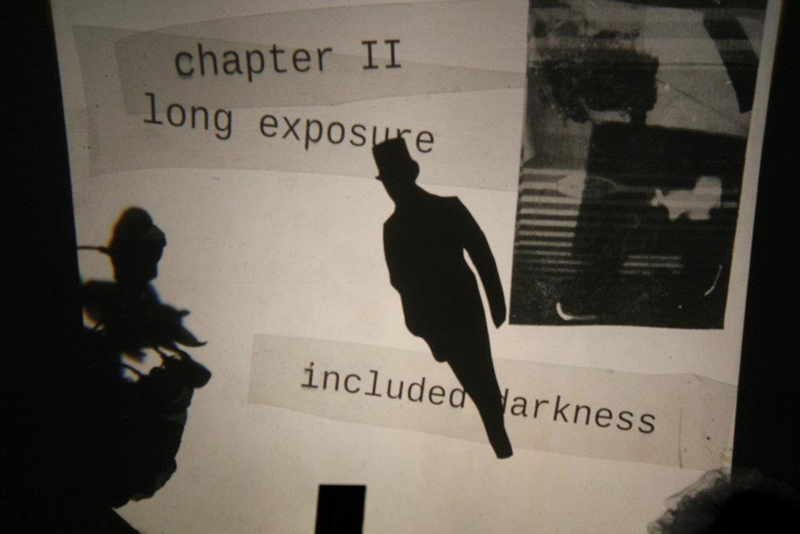 Shadow collage is an audiovisual performance completely generated in real time, developed by Aude François, video artist, Servando Barriero musician and programmer and Christian Sonntag, accordion player. 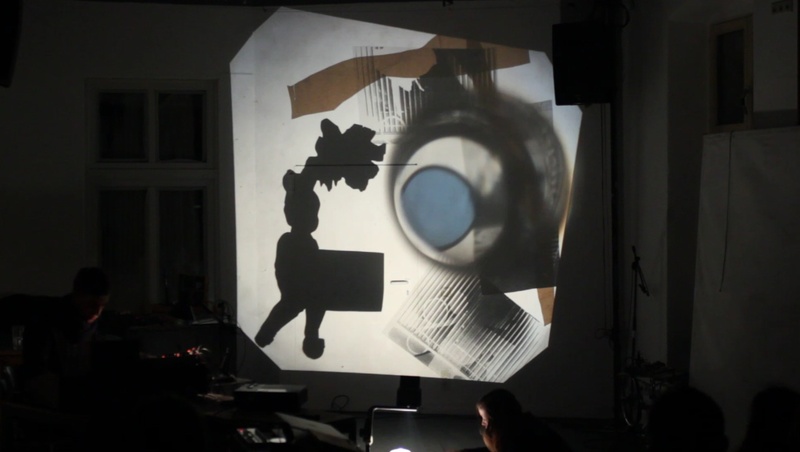 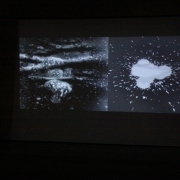 On a glass surface, covered with semi transparent paper, a webcam captures the video feedback, of series of illustrations manipulated, animated and sychronized to the sounds of the accordion (via a pure data patch). 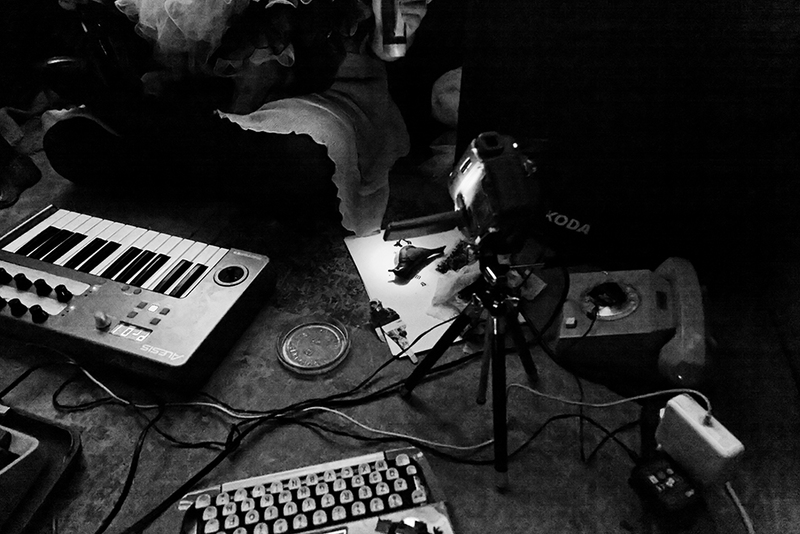 The instrument passes into audio filters, transforming the textures, combined with various atmospheres field recording. 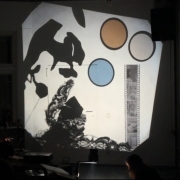 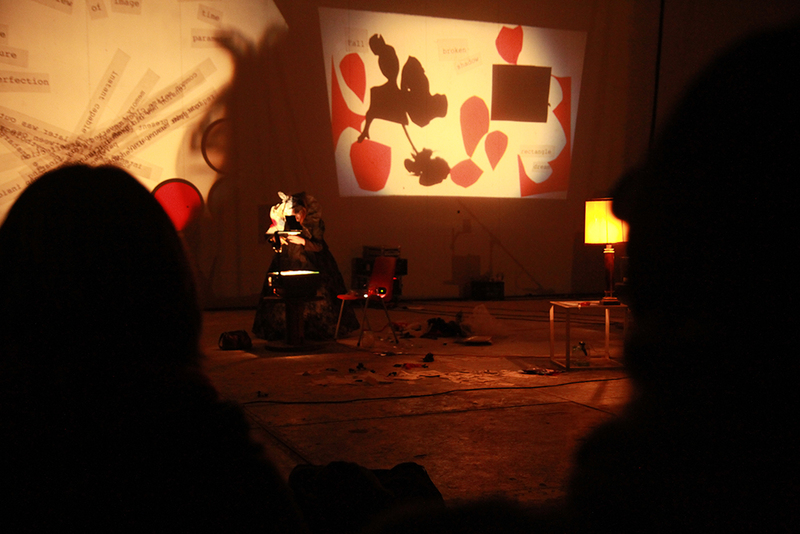 This performance transports the viewer in a visual game, a narration where figures, forms and textures experience an aesthetic metamorphosis.The piece articulates a corpus of differents illustrations extracted from children’s books, recomposed as animated paterns and forms. 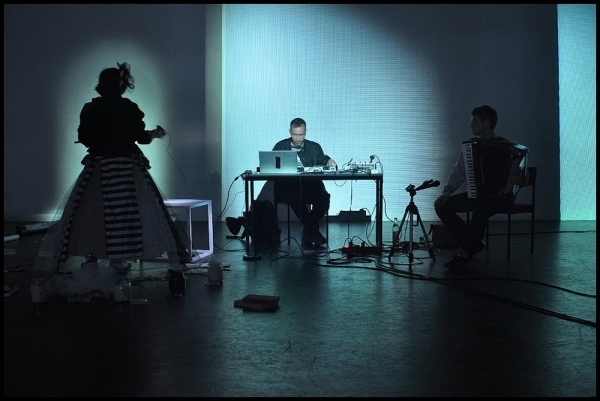 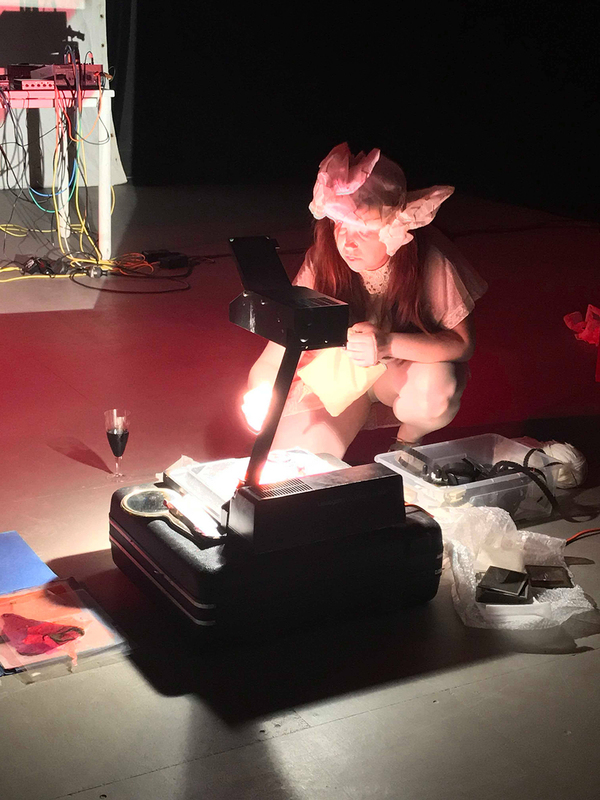 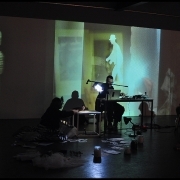 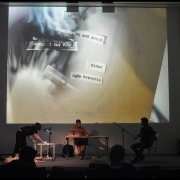 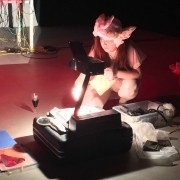 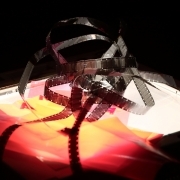 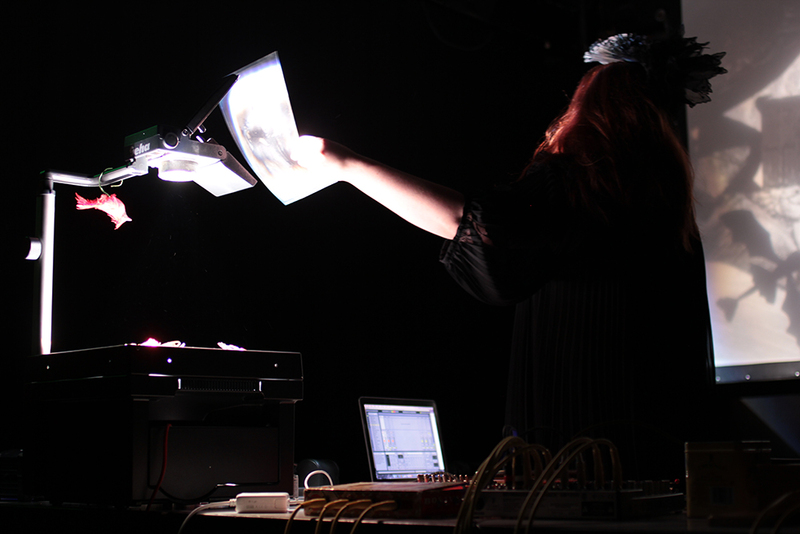 During 30 minutes the trio composes a video and sound performance generated in real time, combining acoustic and experimental atmosfere, searching to blur the reality of those pieces of paper strapped out of a book. 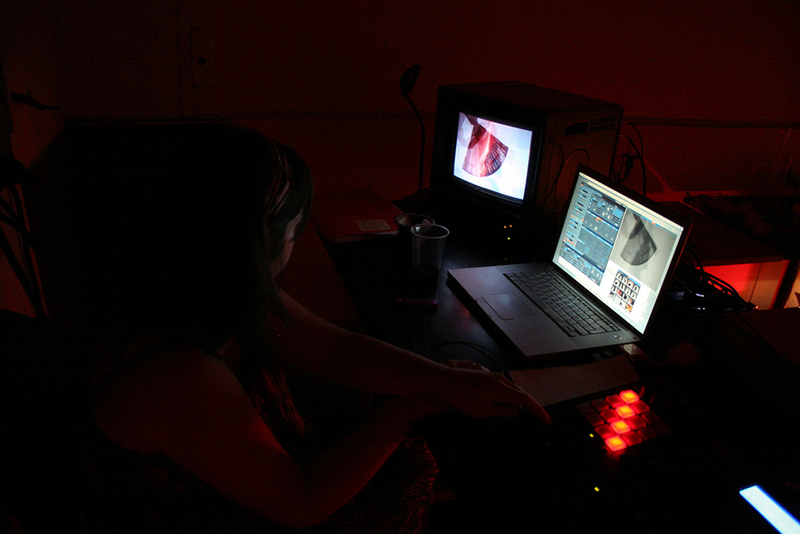 The interaction between the moving images and the sounds is processed via a synesthesia, analyzing the influence of the music on a real time feedback live video content. 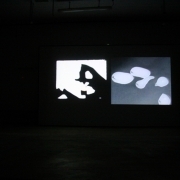 The illustrations turn into shadows articulated in a floatting story, abstracted from its original context, transforming the prints into mooving images and paterns, leaving the maniplulation process visible to the viewer. 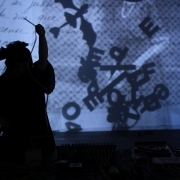 Through a narrative weft punctuated of fragments of words spread into a floating narration.This project is a performed with video, acoustic and electronic live instruments. In a dreamy soundscape two alto, machines and noises, try to illustrate the unbearable lightness of the body confronted to its own finitude.